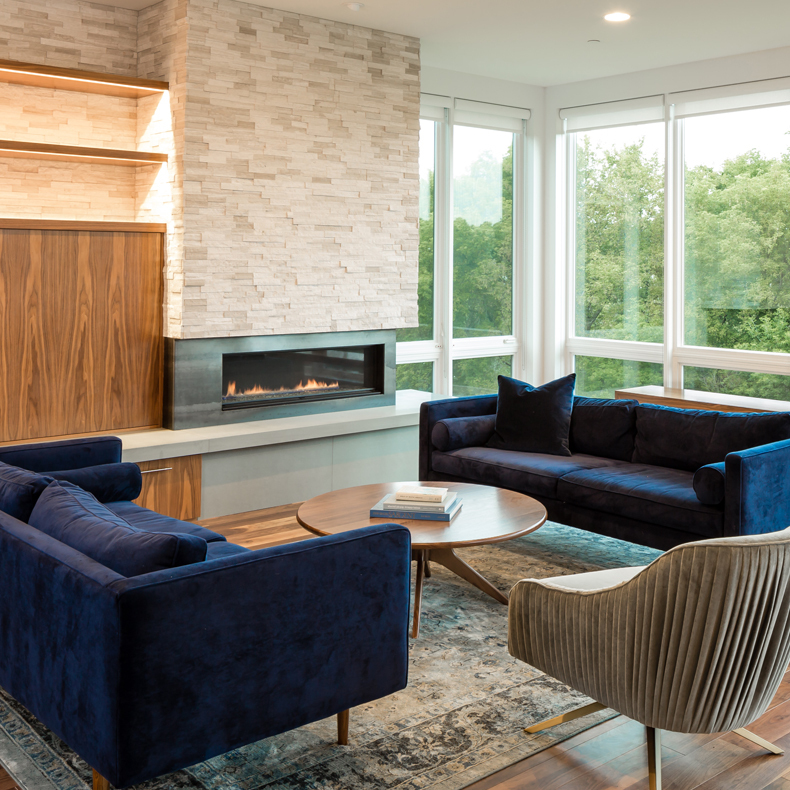 Working with our client our goal was to create a cozy and inviting space even though the scale of the area was very large. 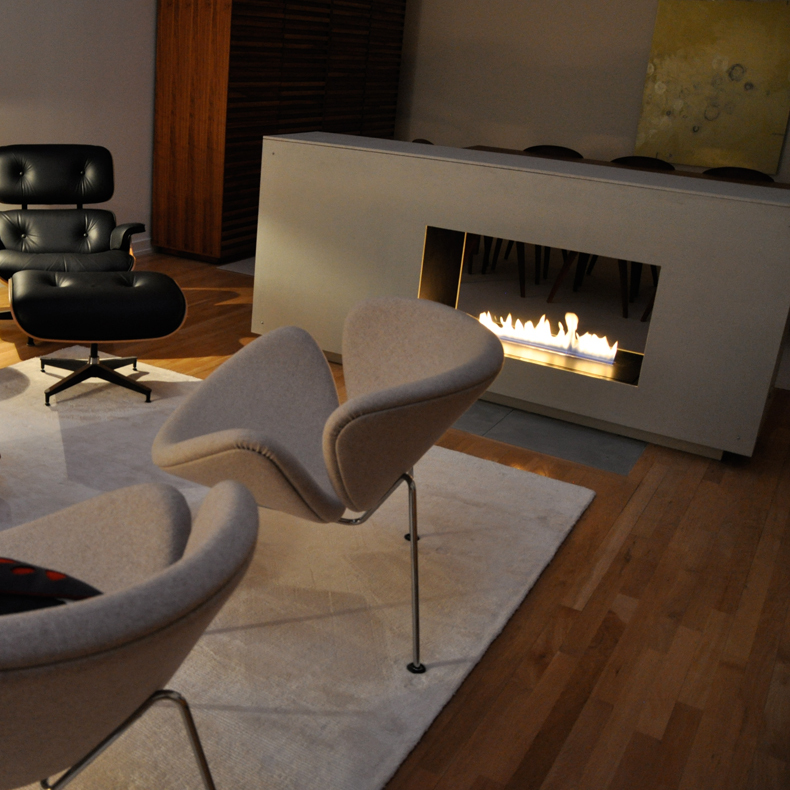 The fireplace was one of the first things we selected. 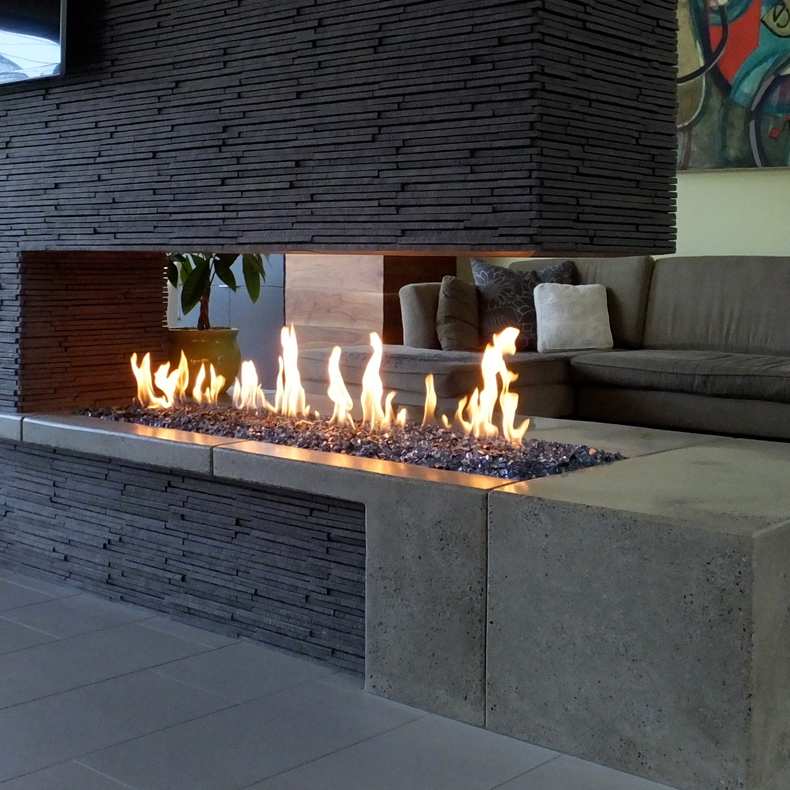 Then we brought some texture to the wall by installing raw blackened steel plates and created the necessary depth for the Fire Ribbon vent Free 4ft installation. 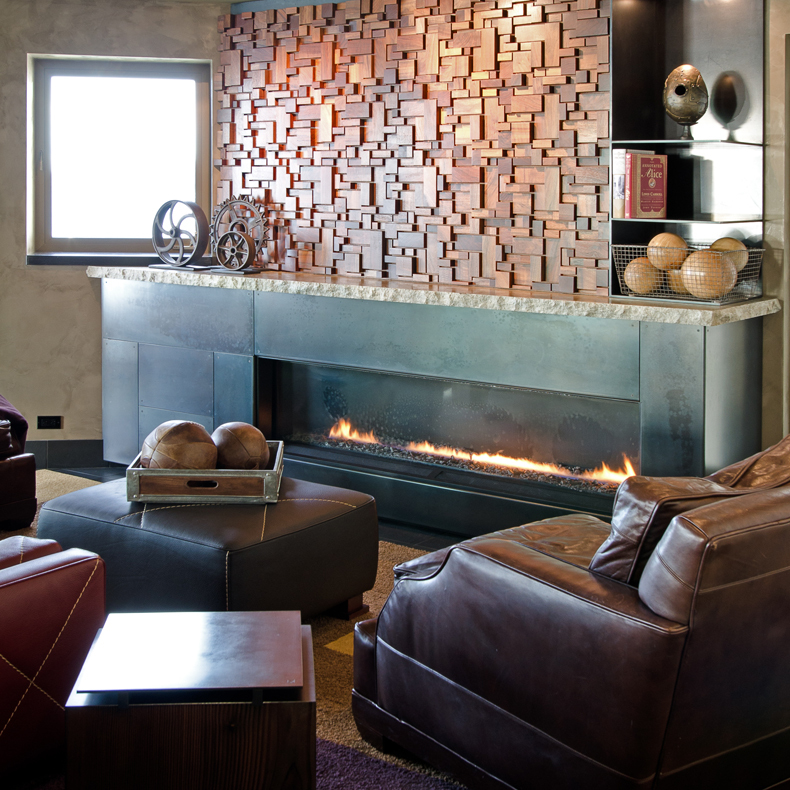 Since the wall was so long we created boxes on each side to mimic the Spark box, giving the illusion that it was longer. 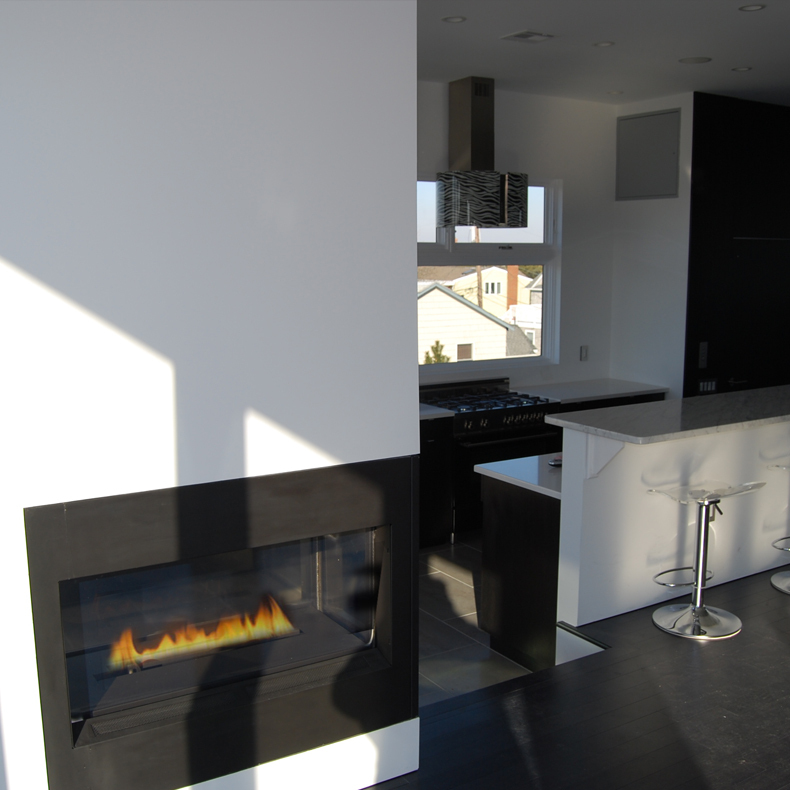 The fireplace ended not only becoming the focal point of the whole living area but the dining room and kitchen areas too. 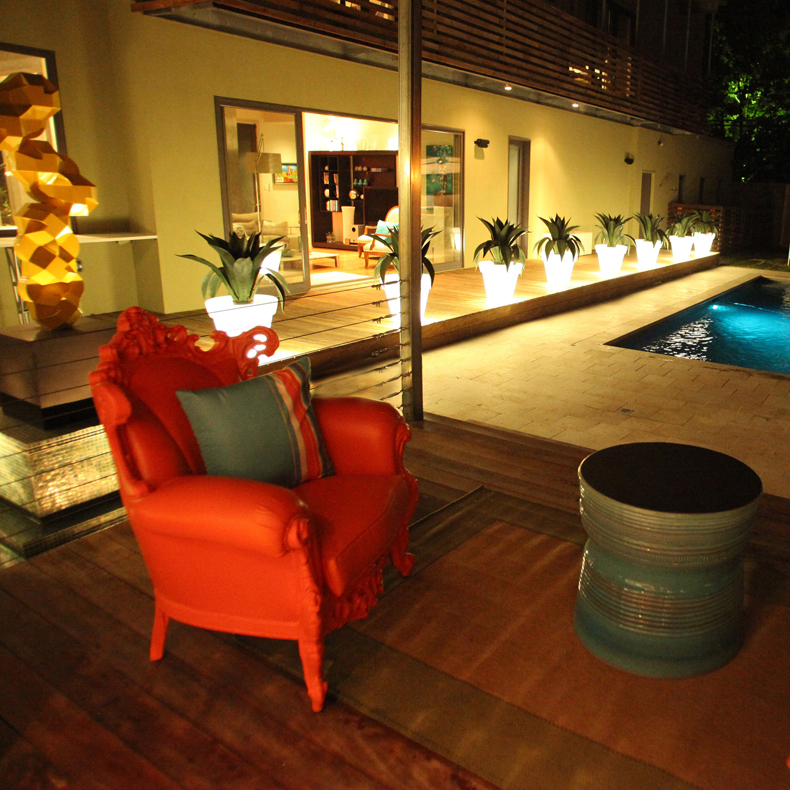 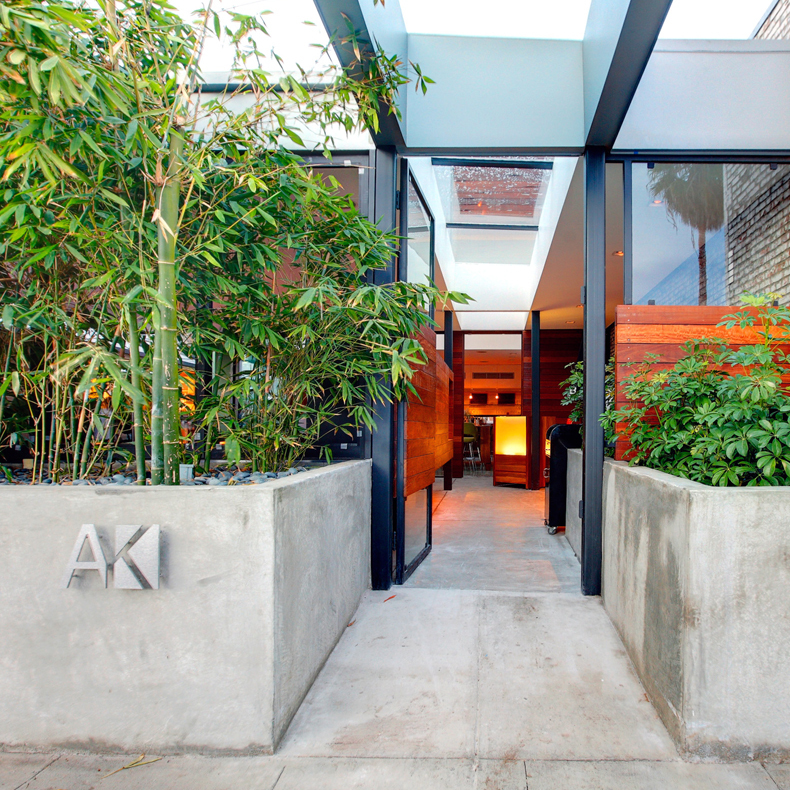 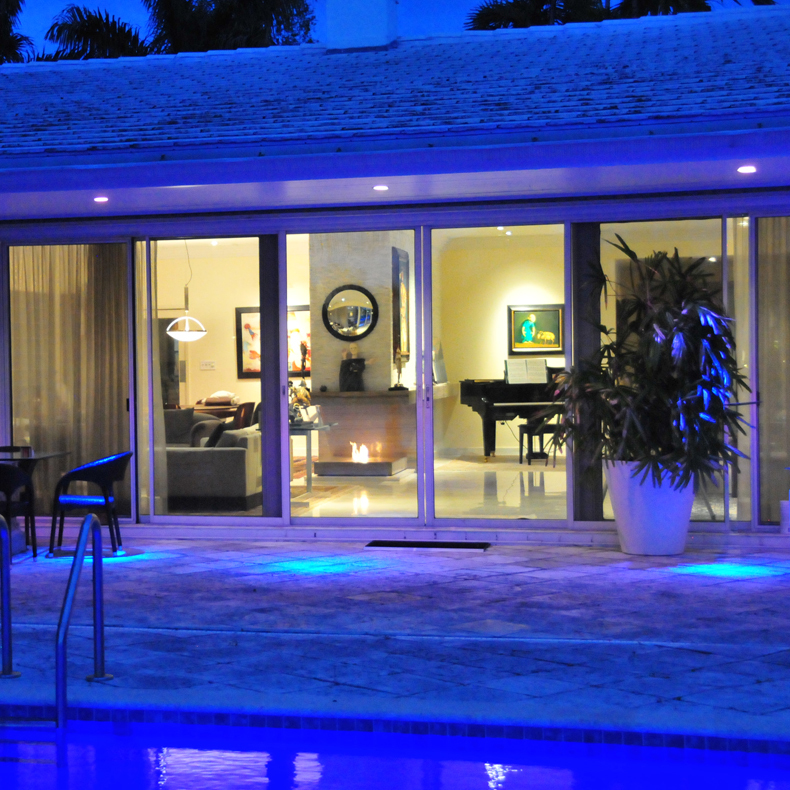 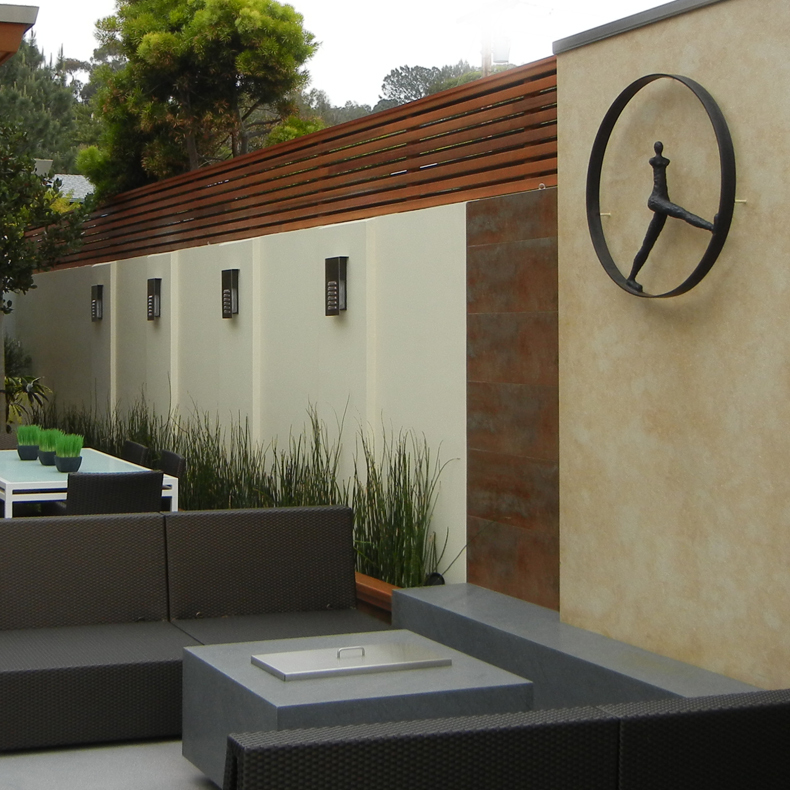 Our client was looking to us to create an outdoor environment with the feeling of a room. 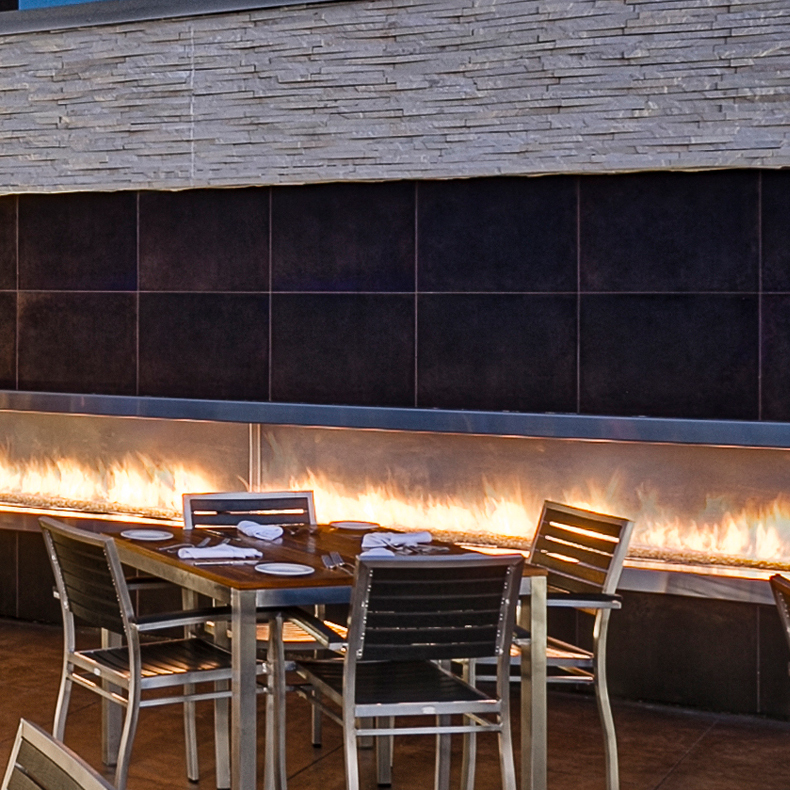 We incorporated a Spark Fire Ribbon Outdoor 4 ft to a stone veneer wall with attached cooking area. 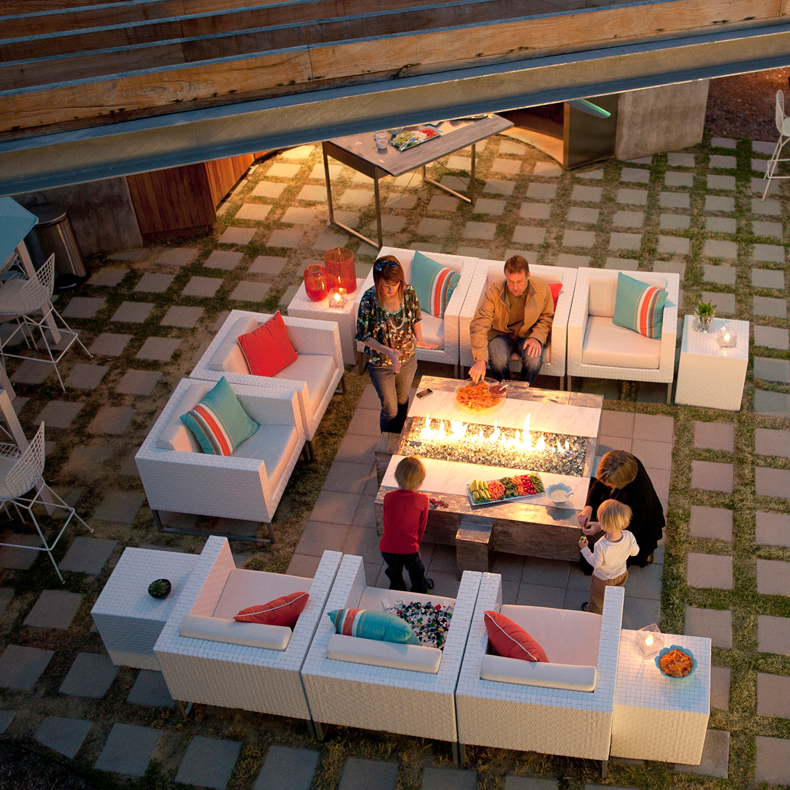 The result is an inspirational backdrop to their out door living. 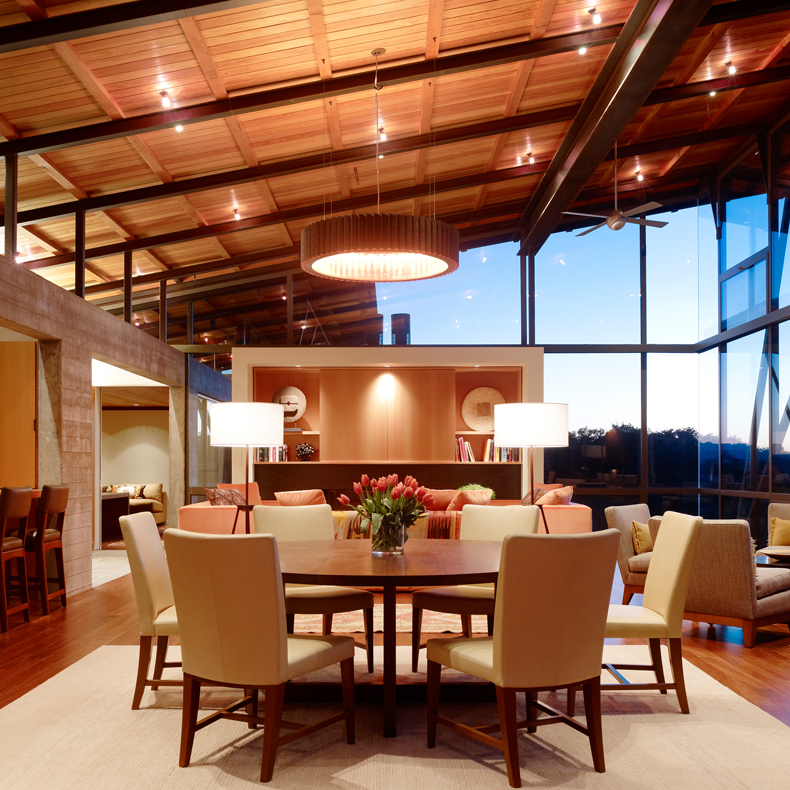 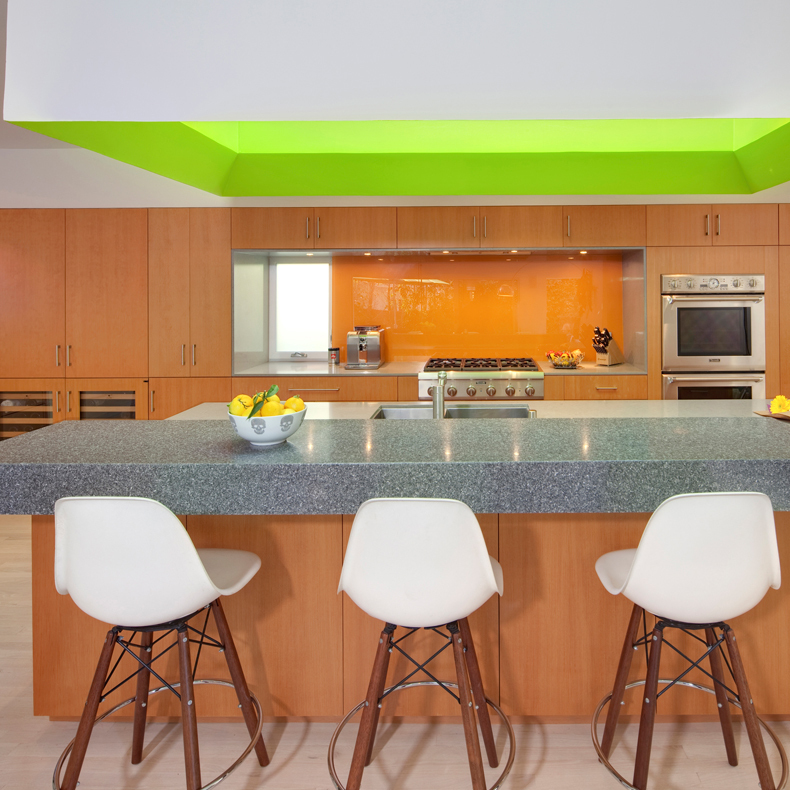 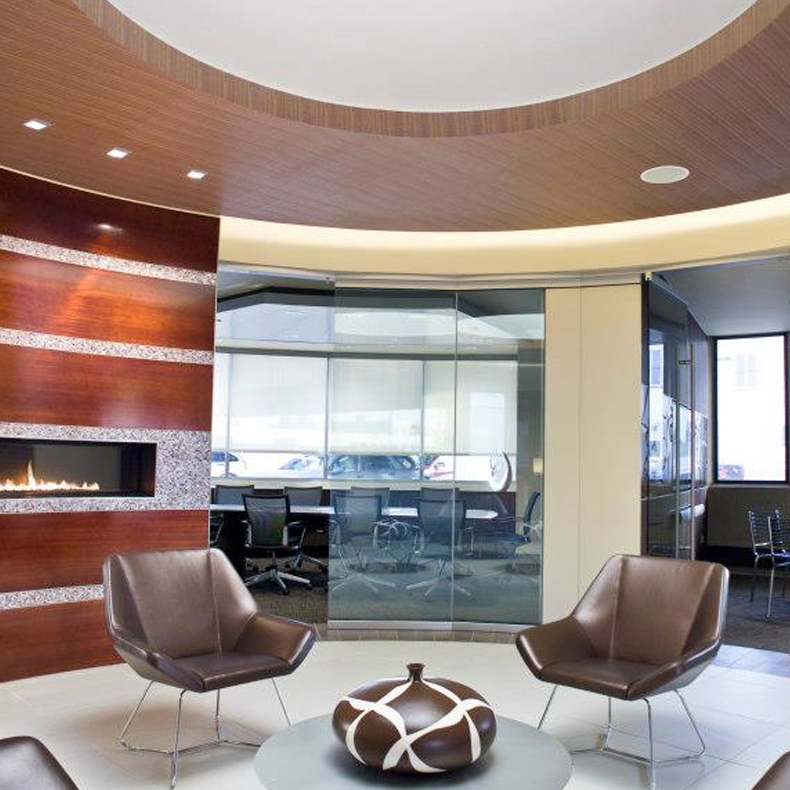 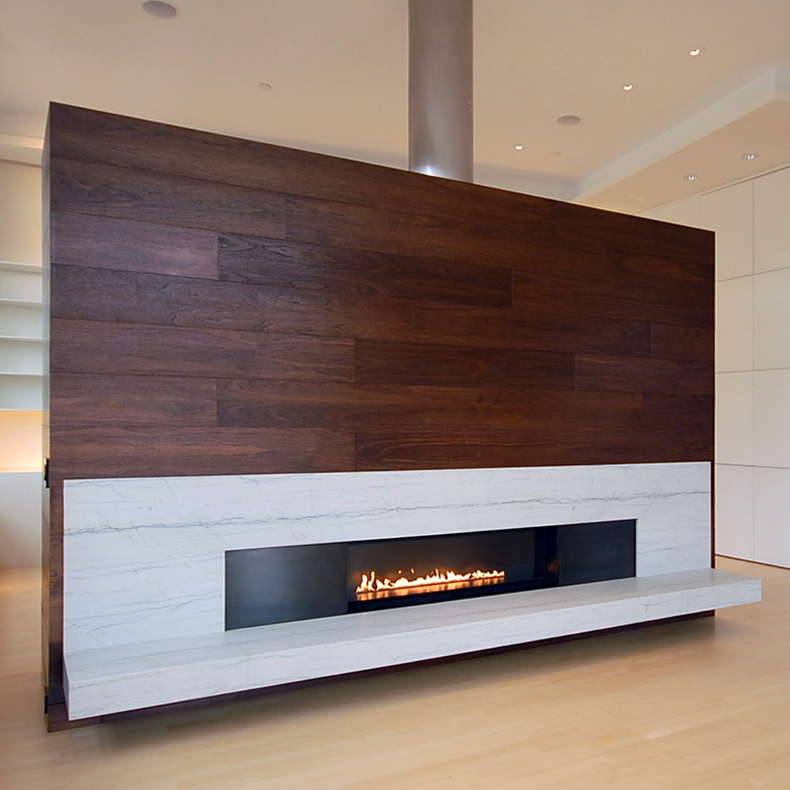 Refined materials and minimalist detailing transformed the existing space to reflect the client’s contemporary style. 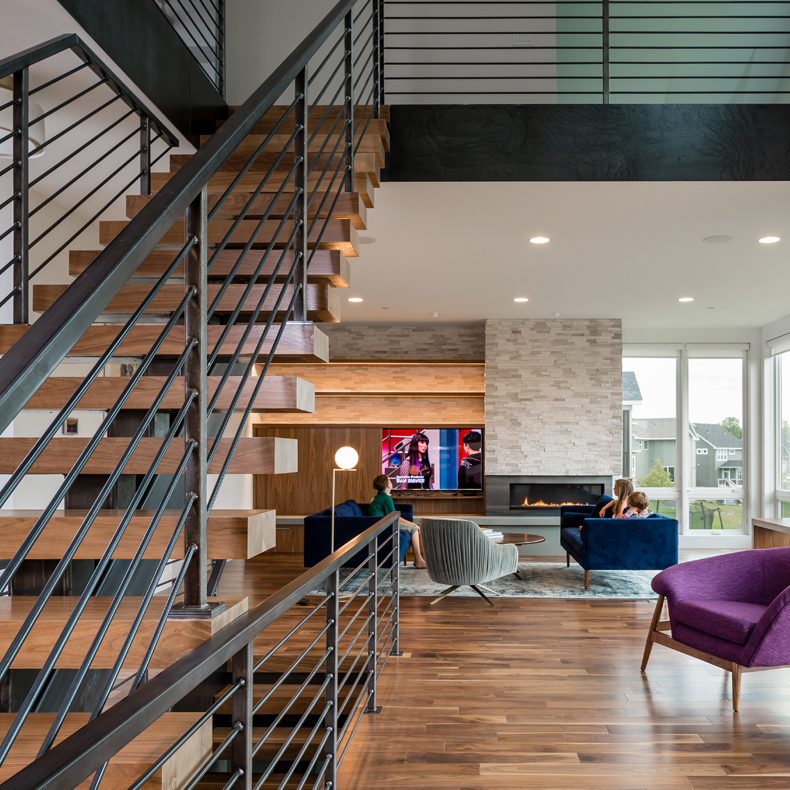 In the main living area the two-story space was dramatized by a 20 foot tall paneled wall, shop painted in white piano finished lacquer. 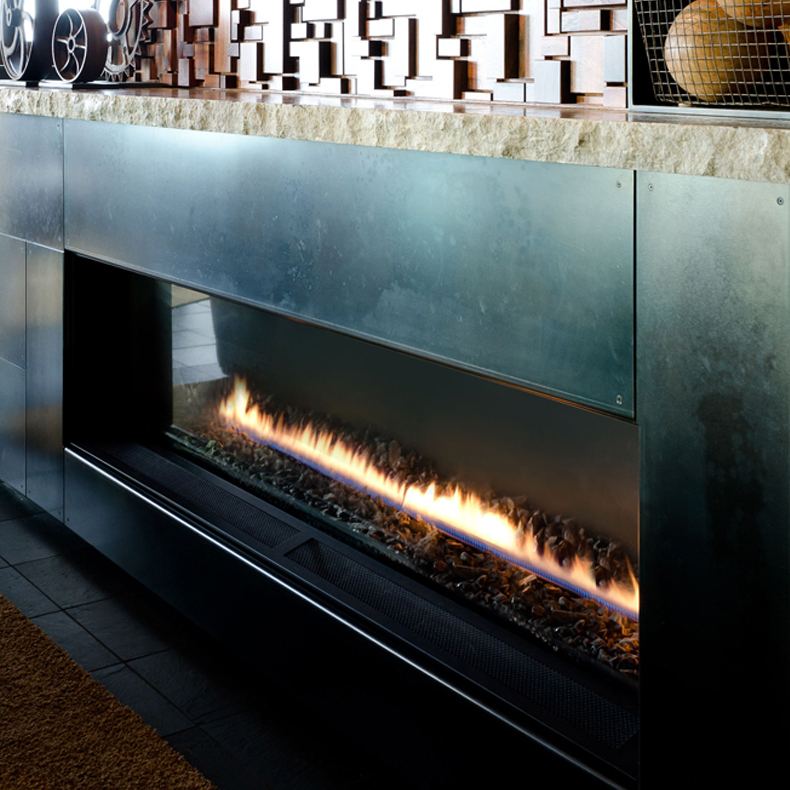 At the feature walls base, a band of antique bronze colored metal frames a 6’ Spark Direct Vent Fire Ribbon, providing the physical comfort of heat and the visual animation/ focus to the social entertaining area. 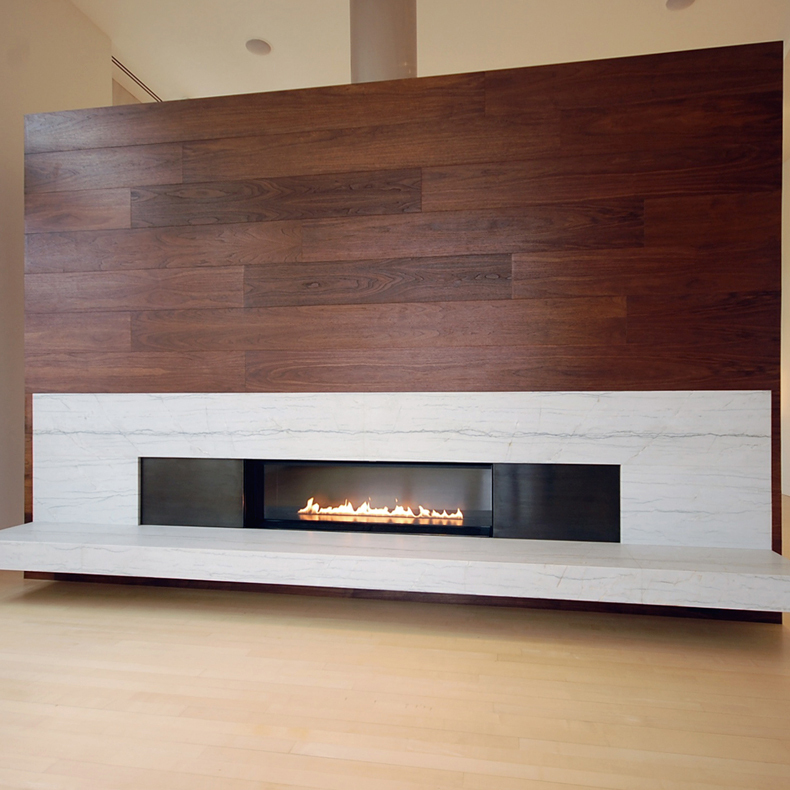 An additional horizontal band of honed white marble was cantilevered over the ebony stained oak flooring. 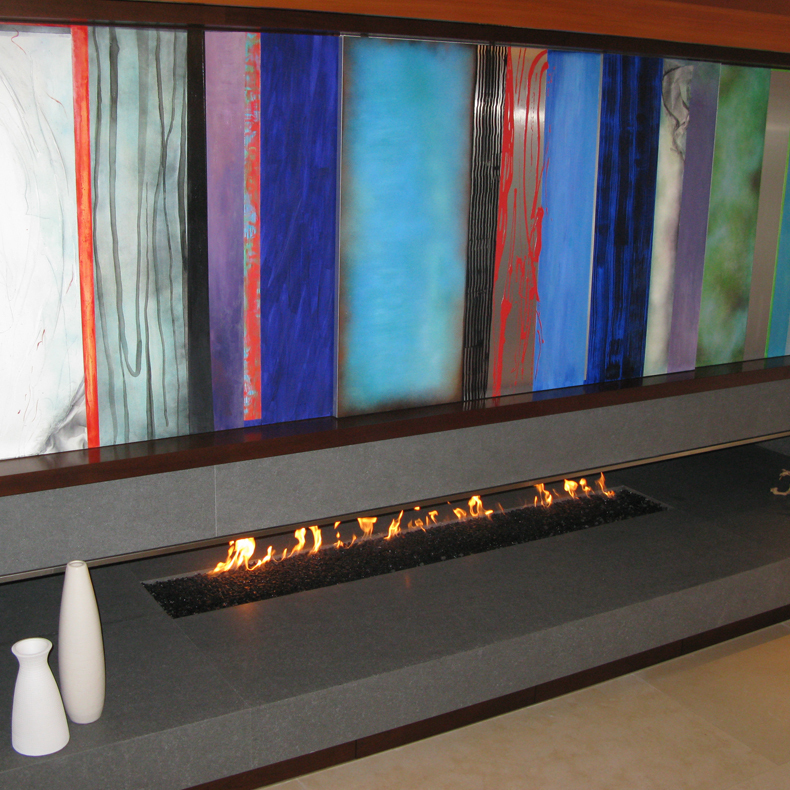 A continuous LED light strip was added below the floating marble band to highlight the depth of the wall. 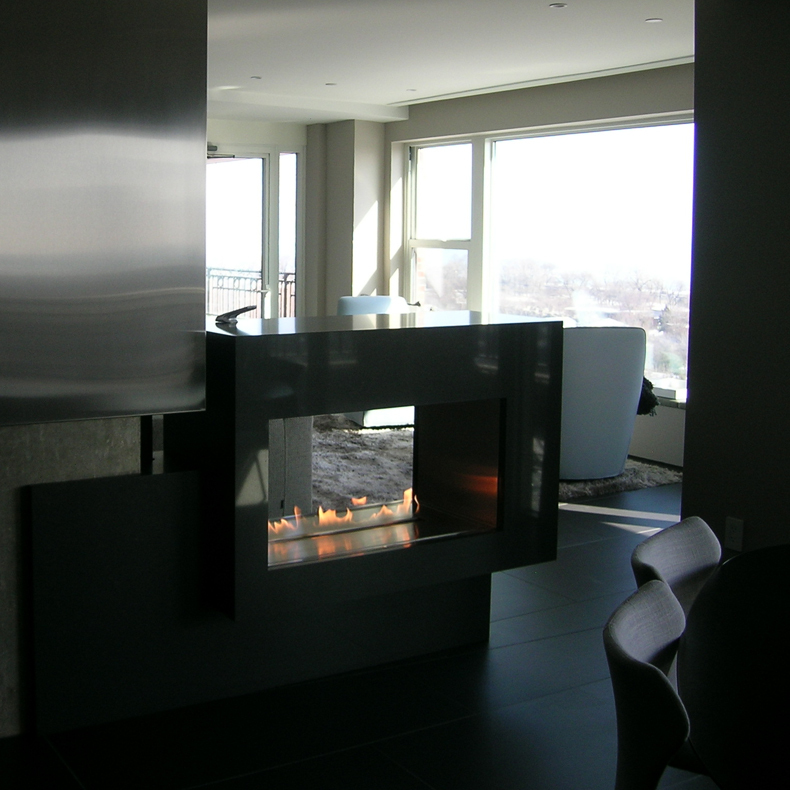 This architectural composition successfully dramatizes the scale of the space and is enlivened by the elegant Spark Fire. 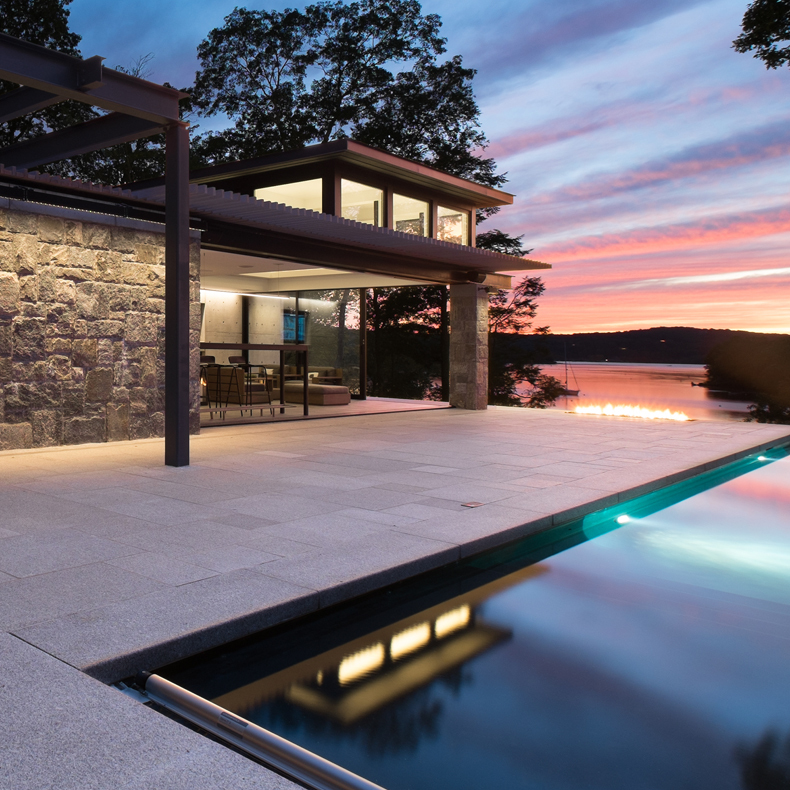 This modern pool house and infinity edge pool share sunset views across the waters of a beautiful cove in southeastern Connecticut. 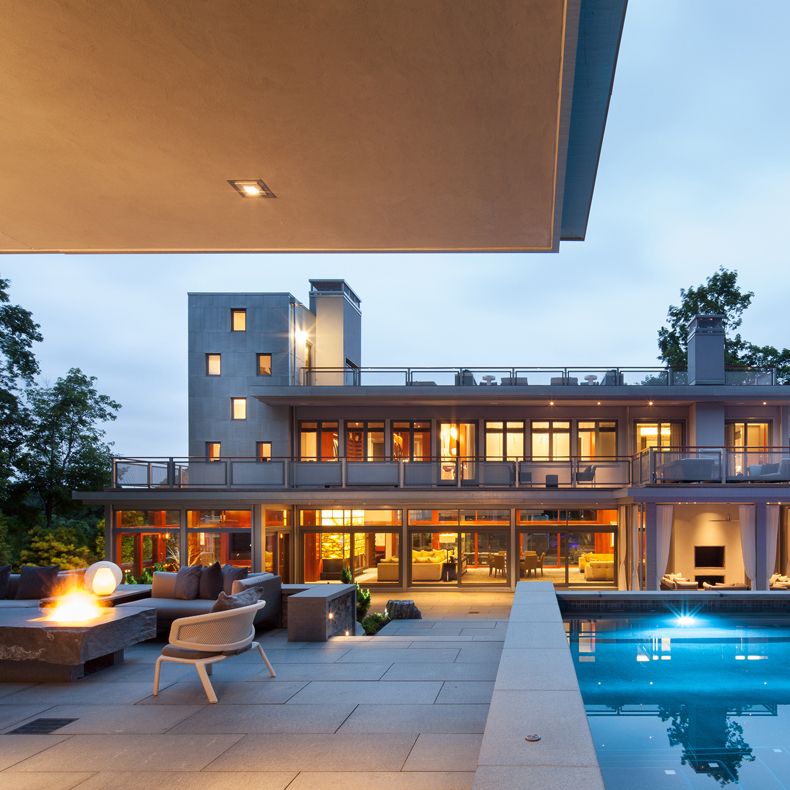 The pool house avoids conventional construction methods and materials and instead uses architectural concrete, steel, and glass as the finishes. 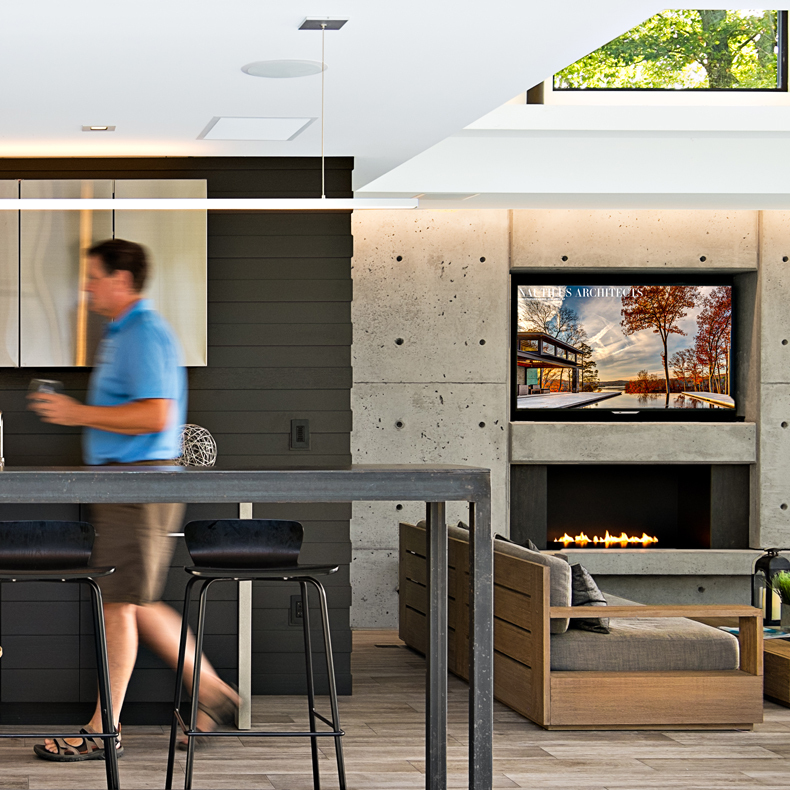 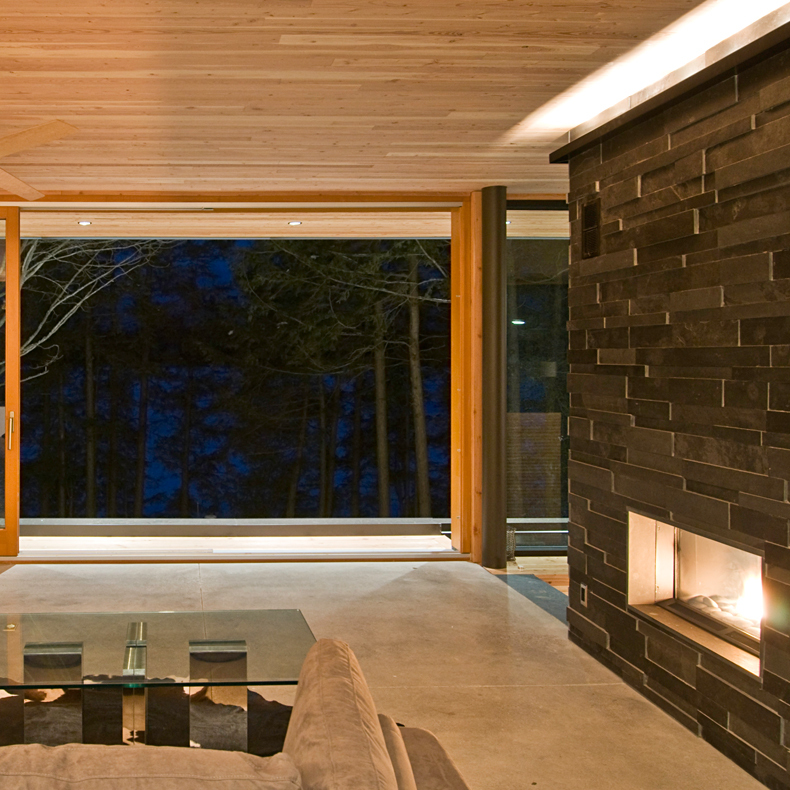 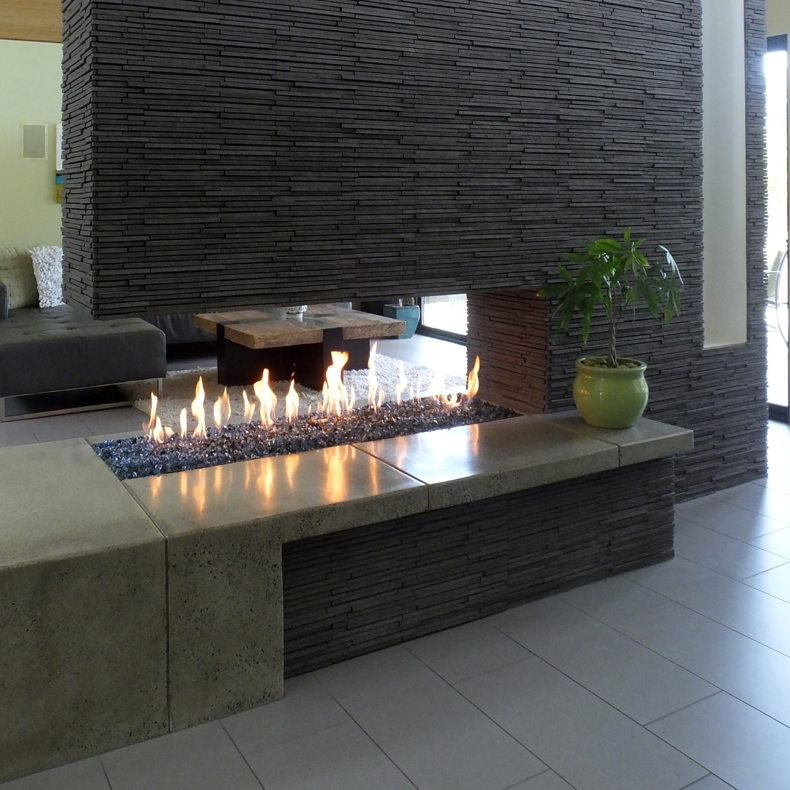 The indoor fireplace is situated in a cast-in-place concrete wall created using veneer plywood forms. 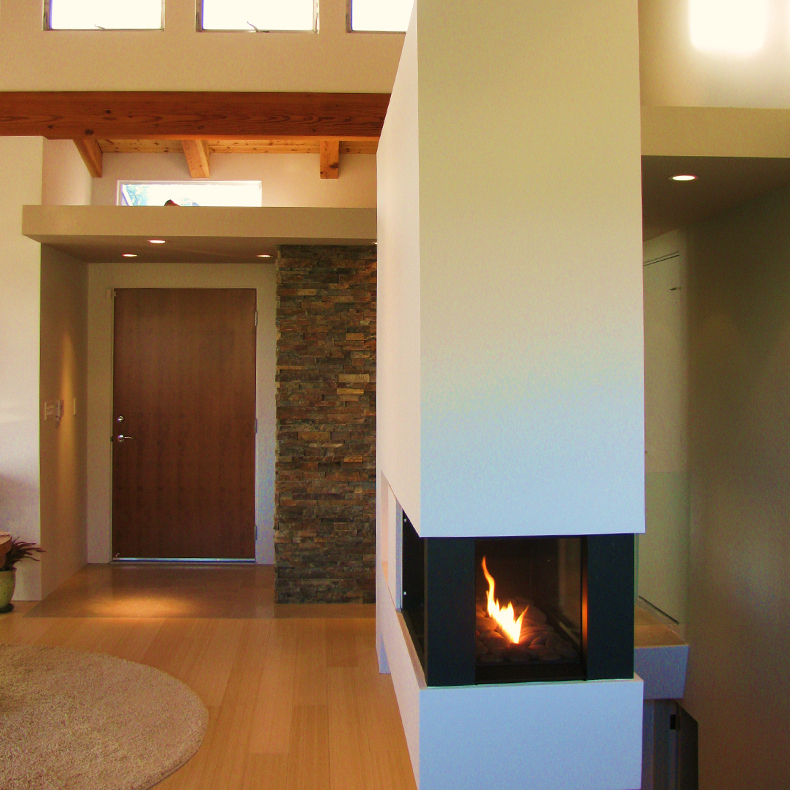 The hearth was precast and lifted into place. 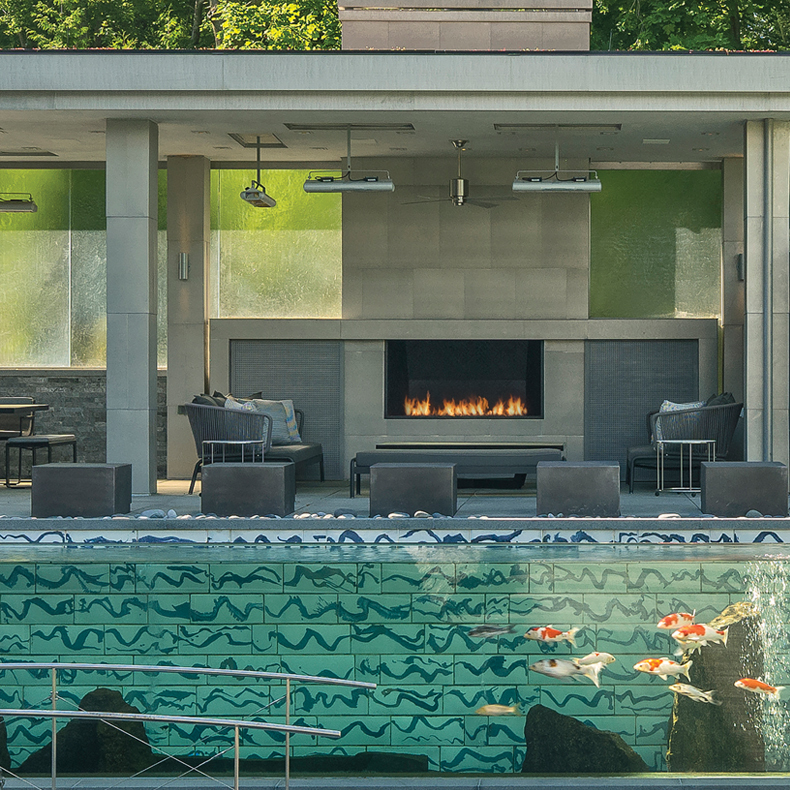 Outside, the Linear Burner System is positioned right at the edge of the terrace, as a similar treatment to the infinity edge pool. 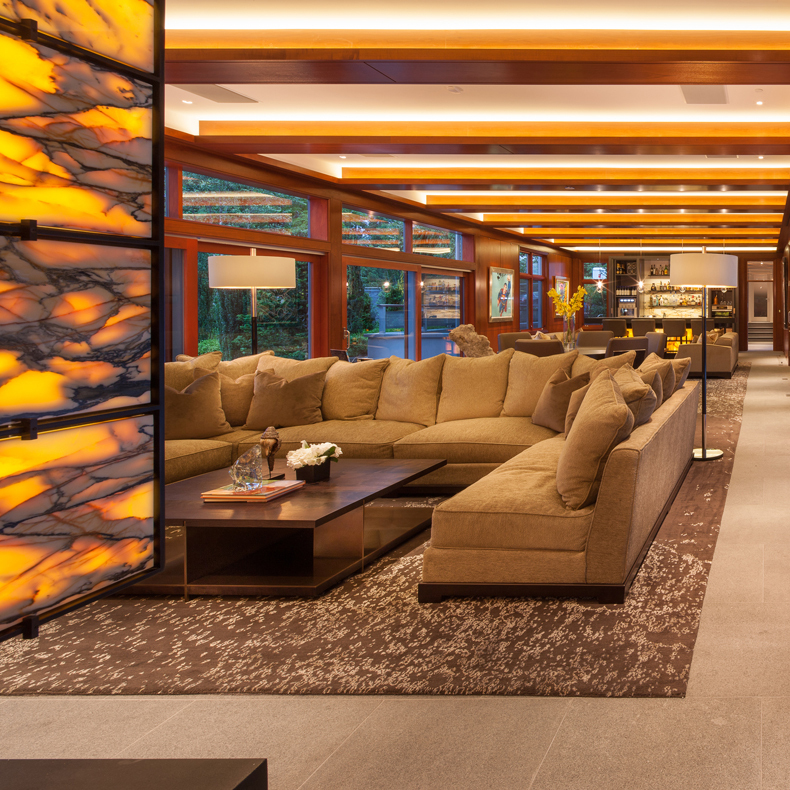 The linear fires link to the brilliant reds and oranges of the sunsets that grace this special property throughout the year. 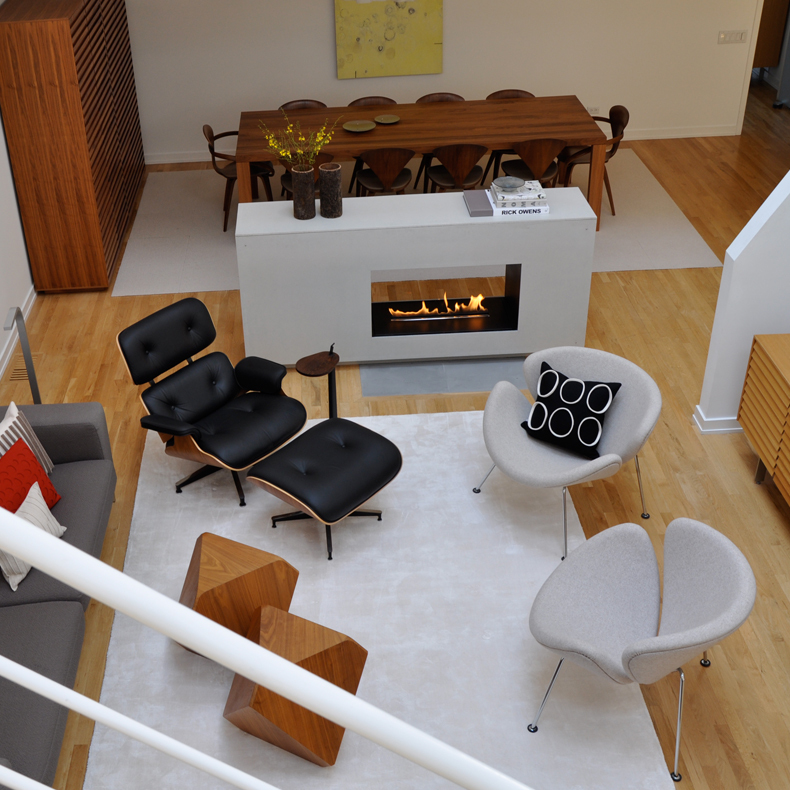 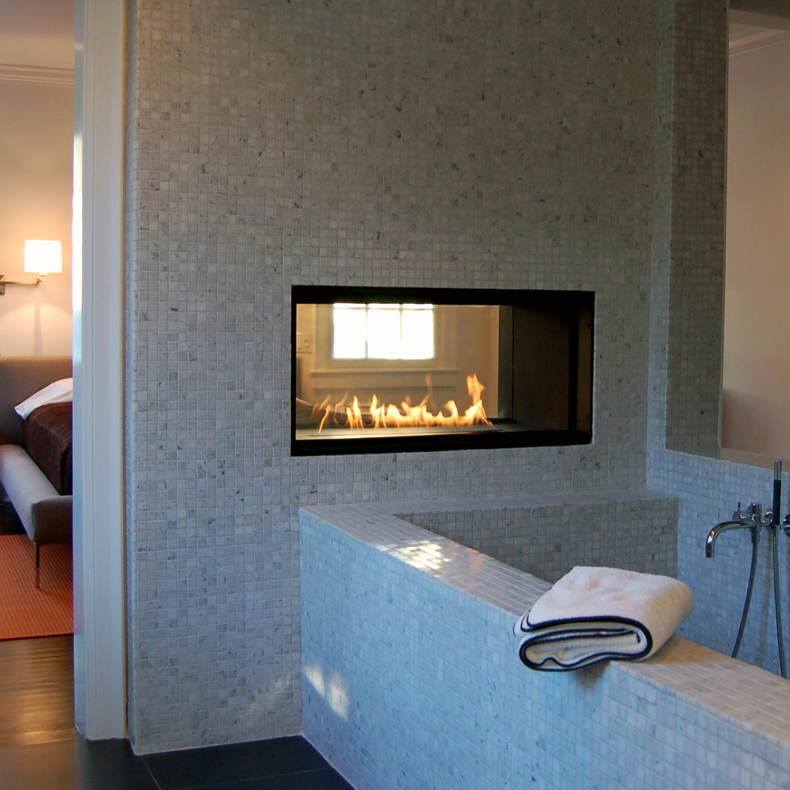 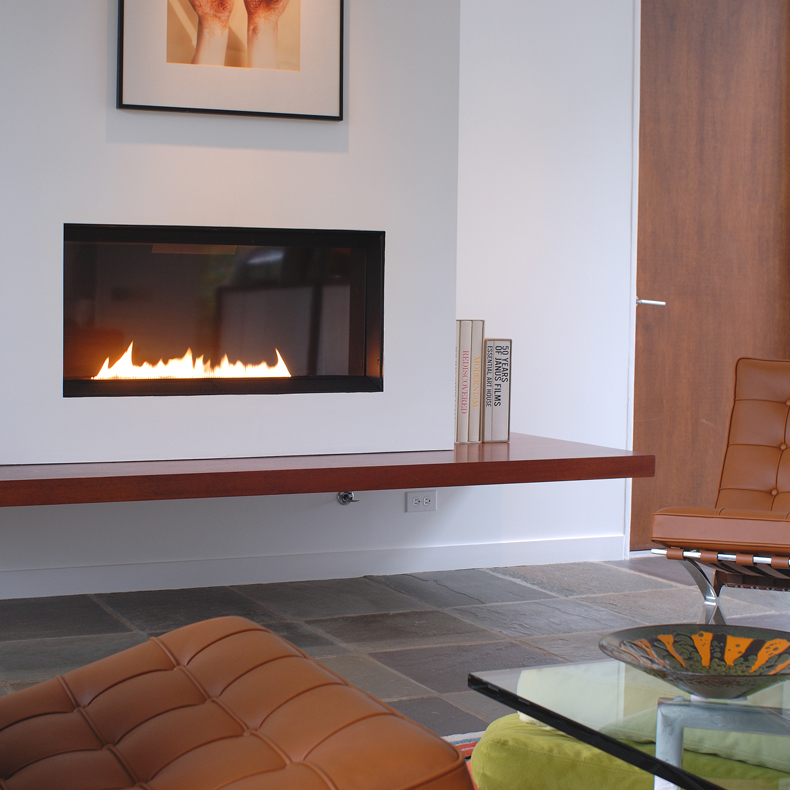 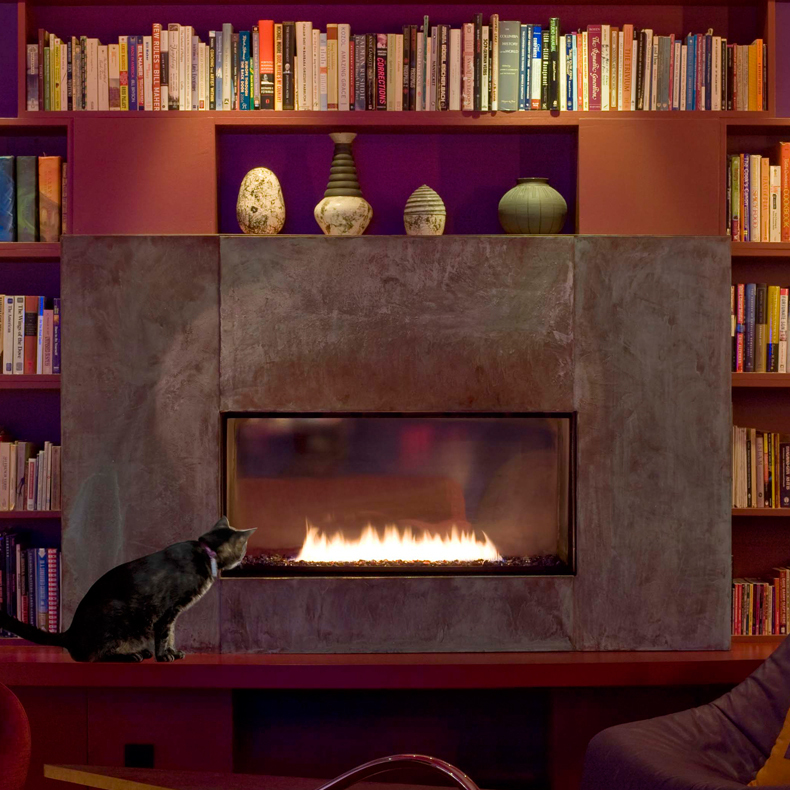 We choose Spark Fires for the project because the fireplace was the icon of the space. 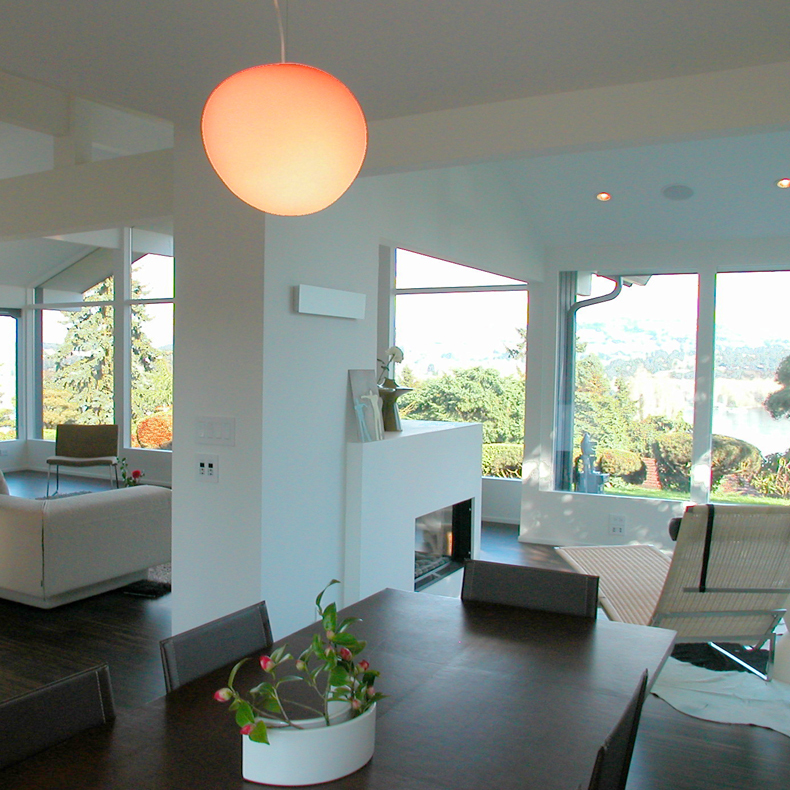 The house is very open and modern. 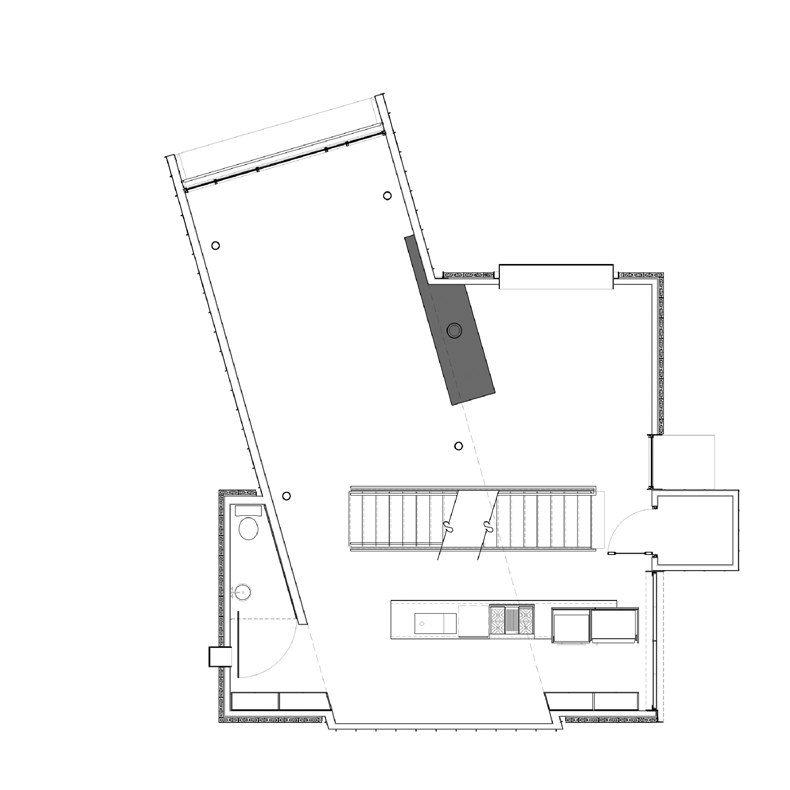 Each space is interconnected to the next. 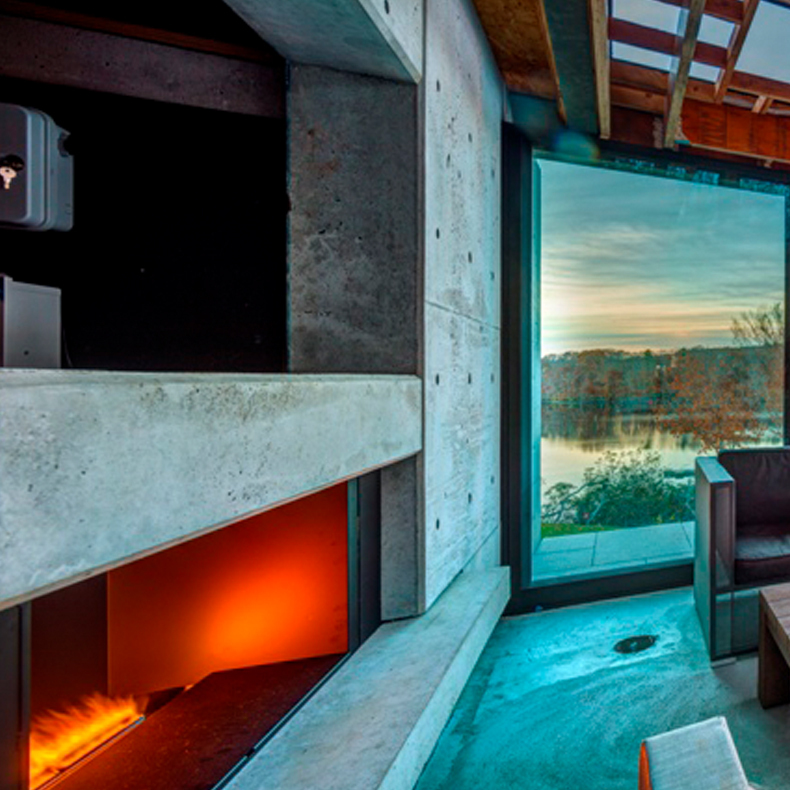 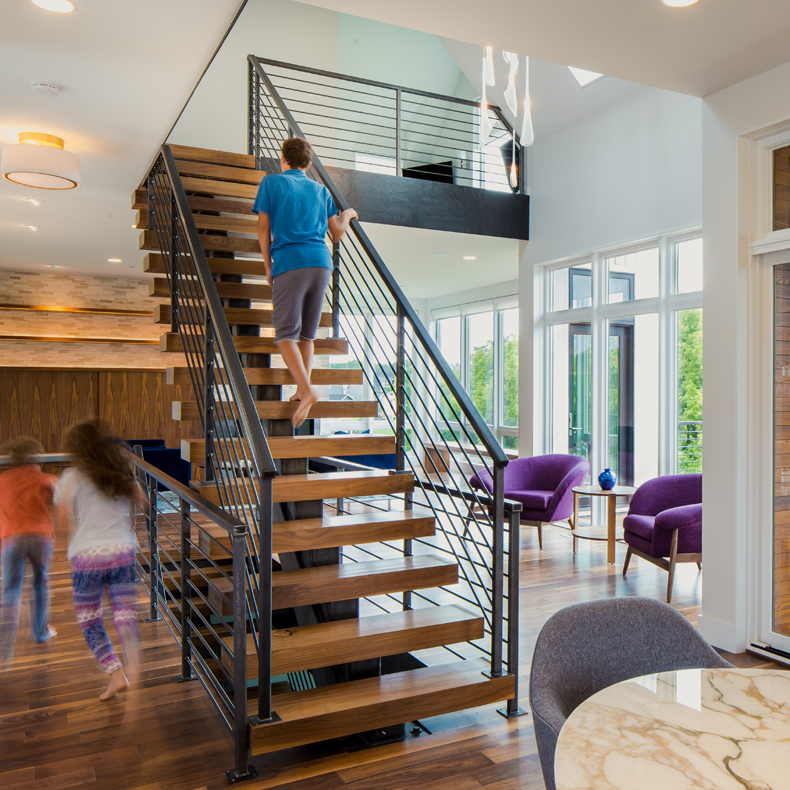 The Spark Fire anchors the main floor and draws your eye through the open stair to the fire and then out to the views of the Minnesota River Valley. 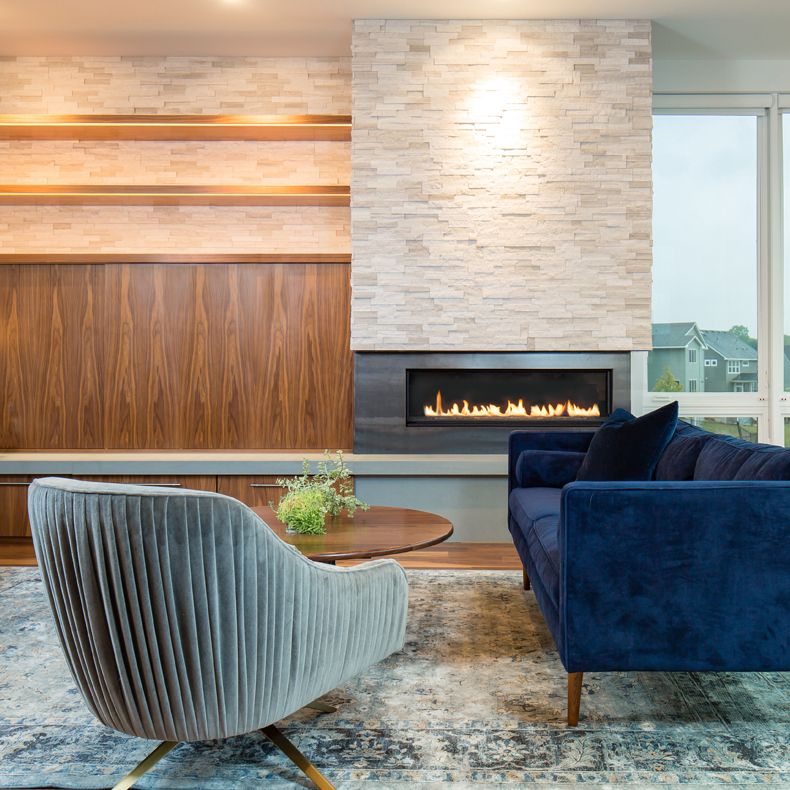 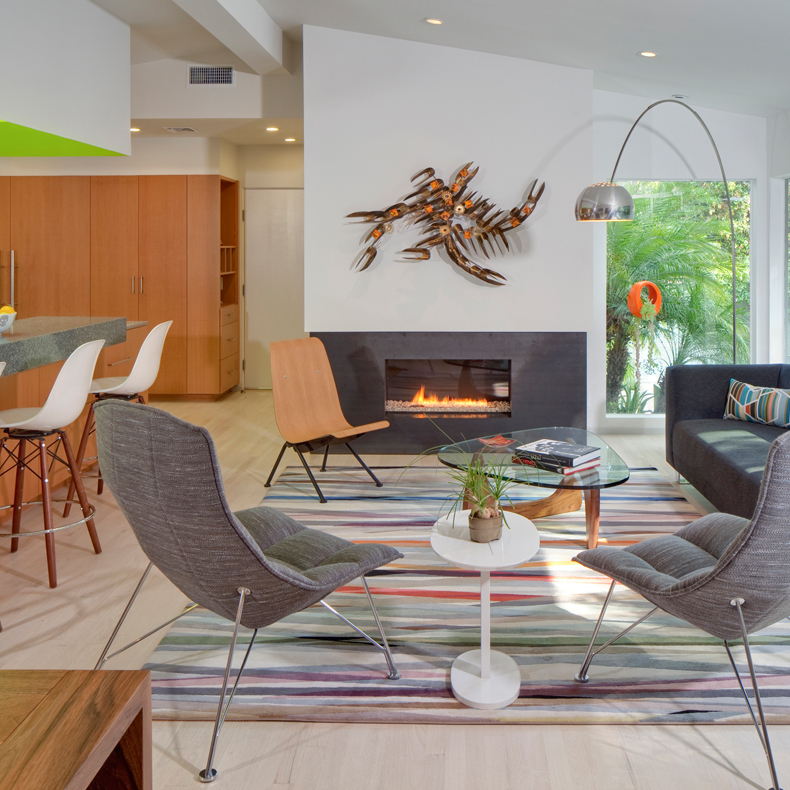 The Fire Ribbon captures your attention and creates a cozy living room for this family to gather to connect after busy days. 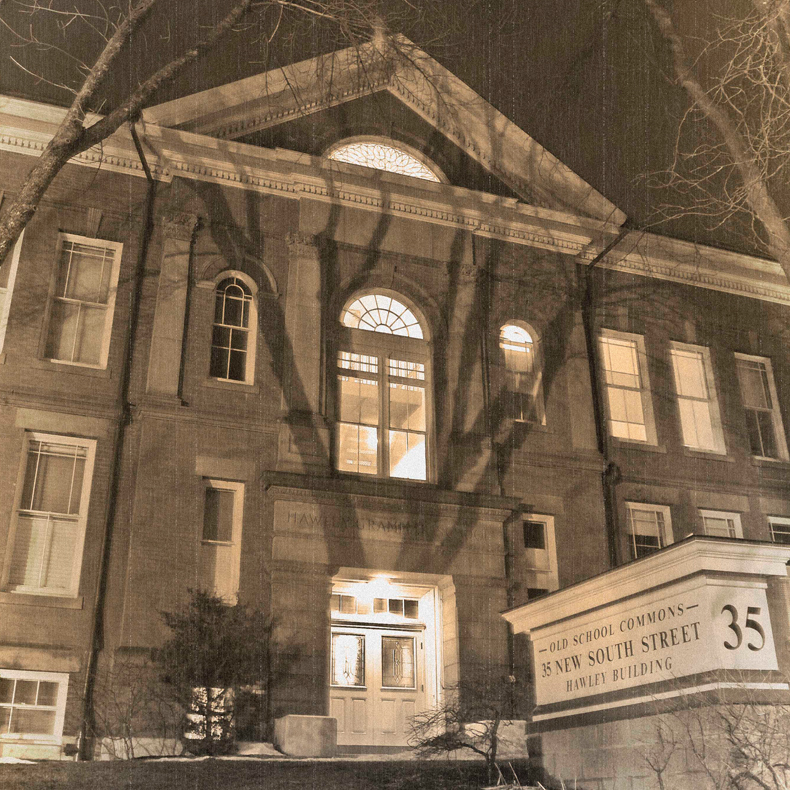 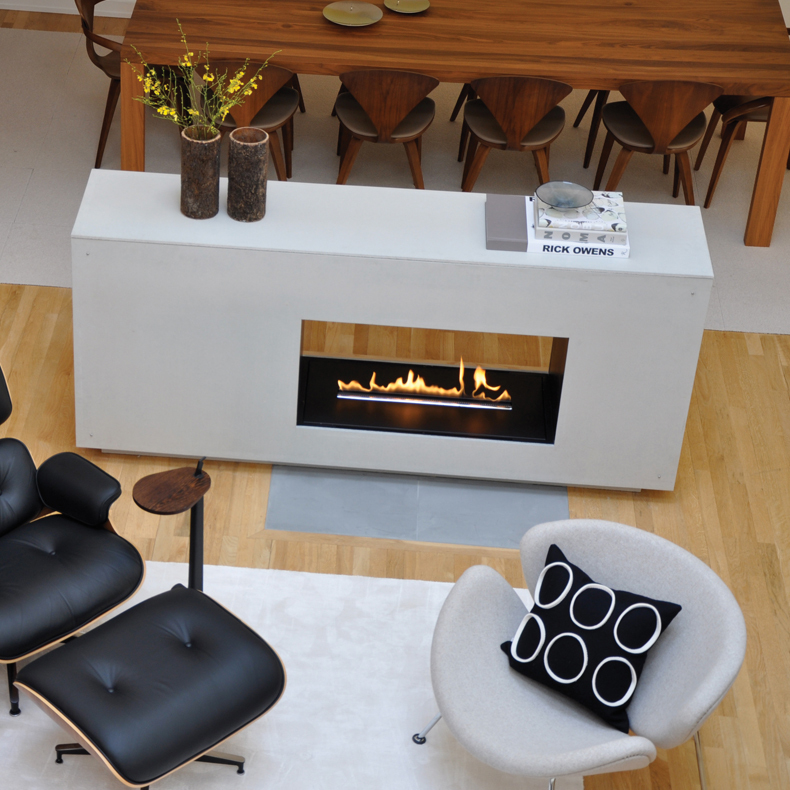 The long clean lines of the fire were pivotal in connecting the living space to the atrium. 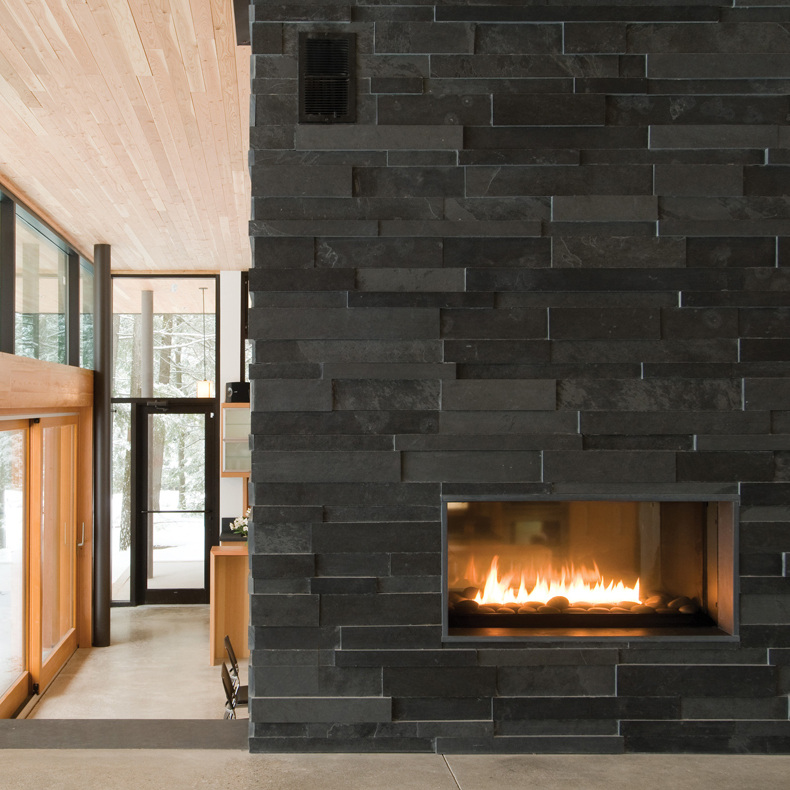 The hearth is cantilevered out from the fireplace and floats past the firebox that makes gathering next to the fire even more compelling. 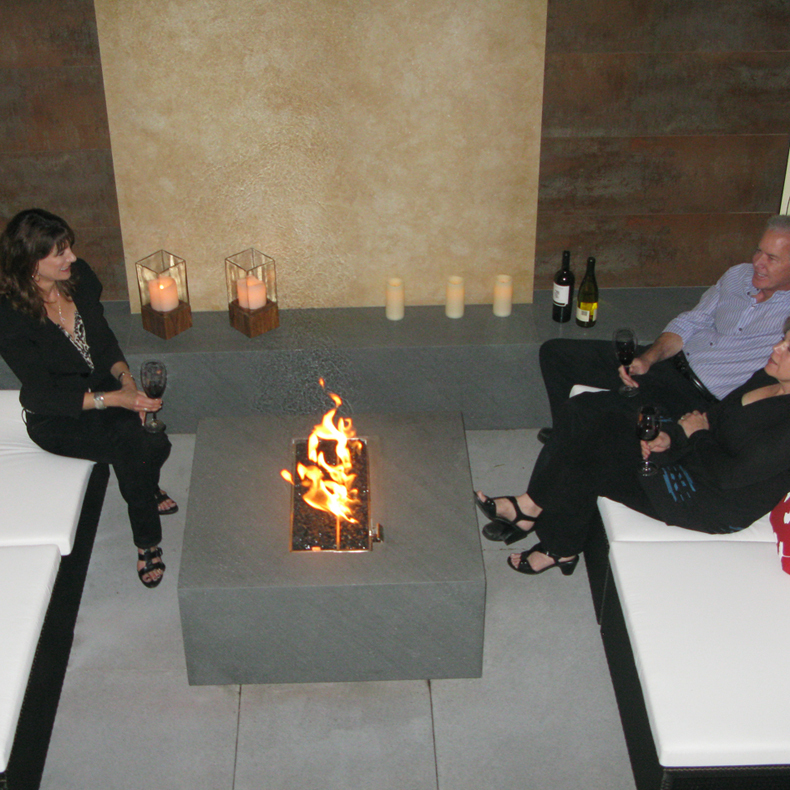 The outdoor fireplace is part of an outdoor canopied eating/sitting area adjacent to an unusual outdoor aquarium and water feature. 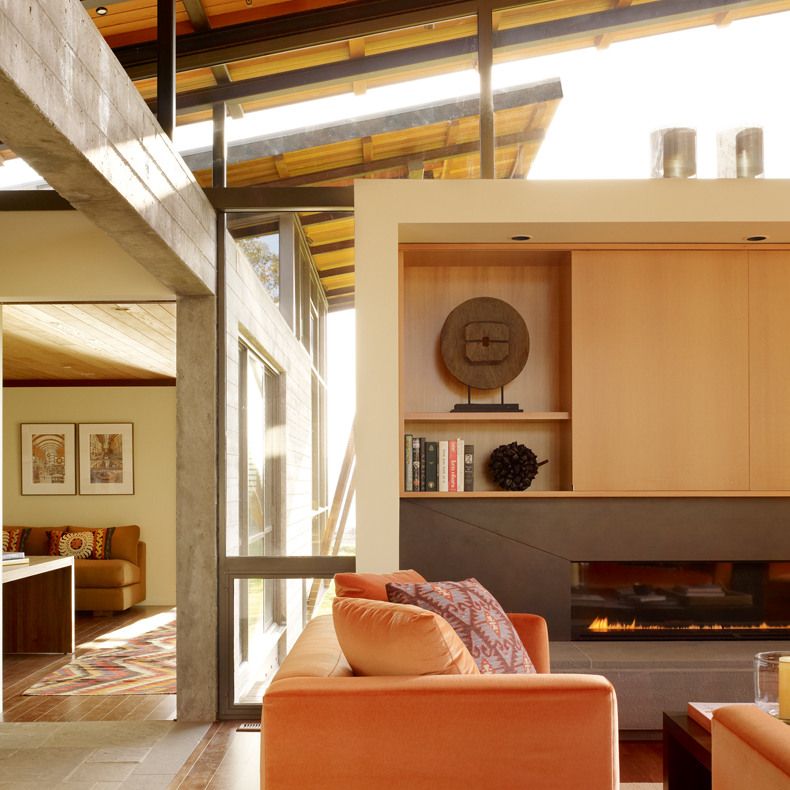 The fireplace and chimney are clad in lead coated copper, a material used extensively on the exterior of the main house. 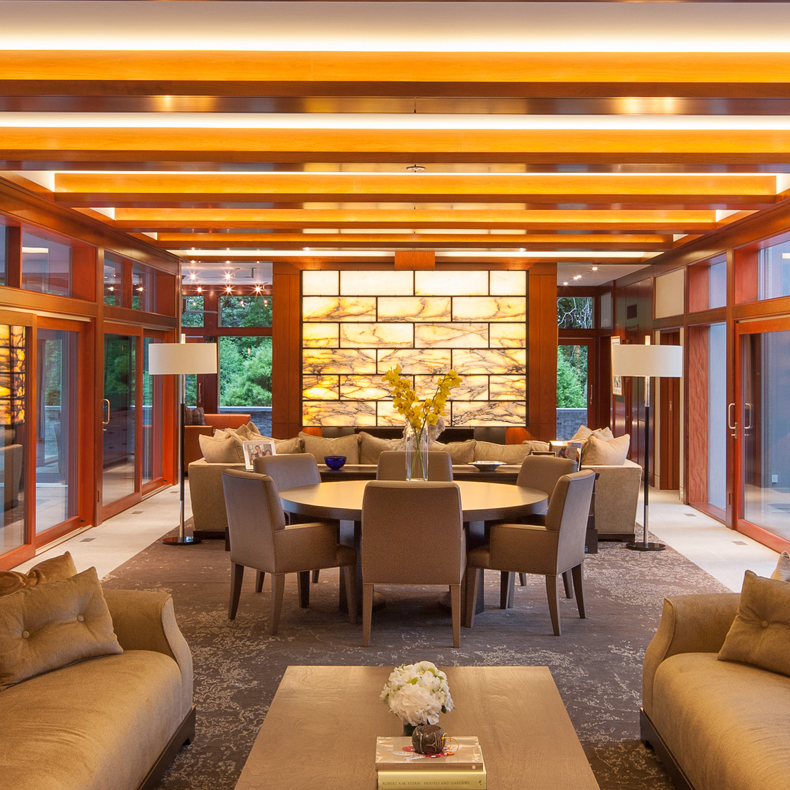 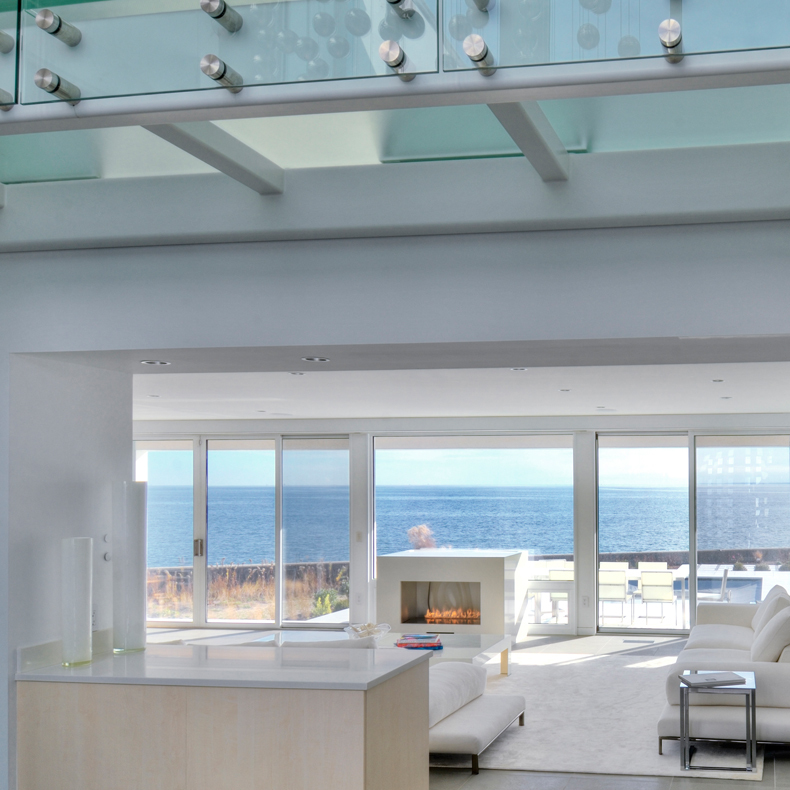 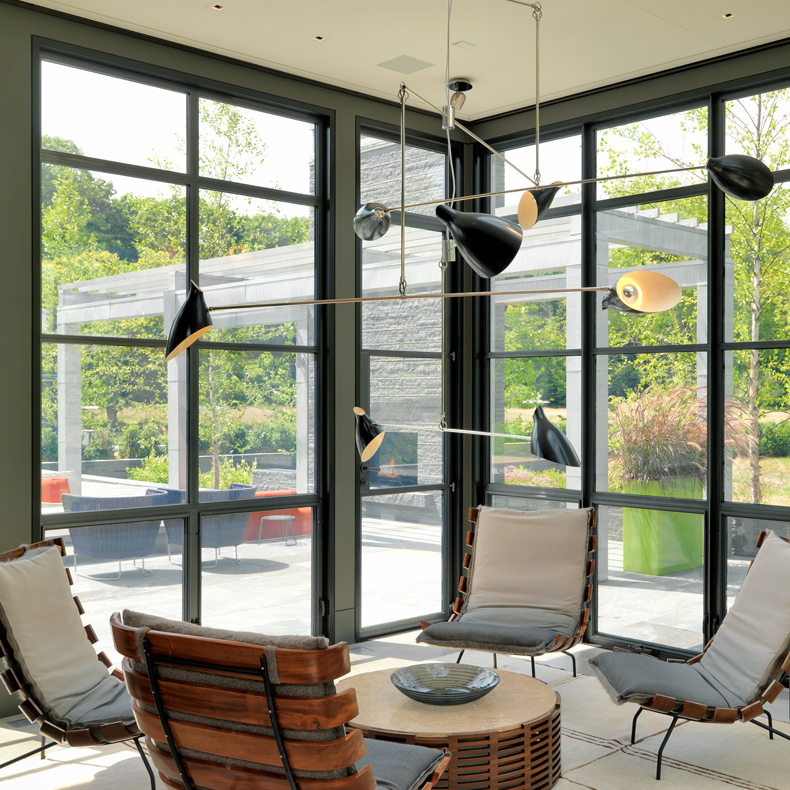 Two Spark’s Linear Burner Systems used in the project, a private residence in the greater Boston area. 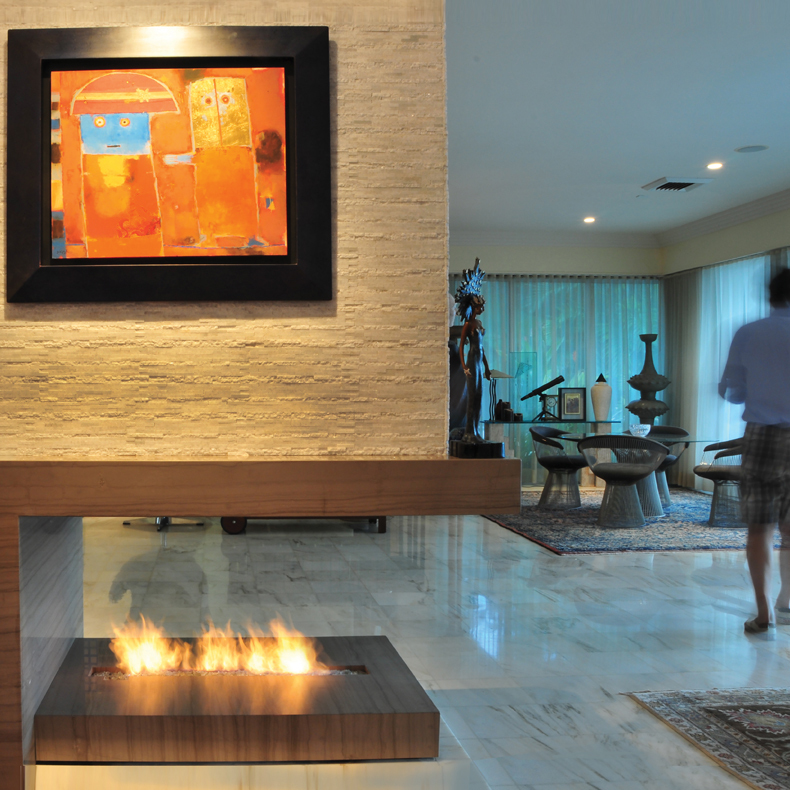 Different materials in each fireplace give each room its own unique character. 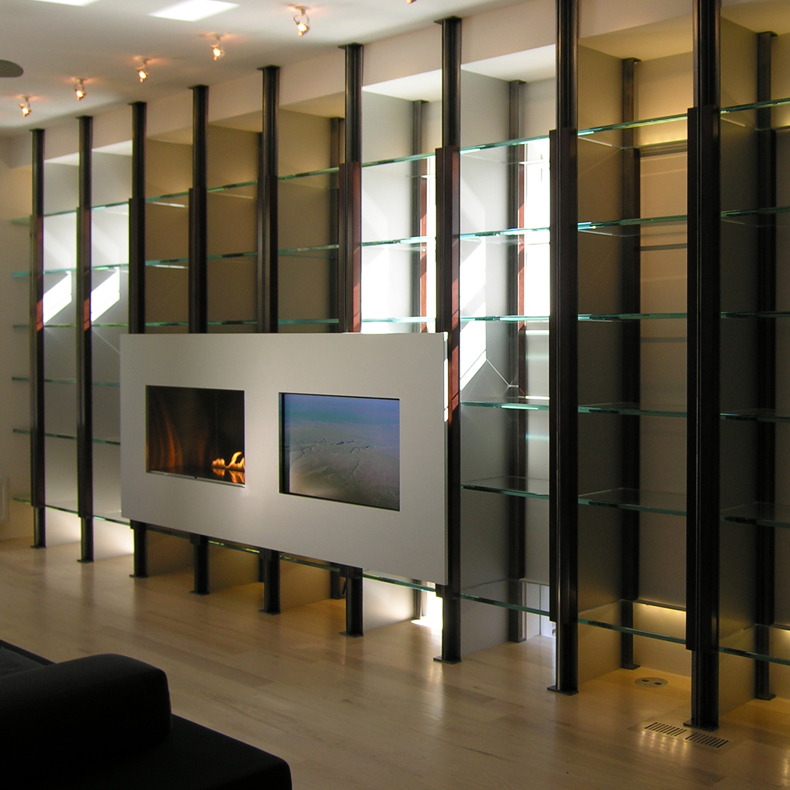 In the Living Room, the idea was to have a focal point that drew your attention, so back lit, onyx panels were used to highlight that end of the room. 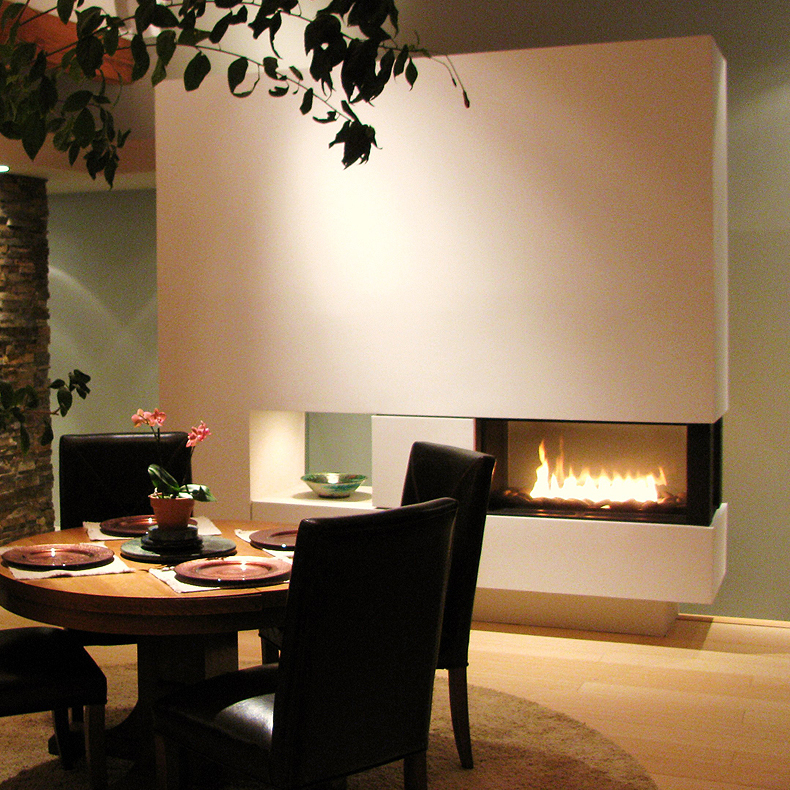 In the Dining Room the fireplace would only be in use when eating so it required a different emphasis. 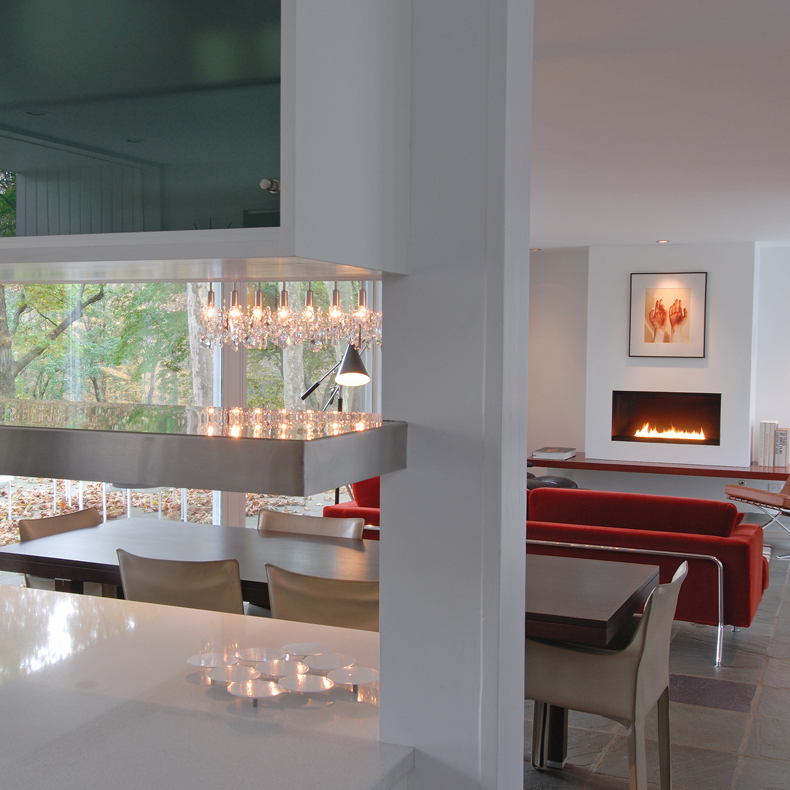 Here, the fireplace was raised to above table height so it was clearly visible to all sitting at the dining room table, even across the 15\’ long table. 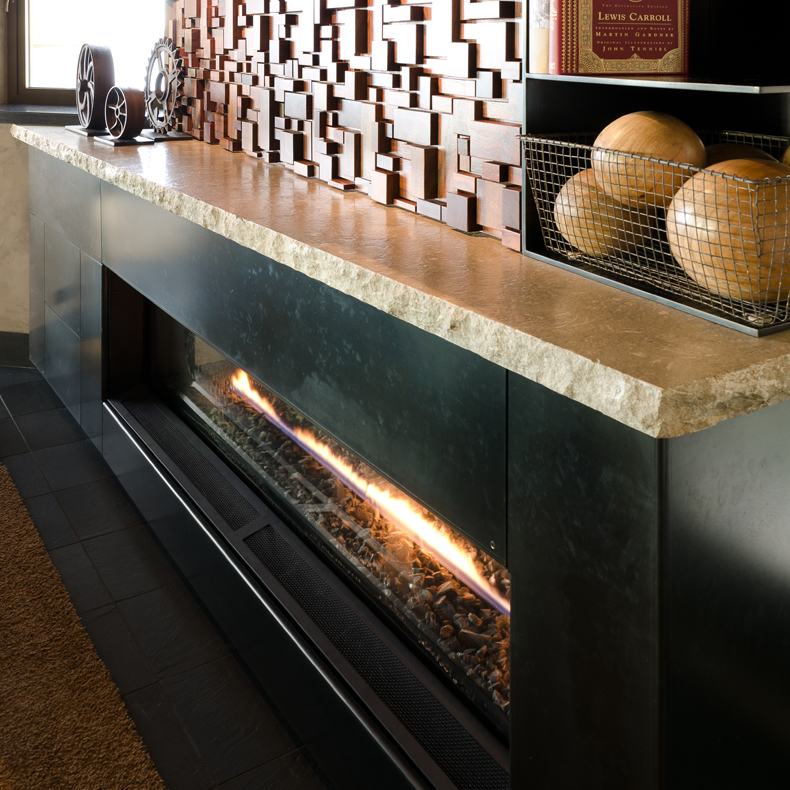 In this project, the blackened steel surround, seagrass limestone mantle and Oregon black walnut mosaic complement the simplicity and clean lines of the Direct Vent 6ft Model. 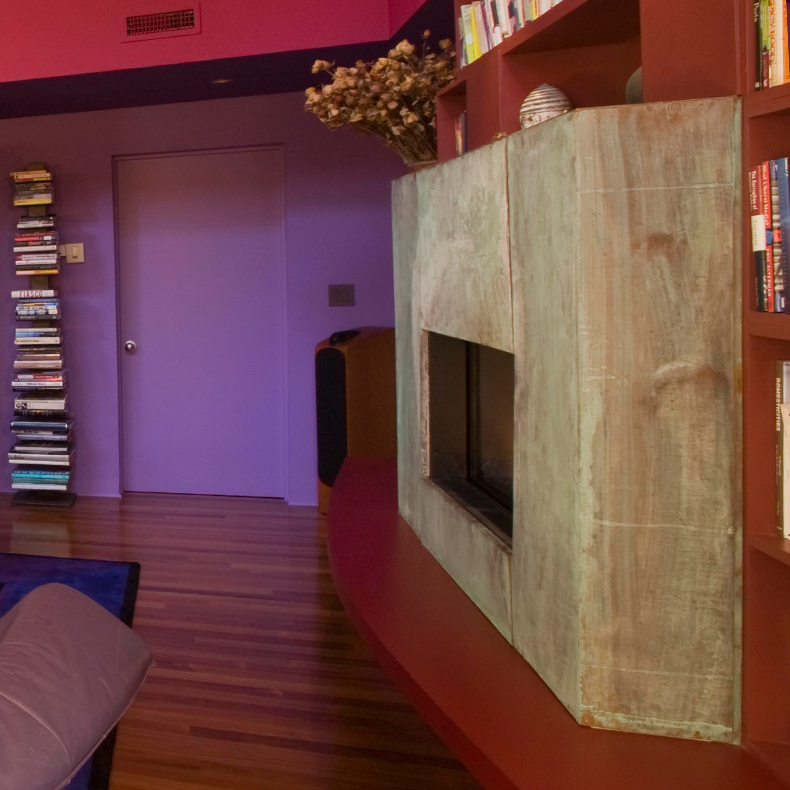 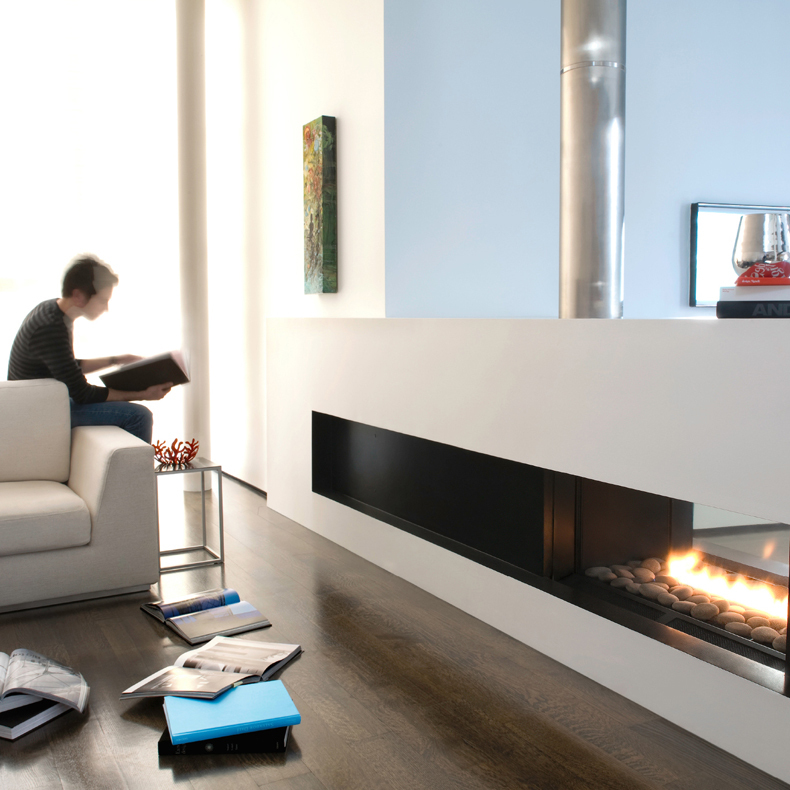 A beautiful Spark Slim 46 was chosen to be the warm focal point of this family’s reading room. 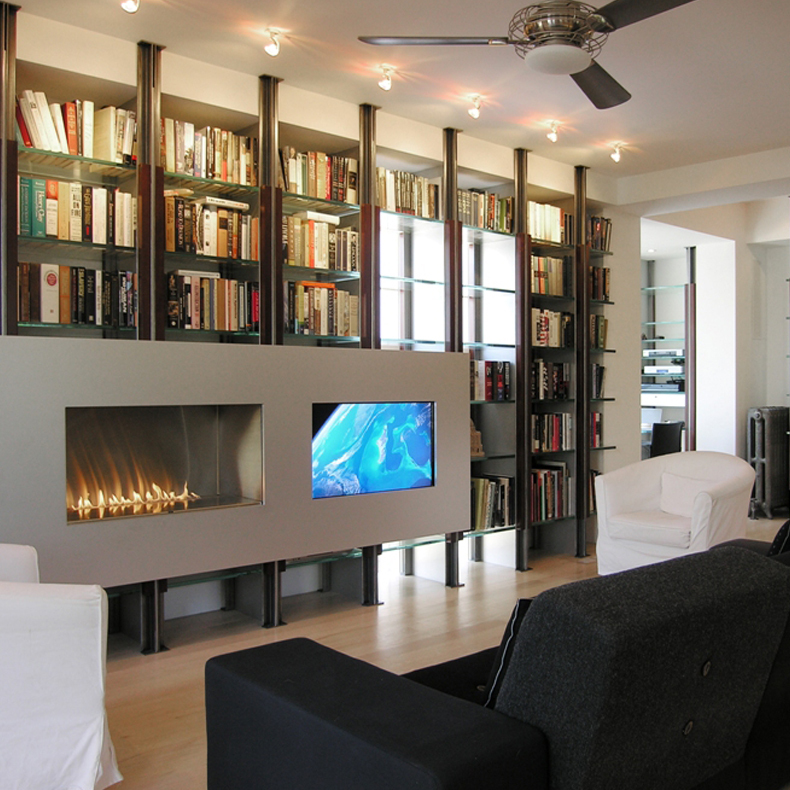 Squarely mounted between two bookcases, the Slim 46 emanates a relaxing and meditative glow that completes this space. 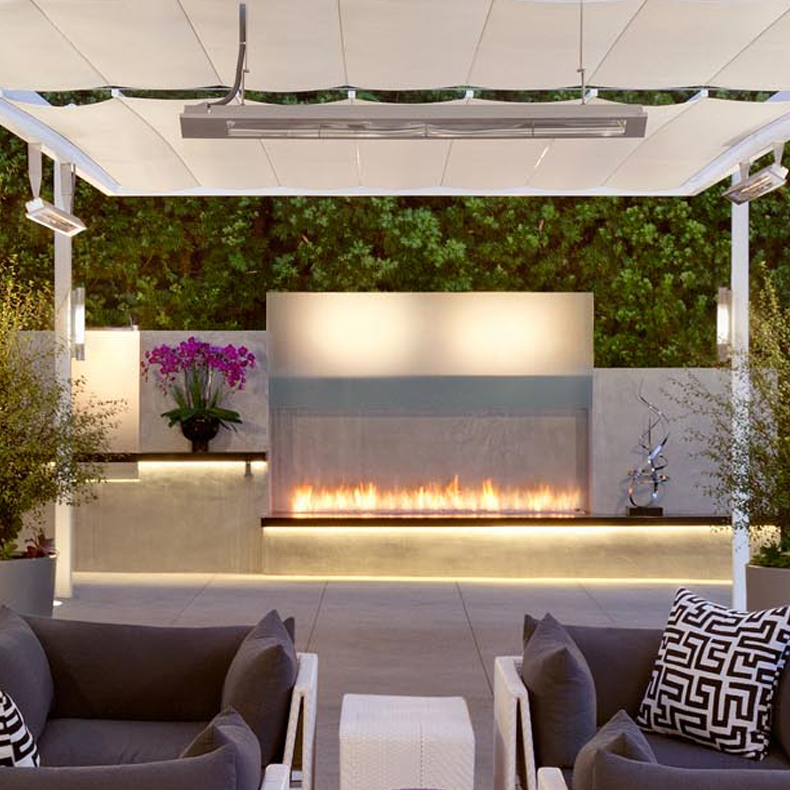 In this stunning Texan outdoor living room, Spark’s Linear Burner System Outdoor was incorporated into a custom designed stainless steel fire pit. 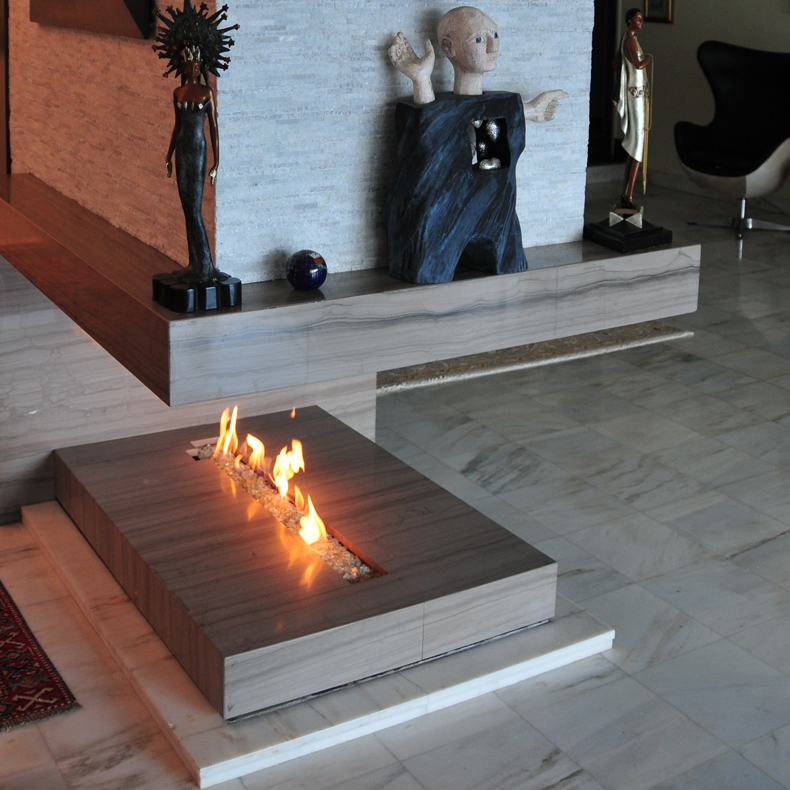 To create a riveting gathering scene- the designer, Ana Seyffert, flanked the Linear Burner with two rectangular pieces of white marble. 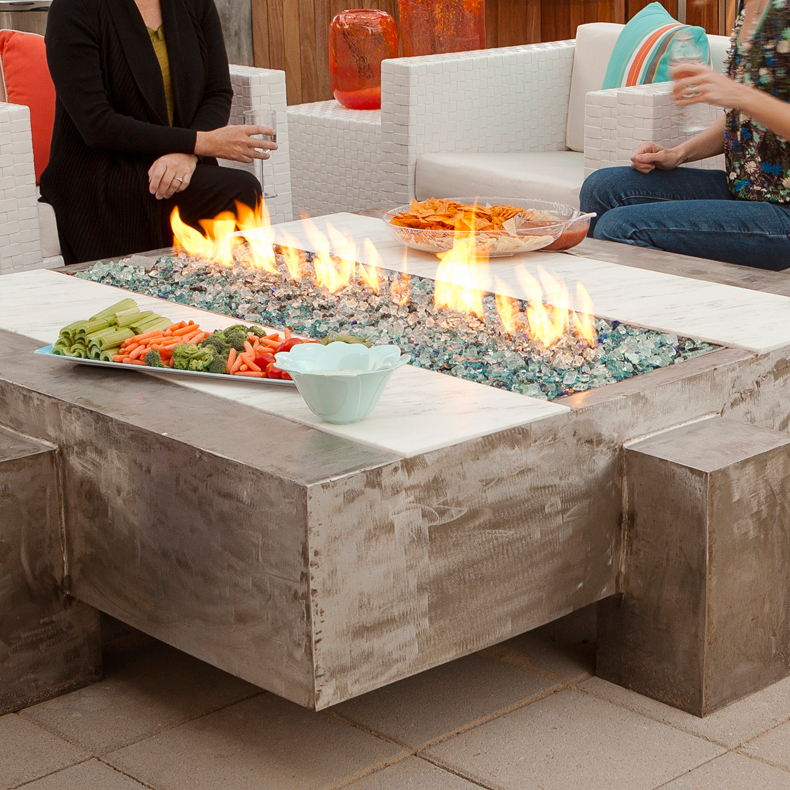 When it is not in use, the installation serves as a coffee table. 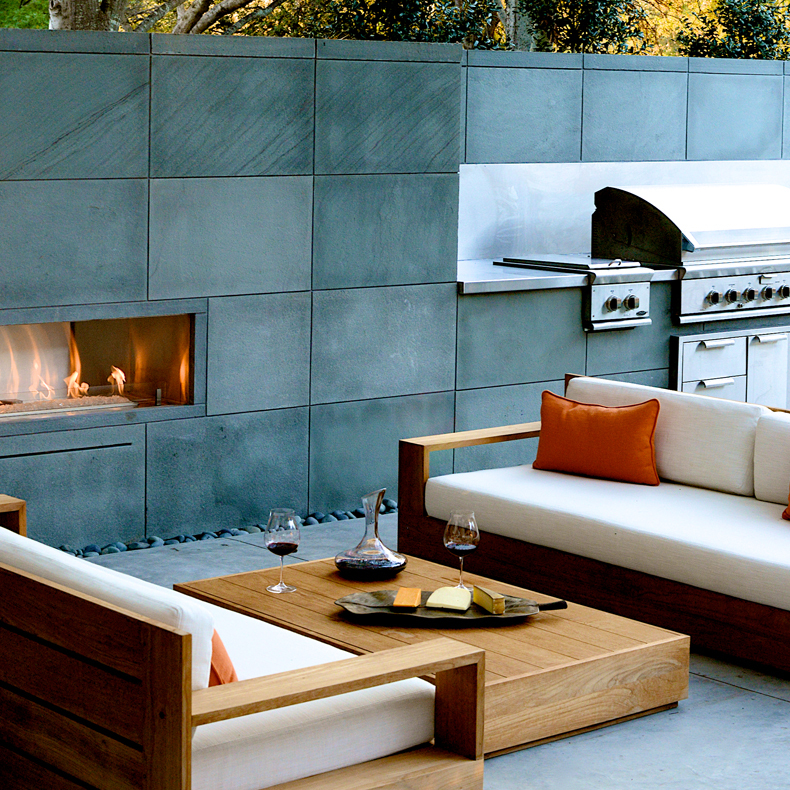 The focal point of the terrace is a rough texture, stacked stone privacy wall that houses two continuous open 8-foot linear burner system outdoor units. 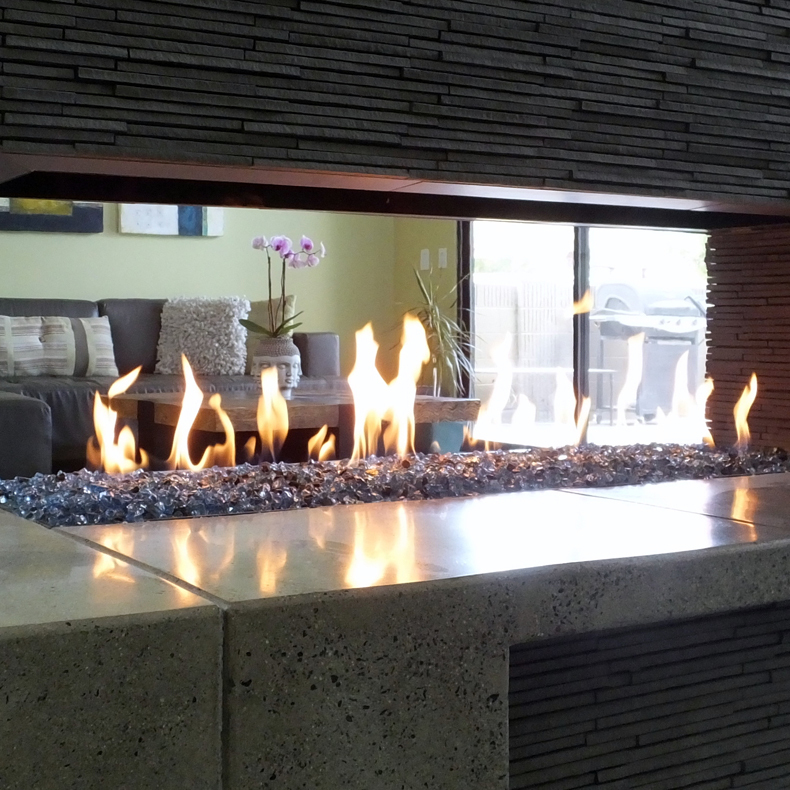 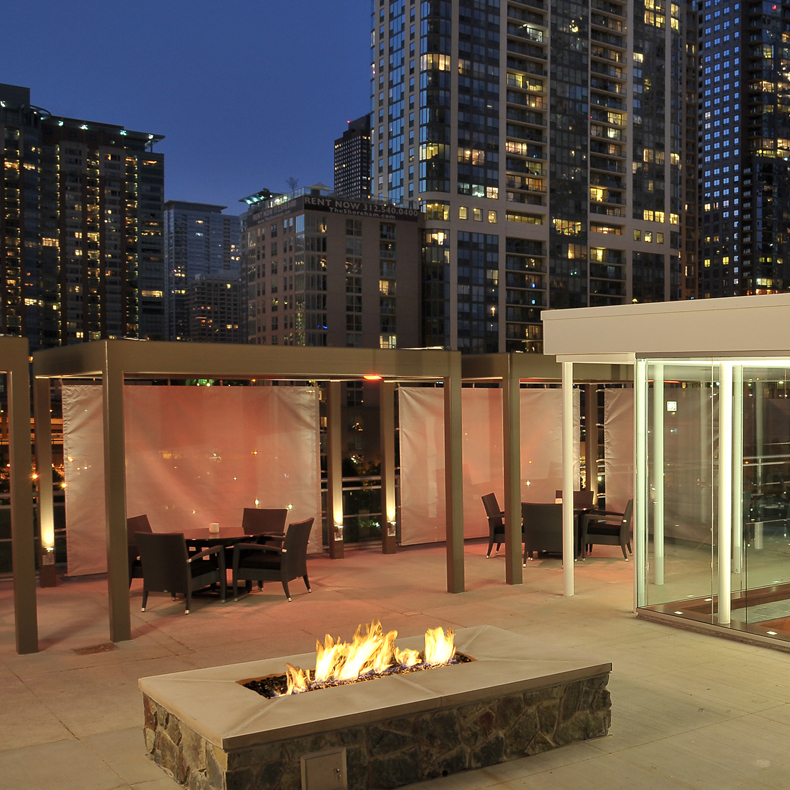 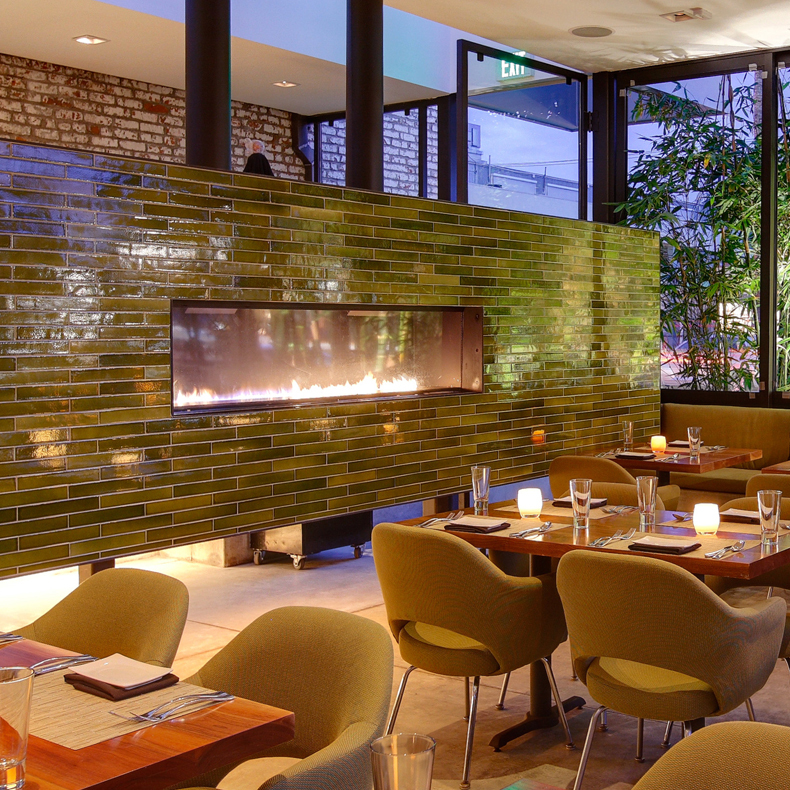 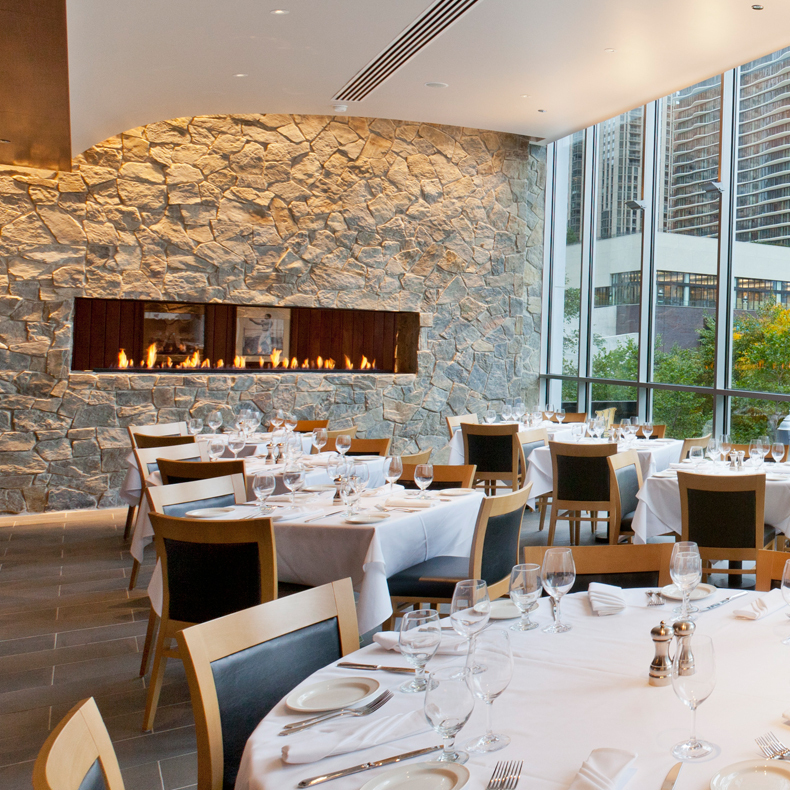 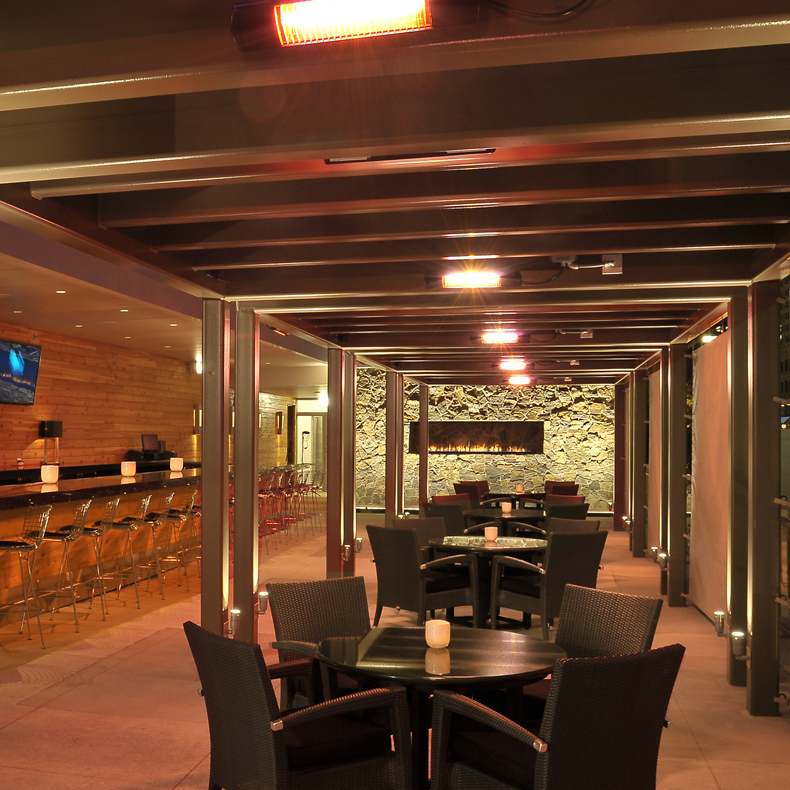 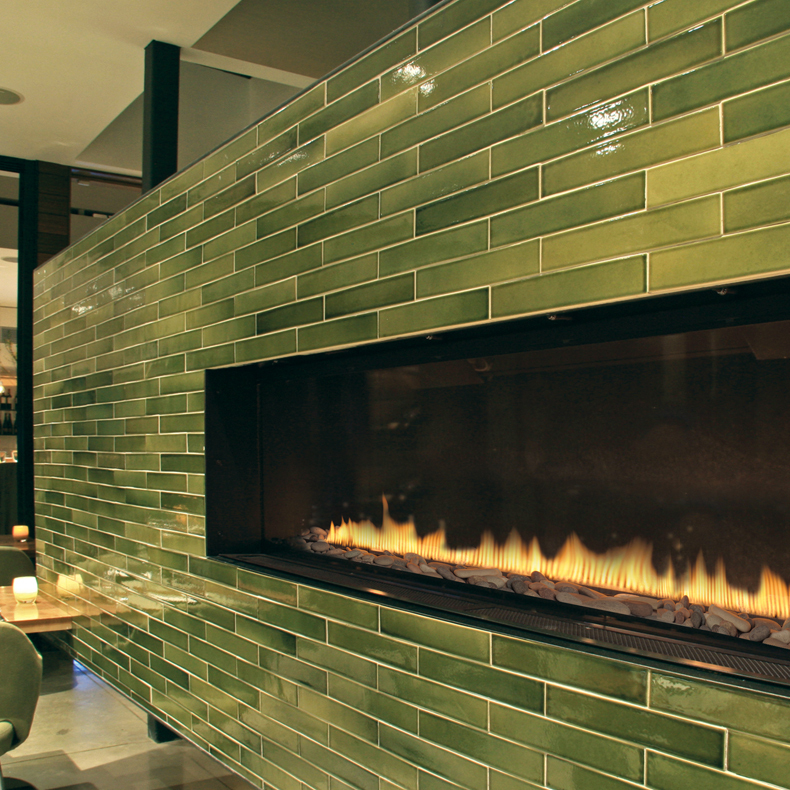 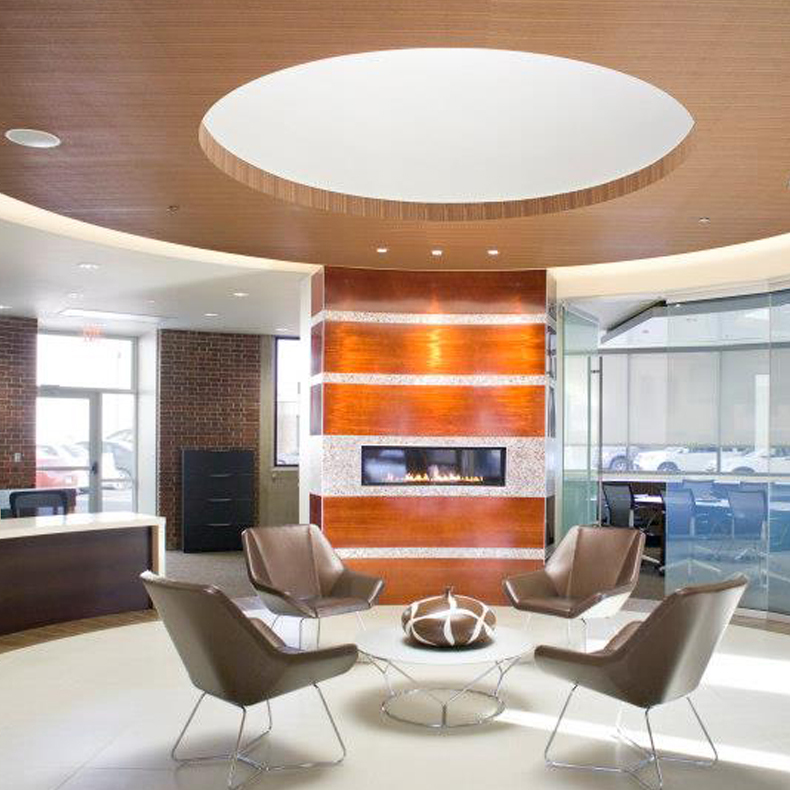 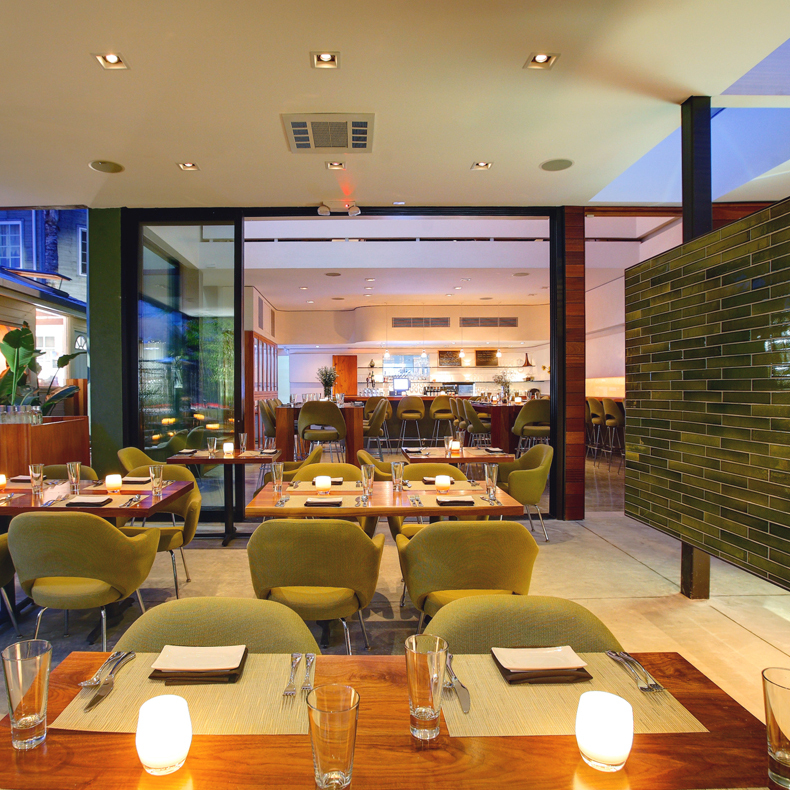 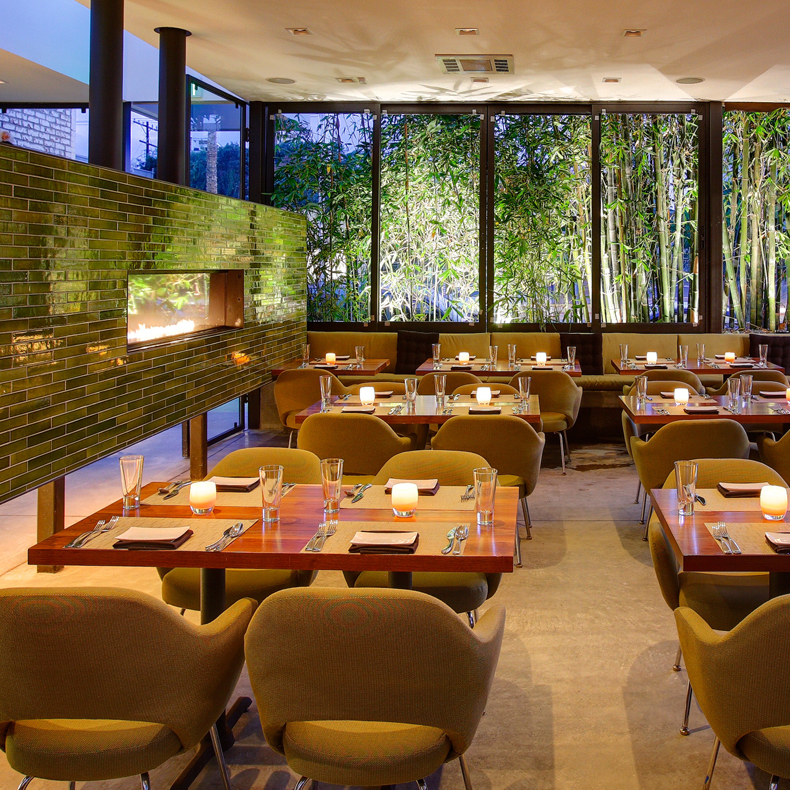 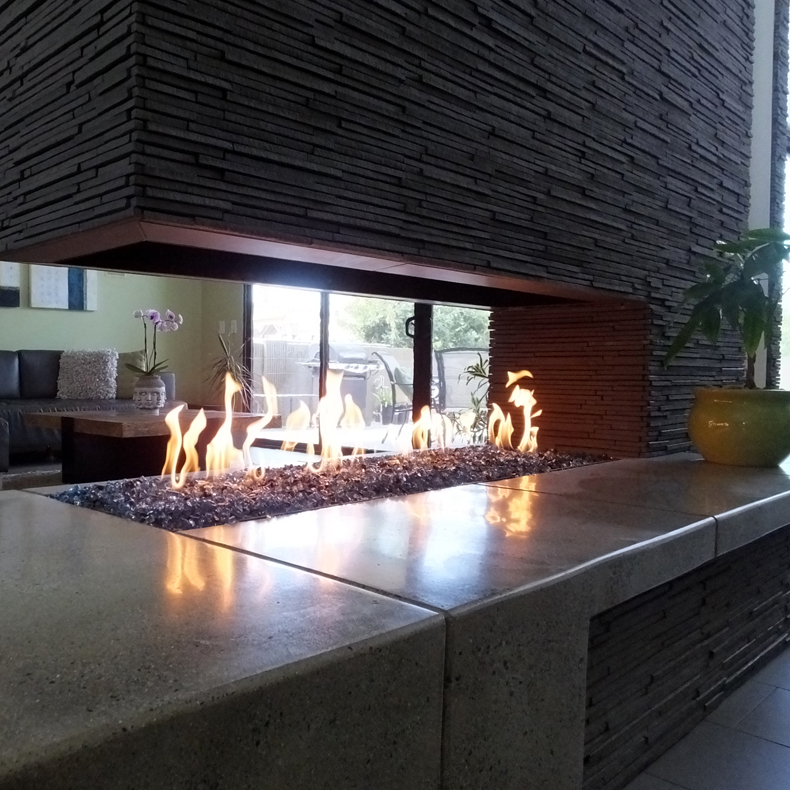 The installation of the beautiful Spark natural gas linear burner was essential for achieving the designer’s goal of creating a comfortable, inviting, and relaxing gathering venue. 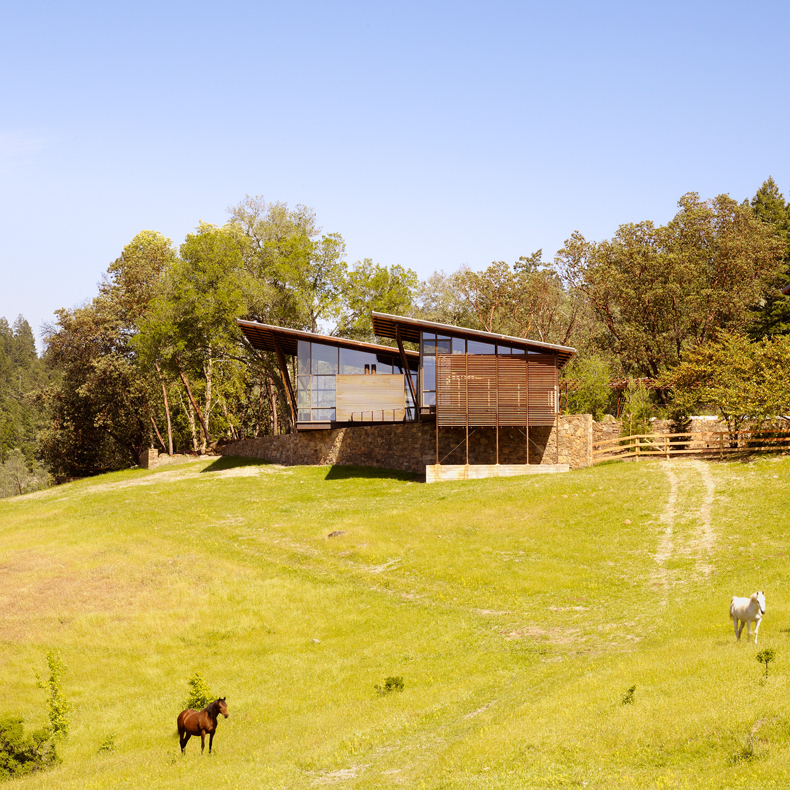 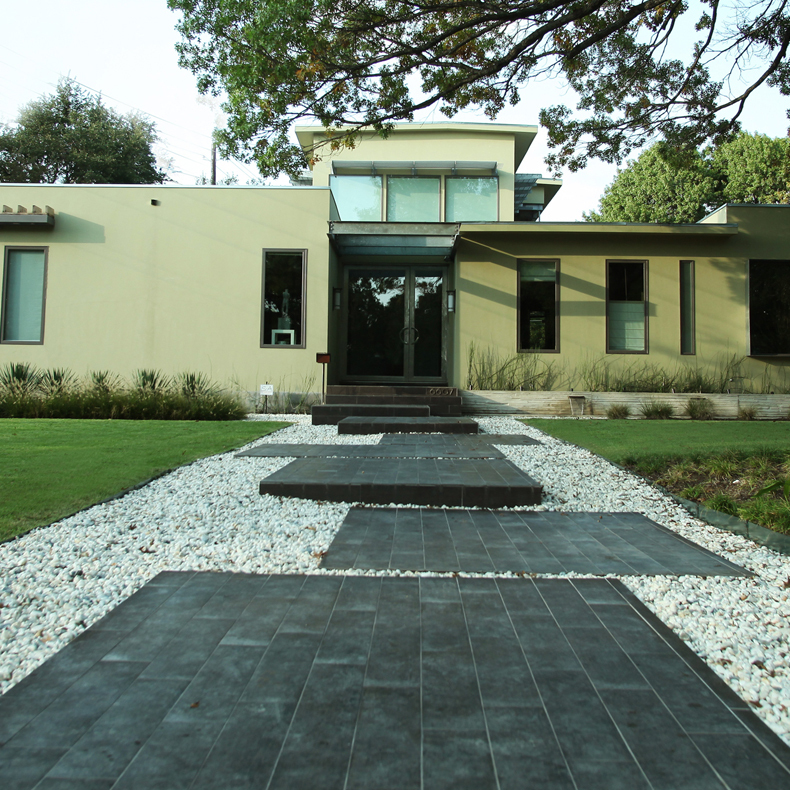 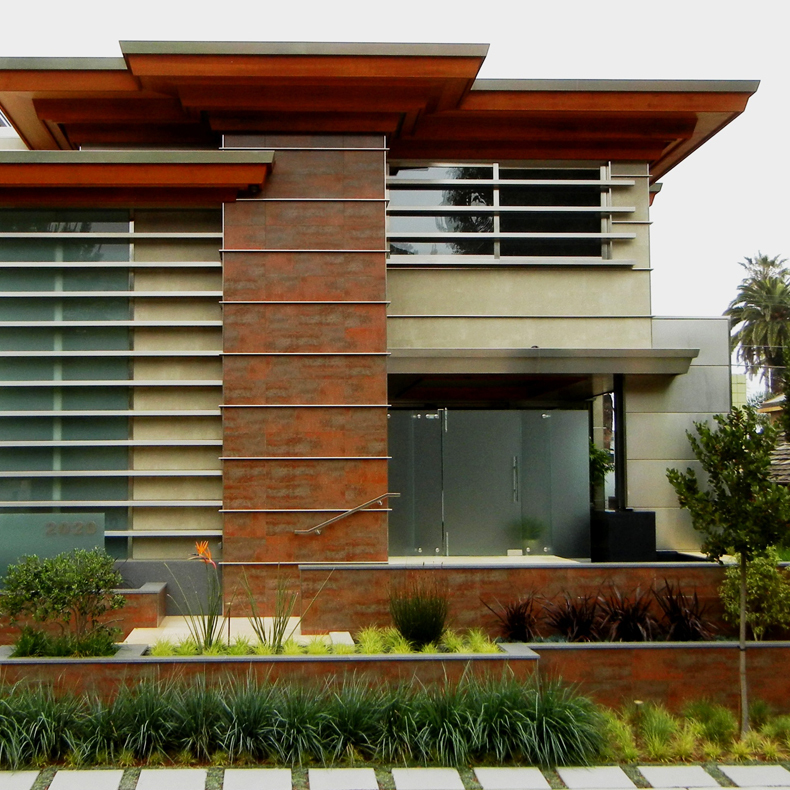 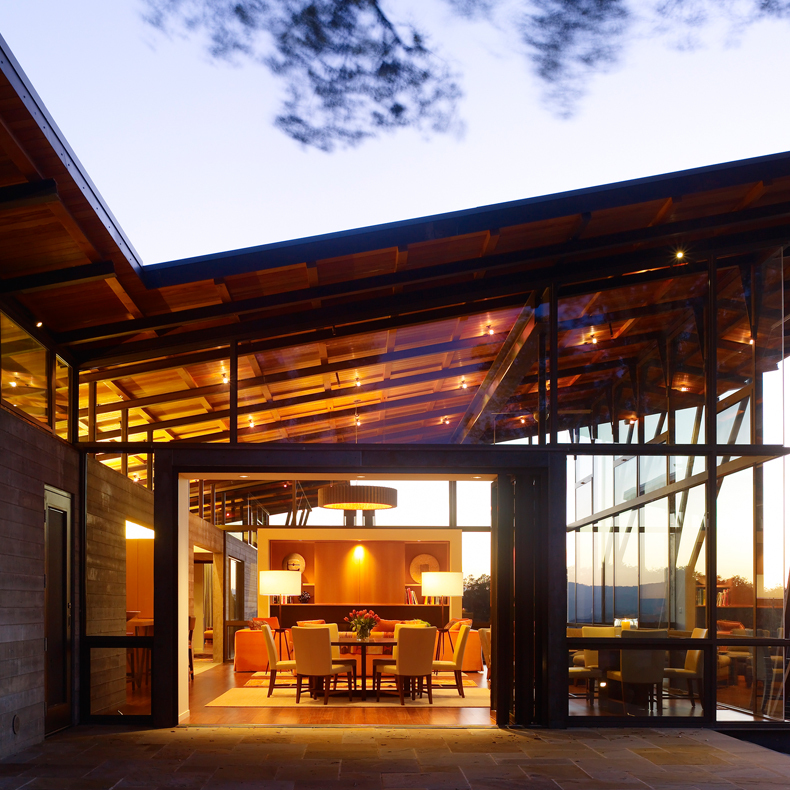 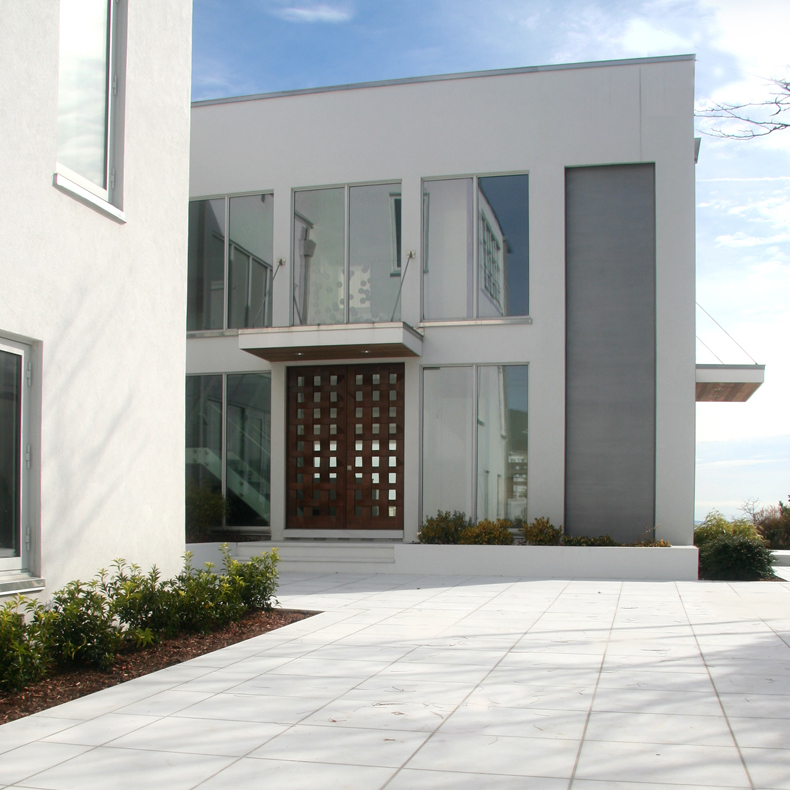 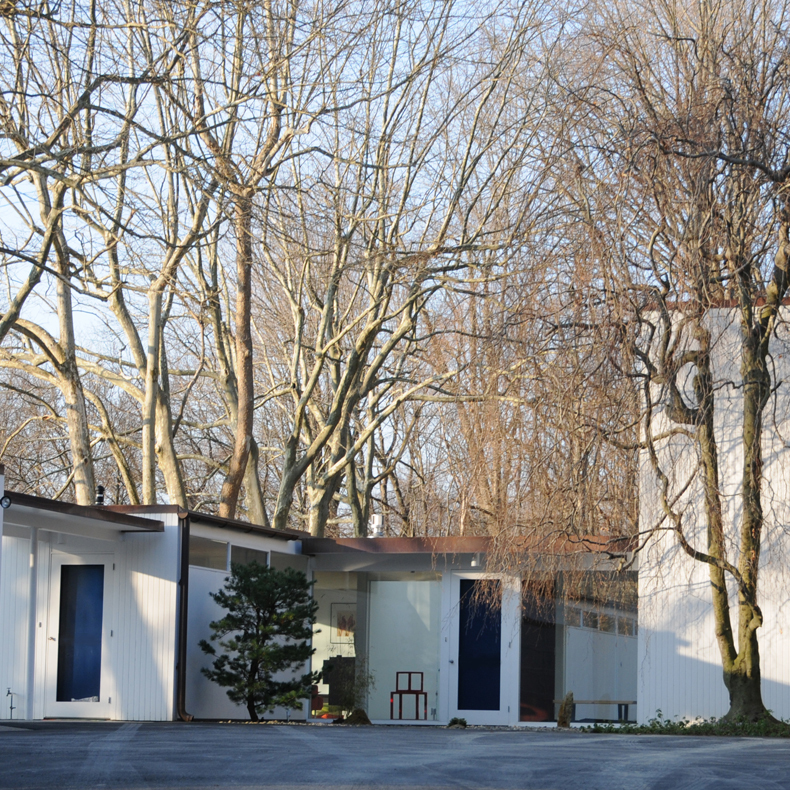 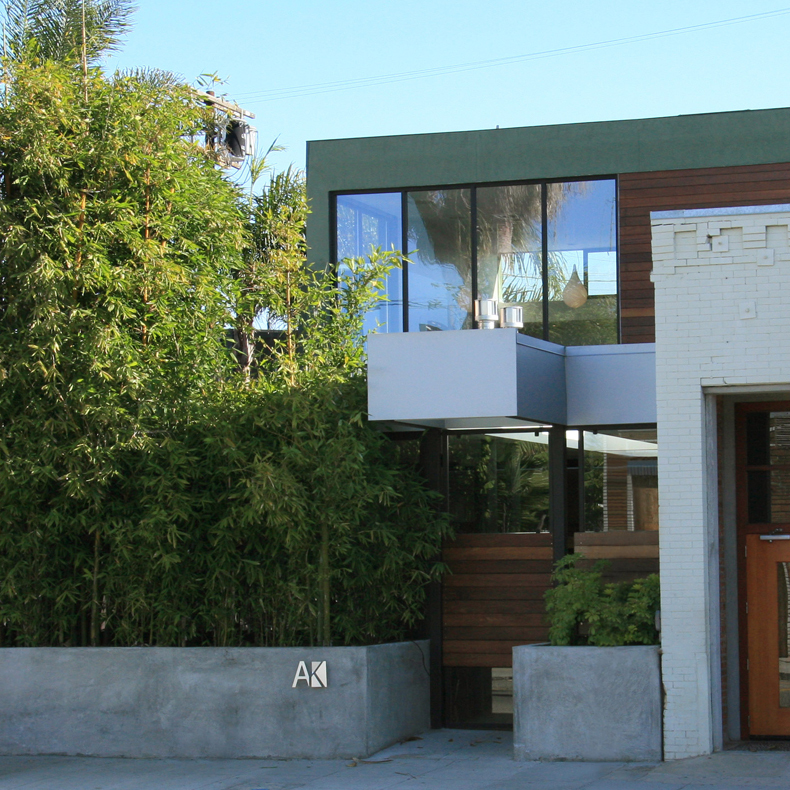 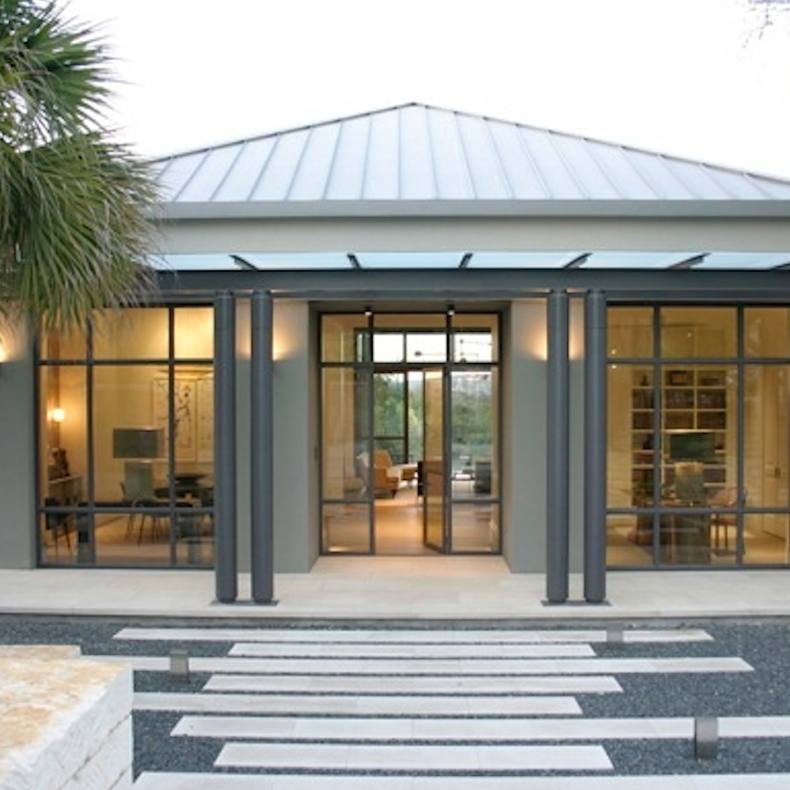 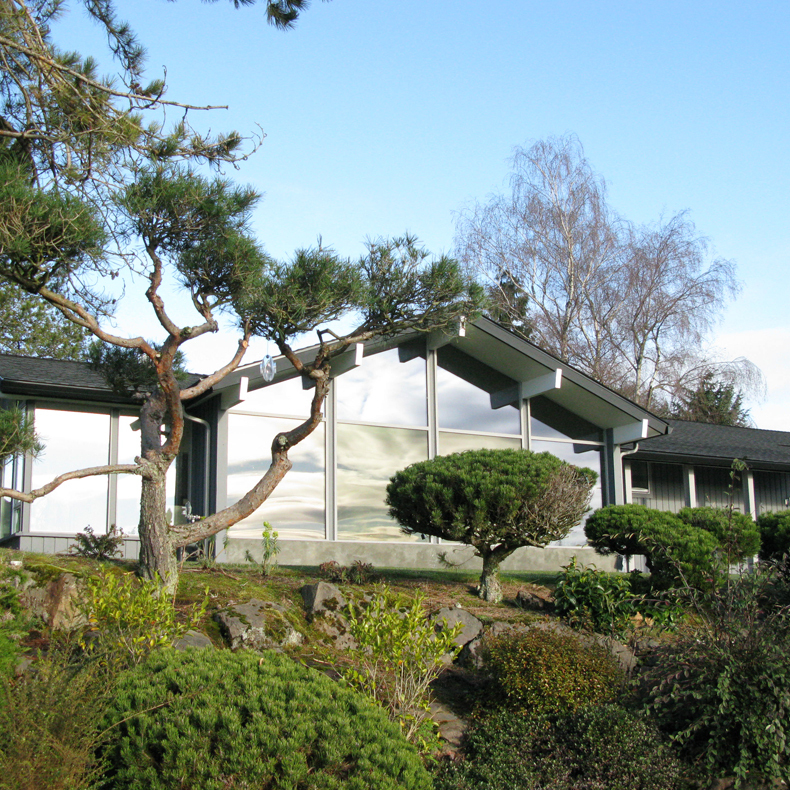 Landscape Architect: Katherine Spitz Associates, Inc. 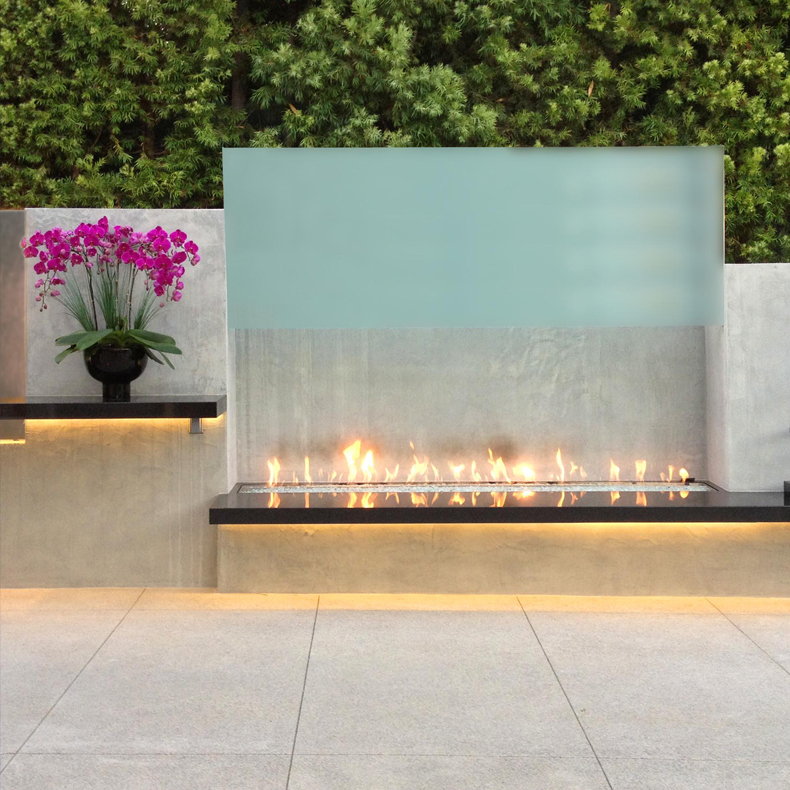 The Linear Burner System Outdoor is finished in a silver-grey smooth trowel plaster, accented with acid-etched glass panels. 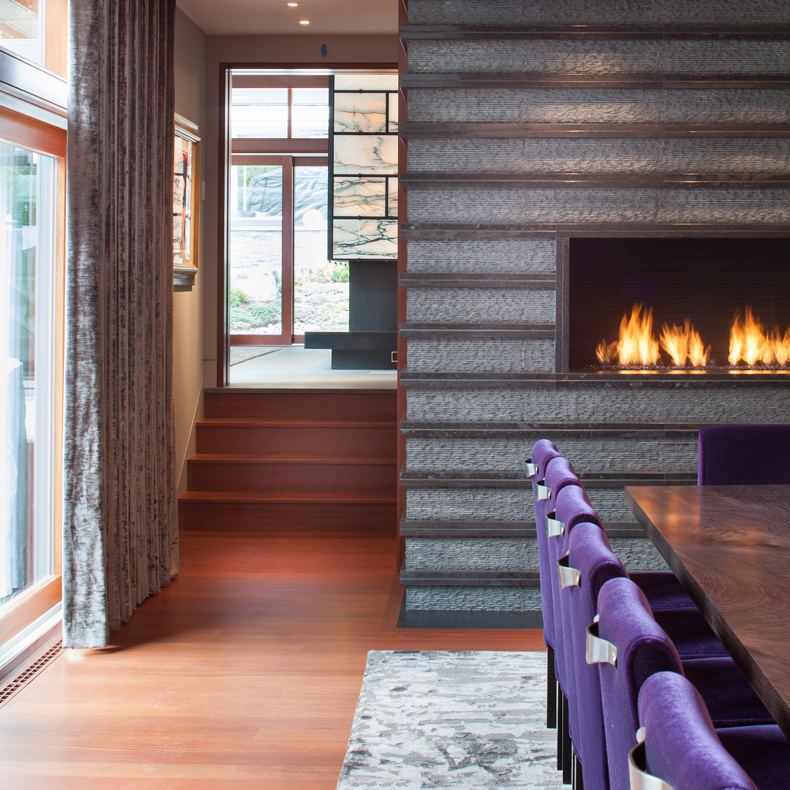 An exaggerated, floating black granite hearth provides seating close enough to watch the dancing flames, while the raised ledge on the opposite side creates balance, also doubling as a dining buffet. 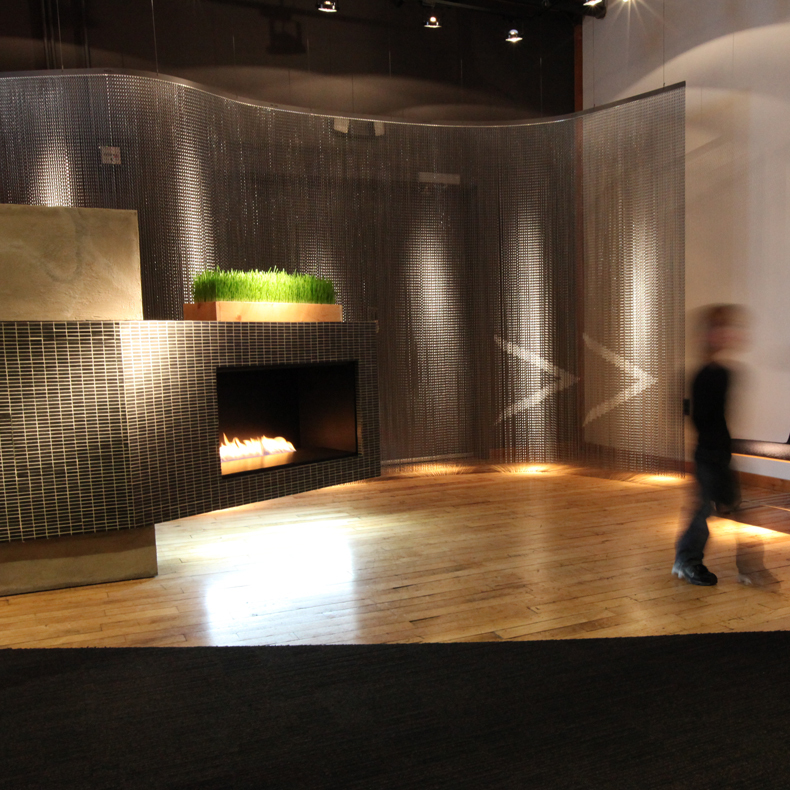 The look of this Linear Burner System Indoor is clean and modern, but also comforting and approachable. 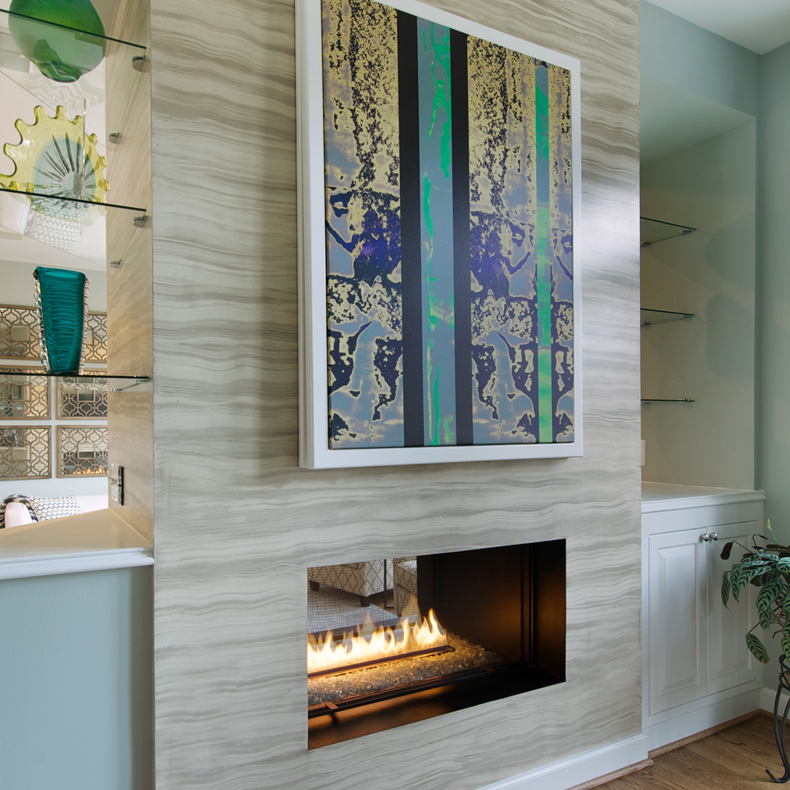 The fireplace model incorporates a buffet and cabinetry on the dining room side, a mantle on the living room side, and a striking linear fire in a new open space. 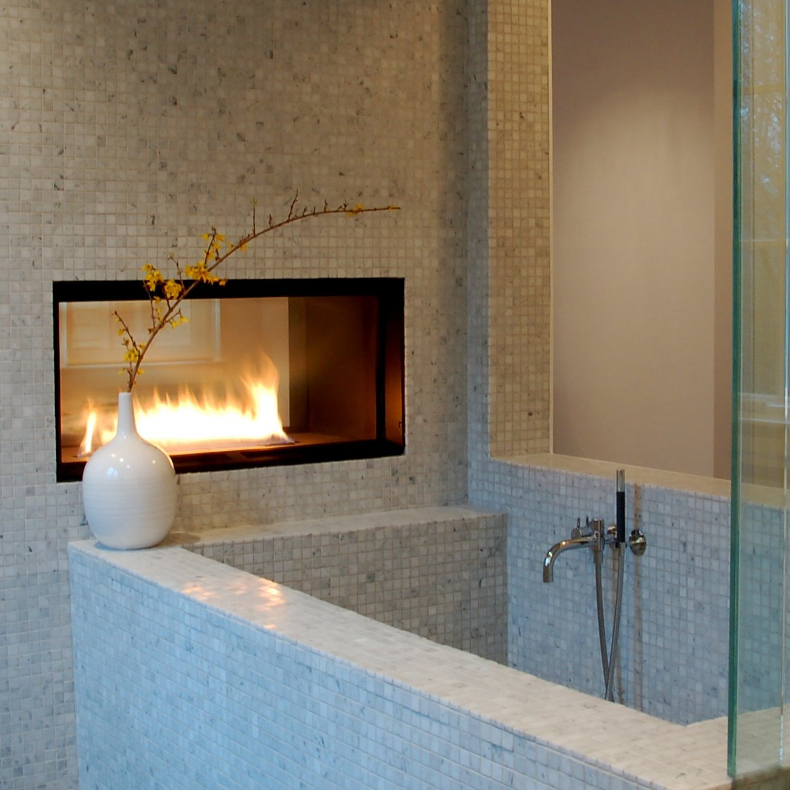 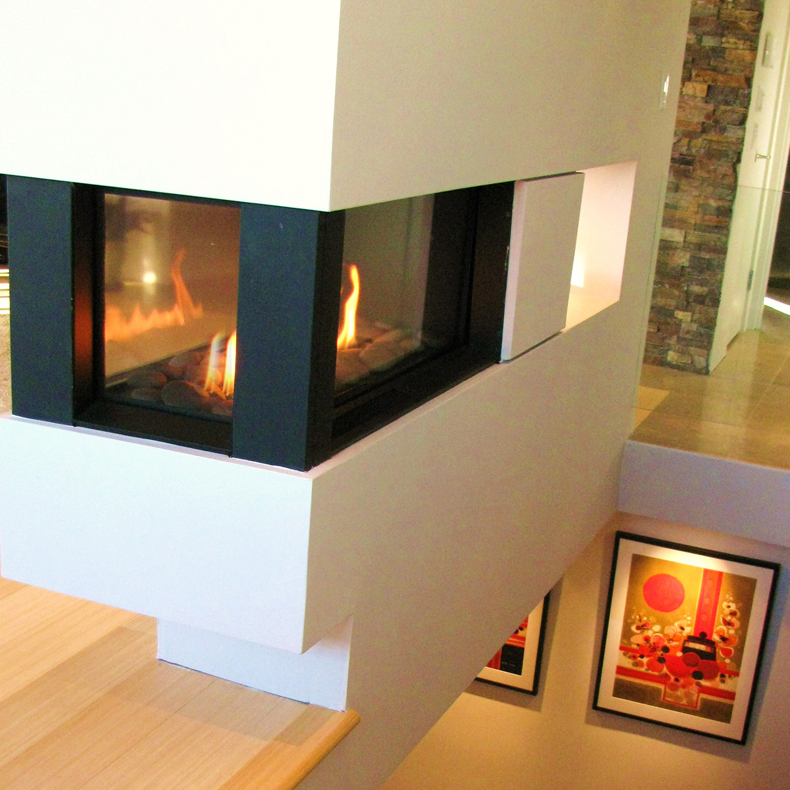 This Linear Burner System Indoor is at the center of an elegant remodel. 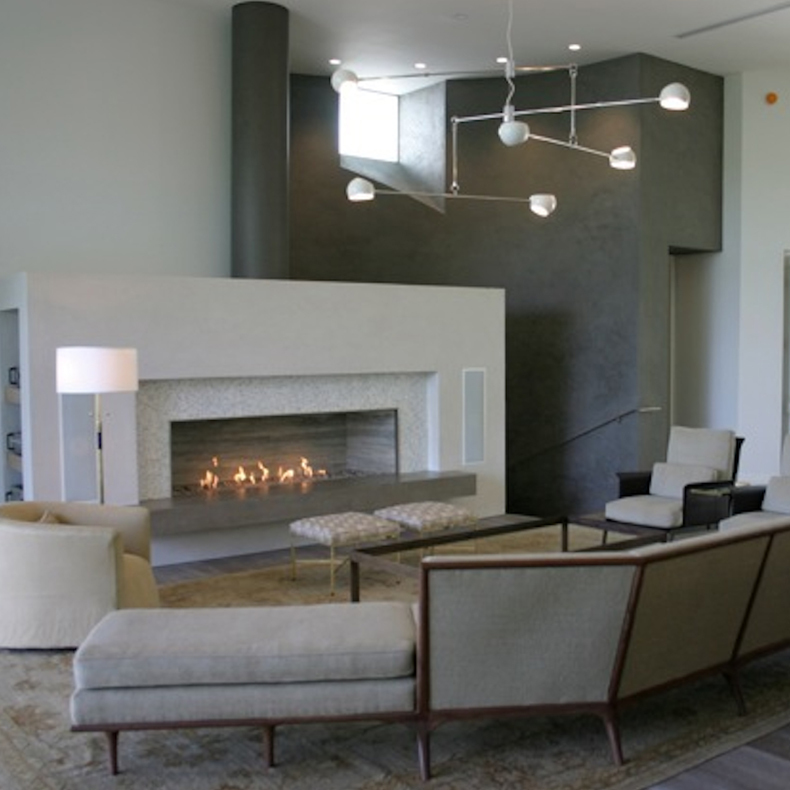 A 10ft piece of locally quarried limestone, travertine, power coated custom steel trim, a marble tile mosaic, American clay plaster finish, and a zinc wrapped flue- all play a part in its flawless execution. 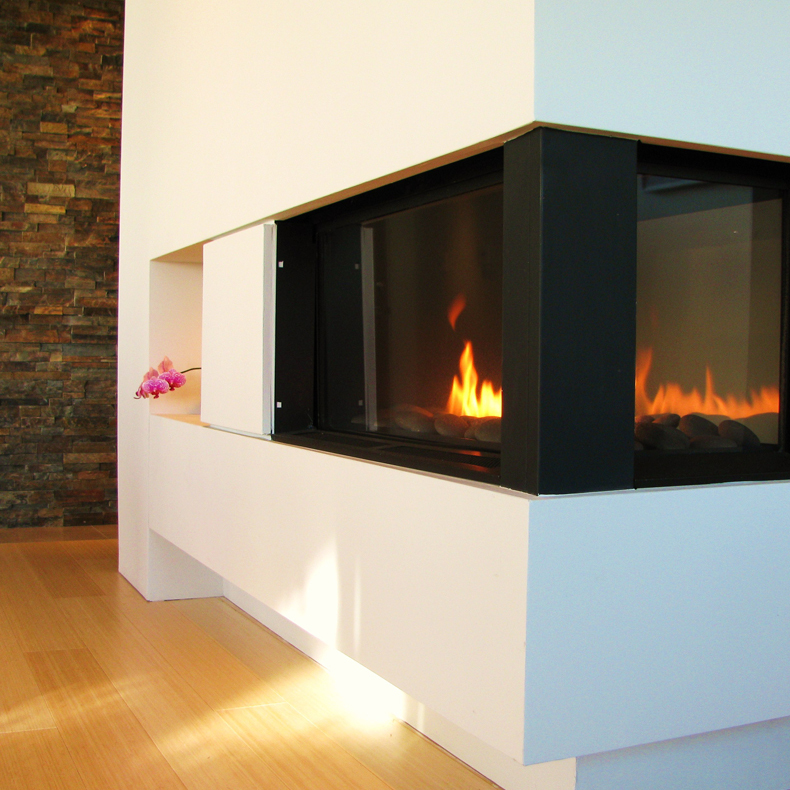 This magnificent fireplace would not have been possible with any other fireplace system. 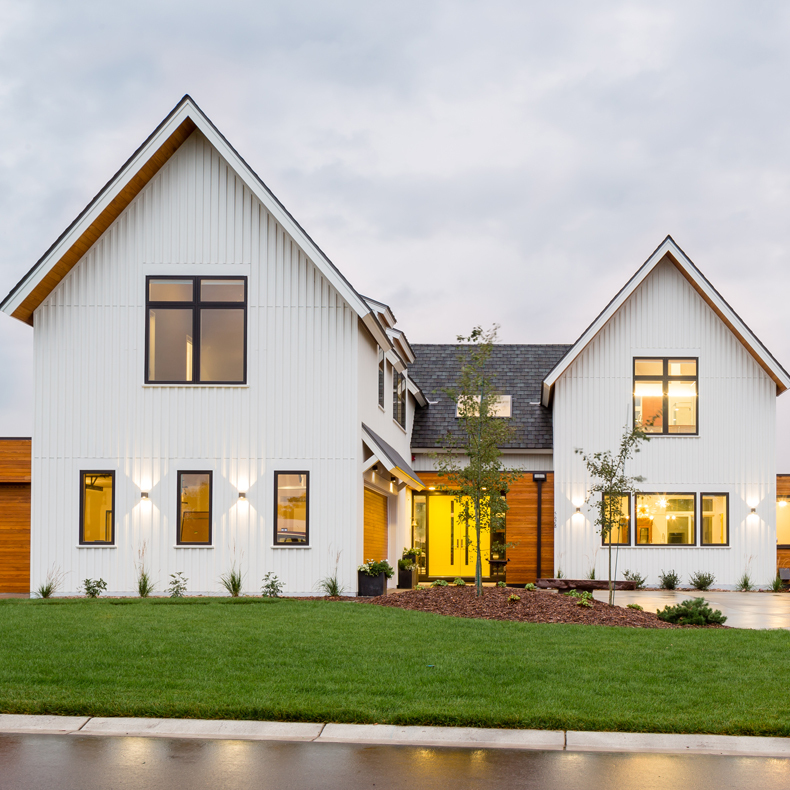 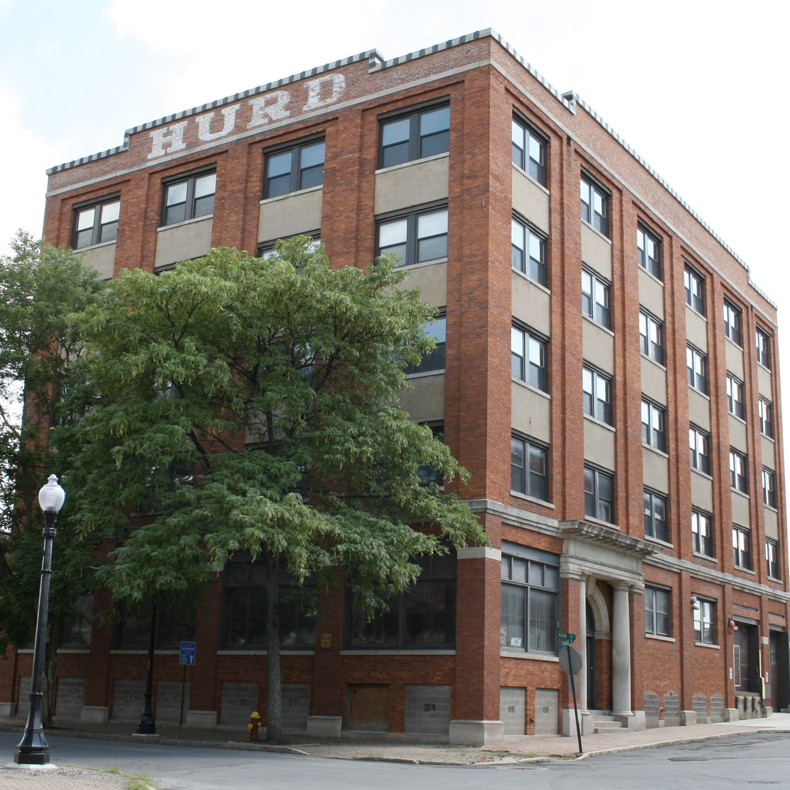 Builder: Peter Madsen Builder, Inc. 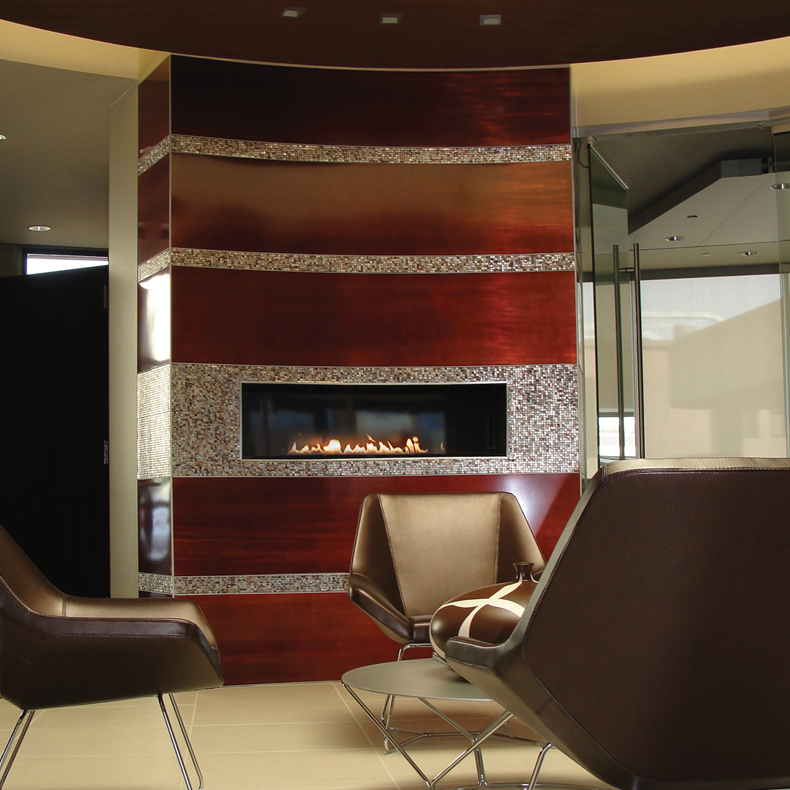 The clean burning technology of the Spark Fire Ribbon creates a modern atmosphere of warmth, serenity, sophistication, and excitement. 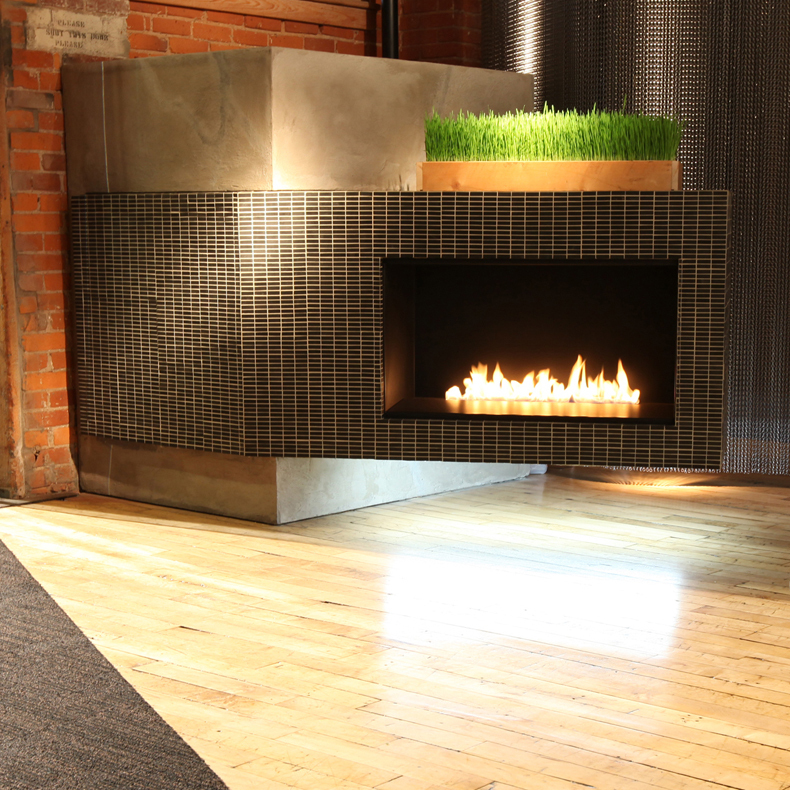 The Linear Burner System Indoor is idyllic for use in a commercial setting. 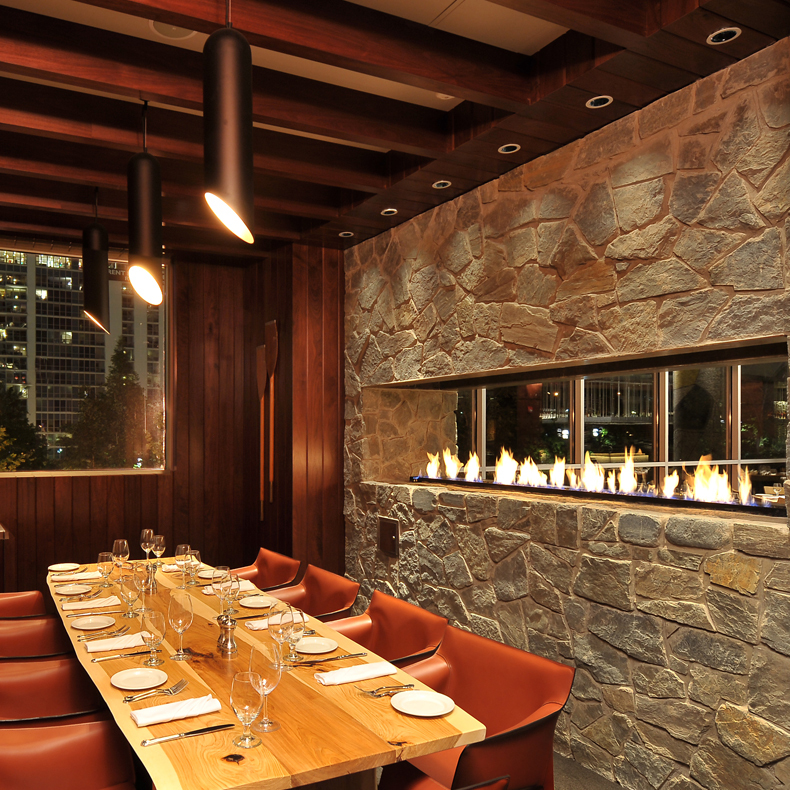 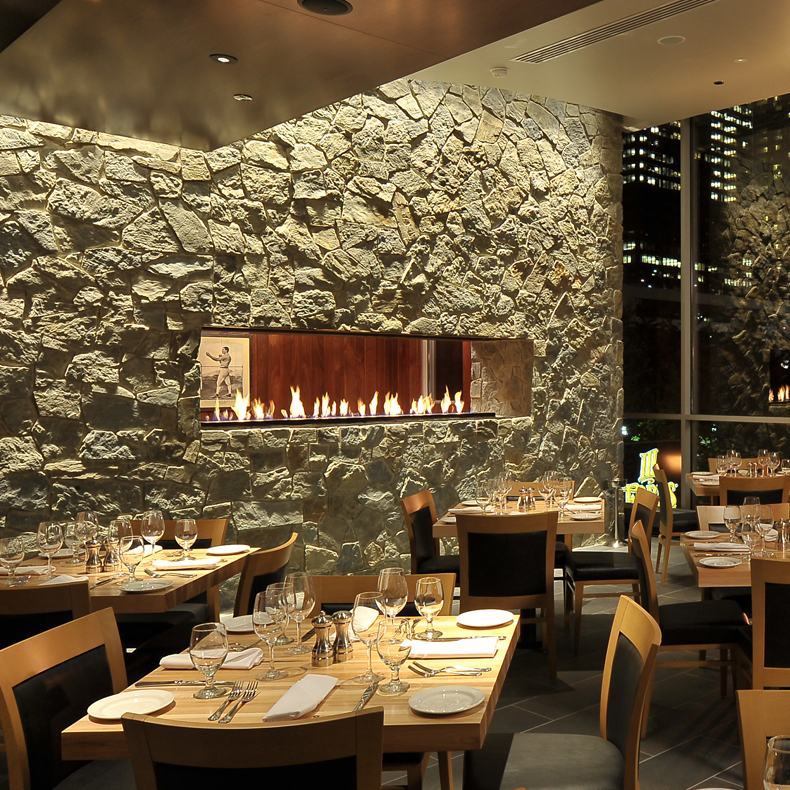 Ribbons of flame create an intriguing décor along the walls of the restaurant. 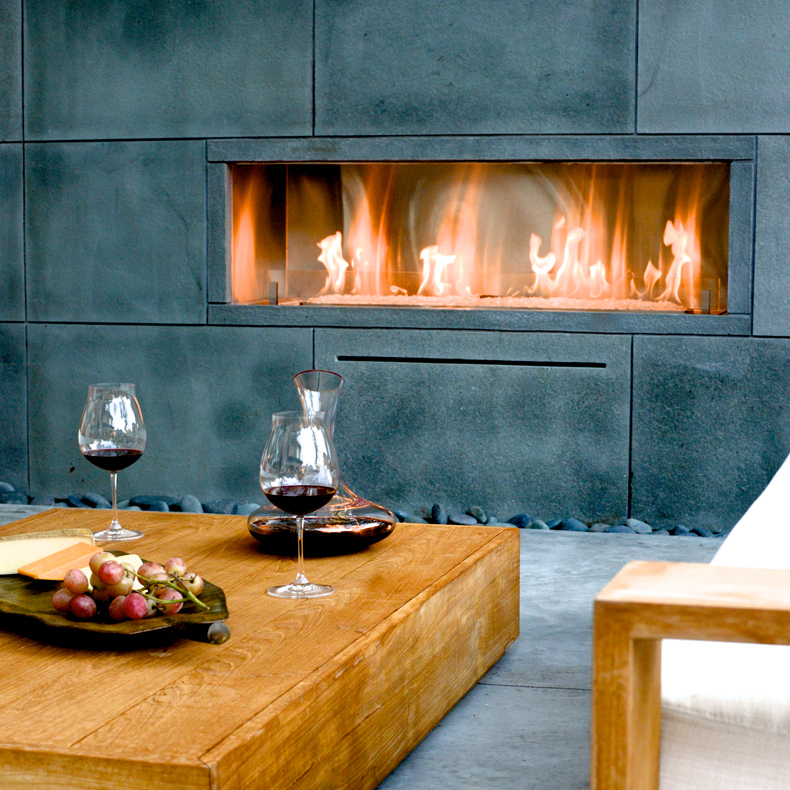 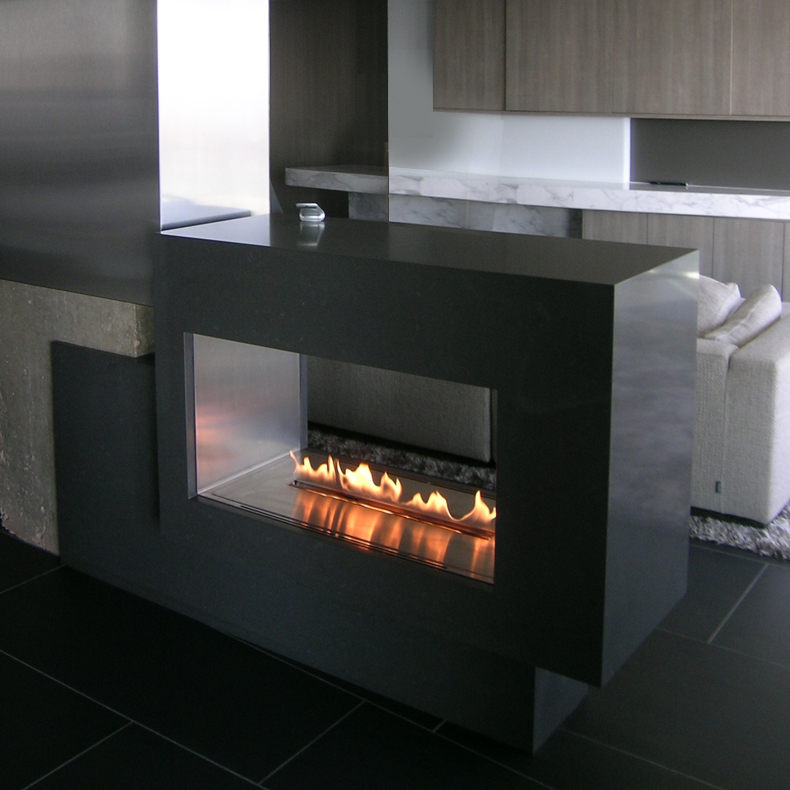 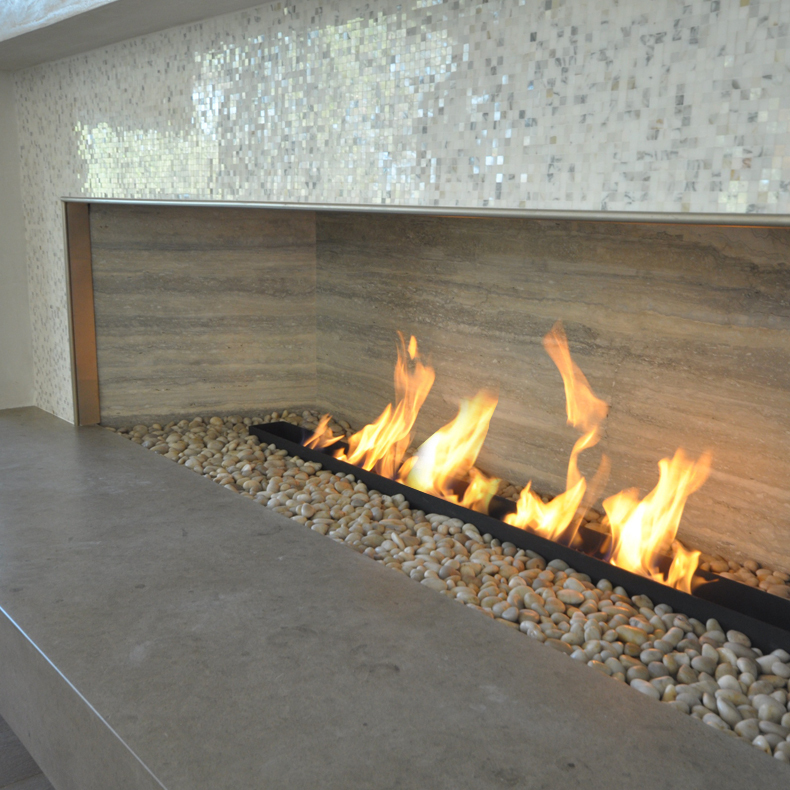 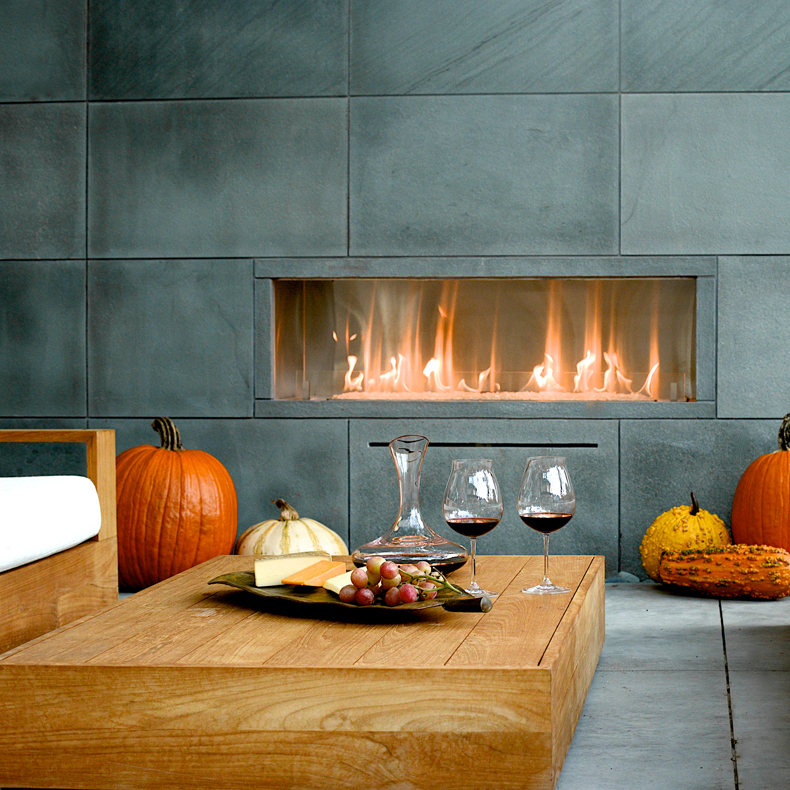 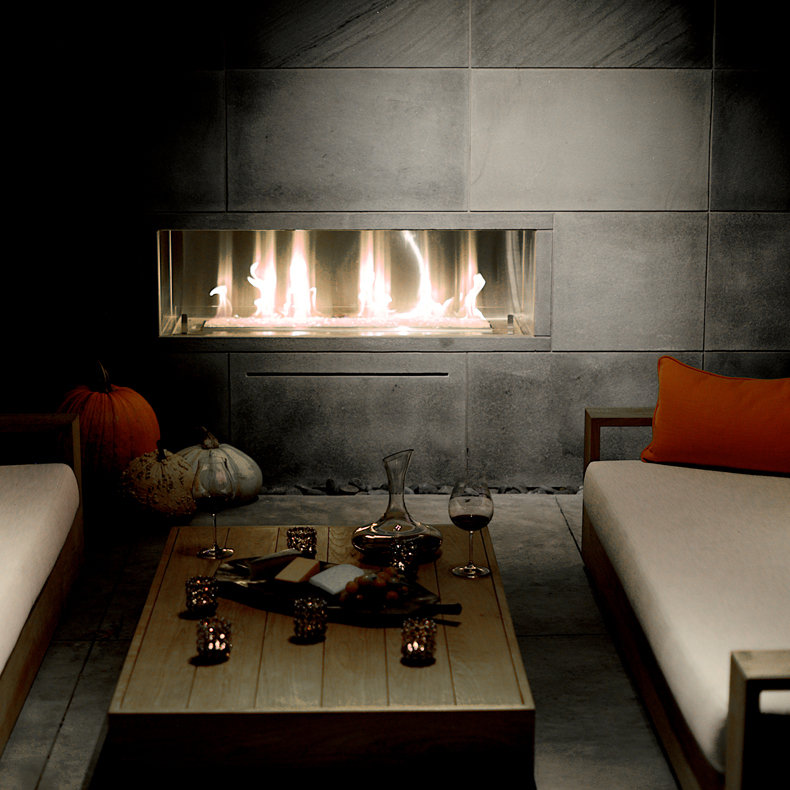 The Linear Burner System Indoor fireplace has a polished concrete base with Japanese INAX dark gray interlocking tile. 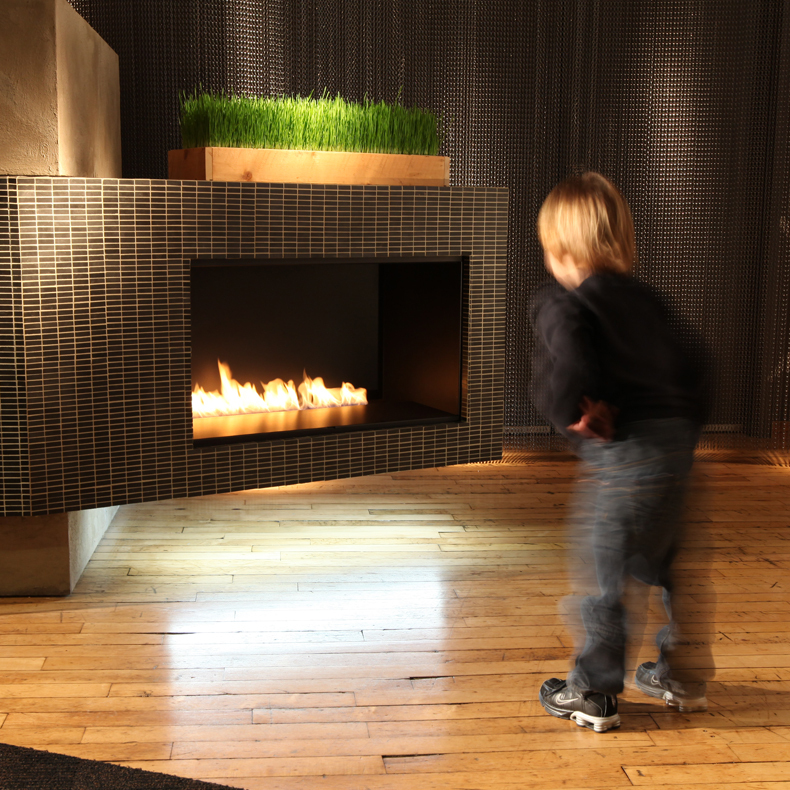 Spark’s fireplace divides the large room into four distinct spaces, creating a unique perspective in each area. 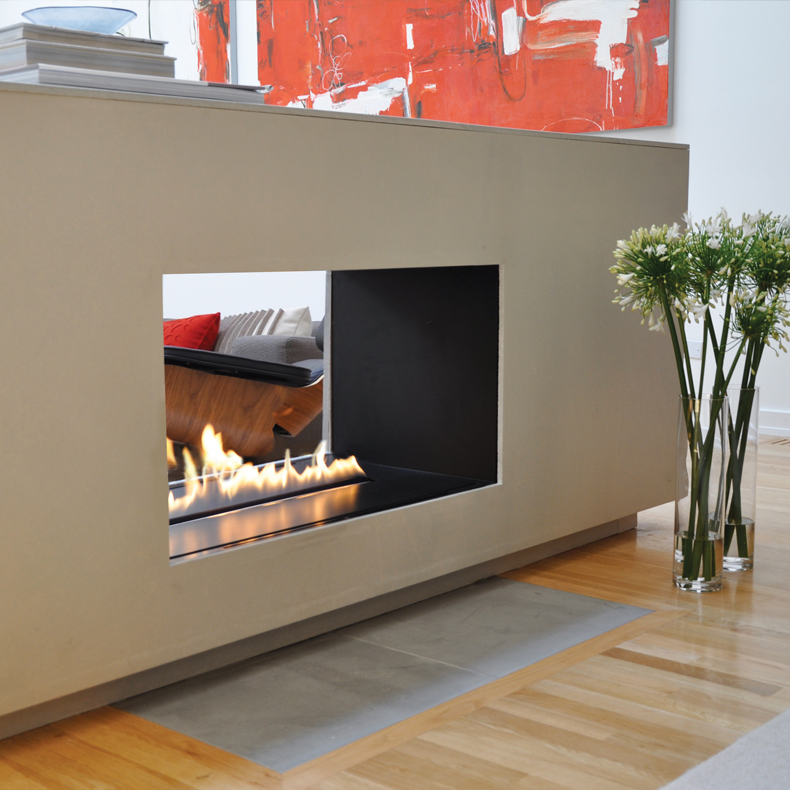 In this installation, the design and function of the Spark fires Tri Vu fireplace is the perfect balance between modern and mid-century style. 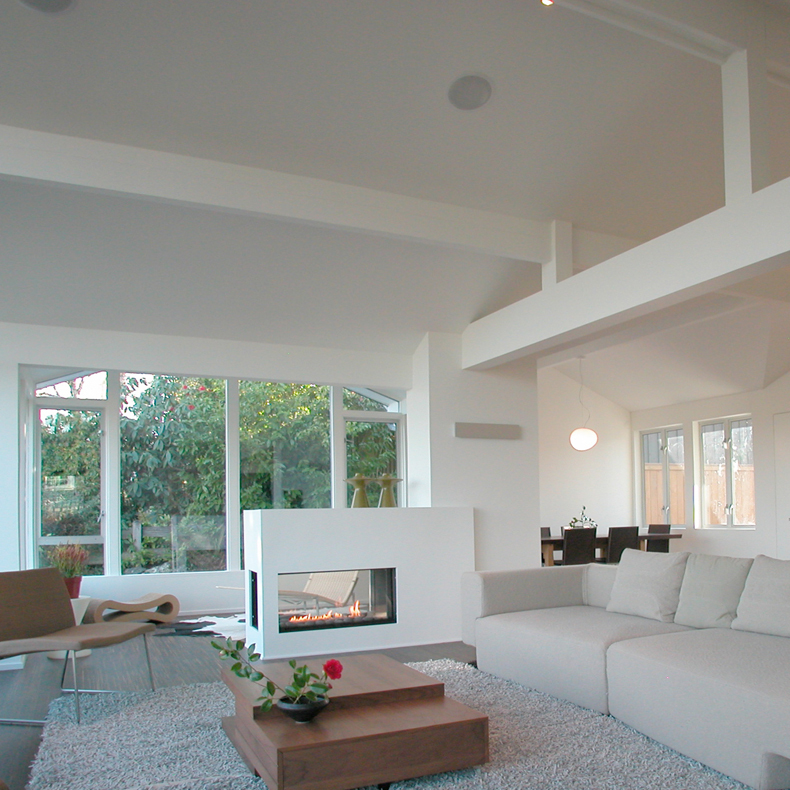 The Spark Direct Vent Tri Vu 3ft Model acts as a focal point in the main living area. 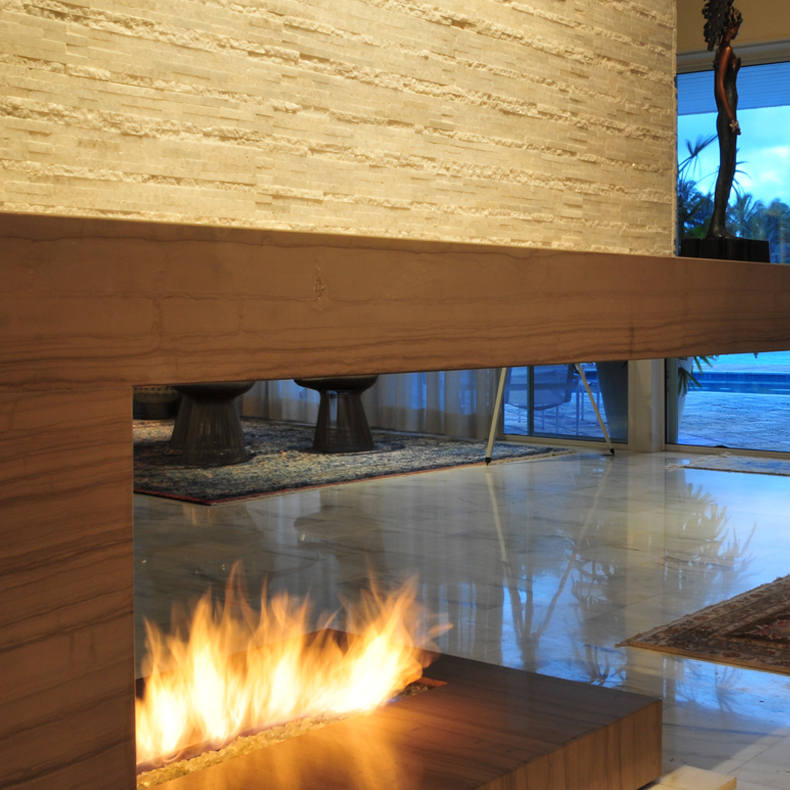 The three-sided fireplace separates the living room, kitchen, and the conversation pit. 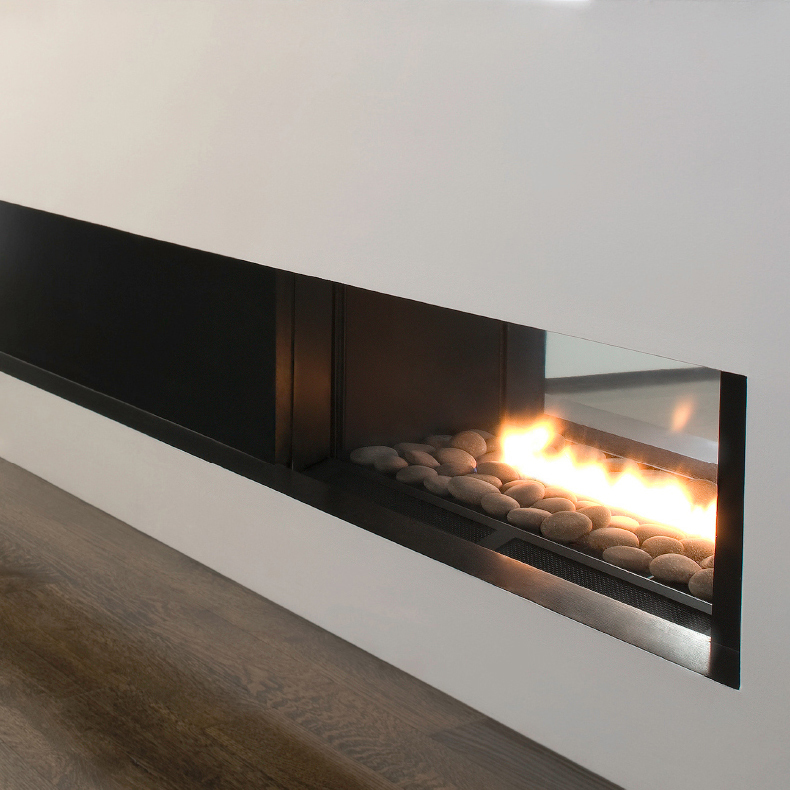 Its sleek lines of the fireplace complement the modern design of the house and enhance the design of the main living space. 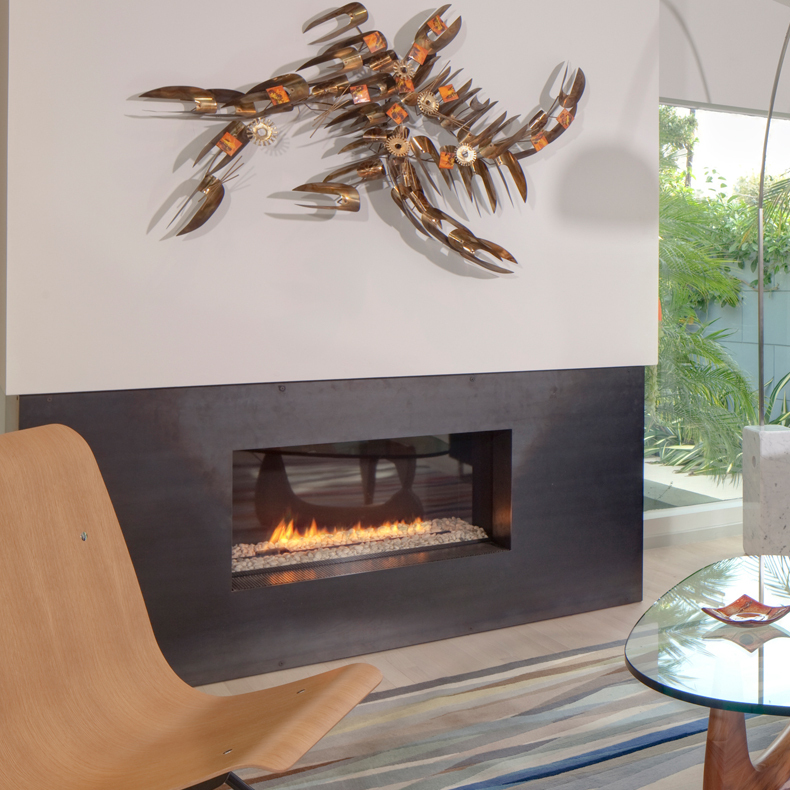 Unlike the traditional fireplace model, this Spark Direct Vent 3ft Tri Vu Model functions as both a captivating piece of contemporary design and wall divider between multiple rooms. 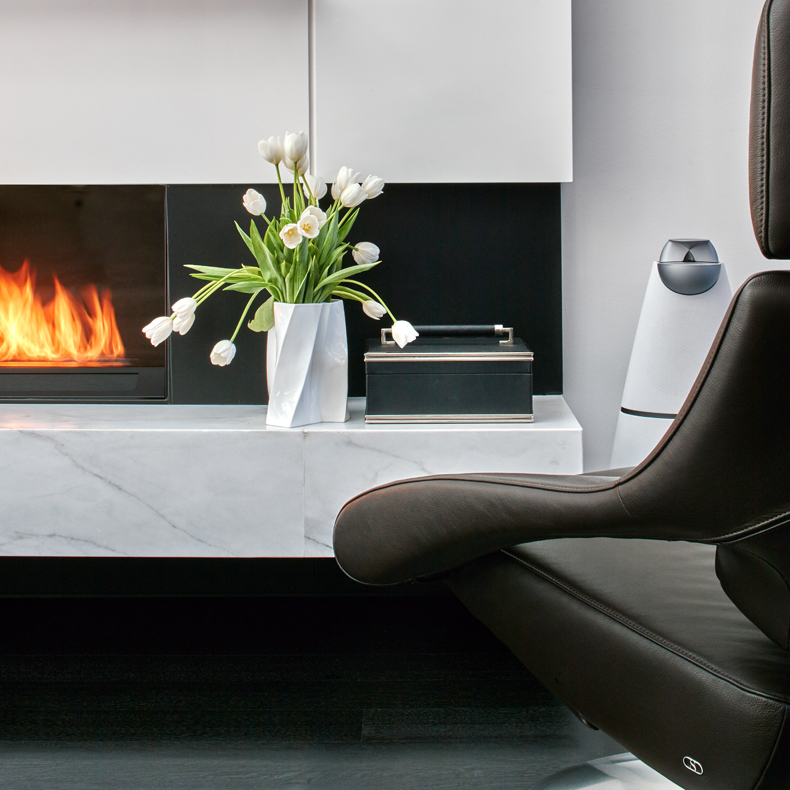 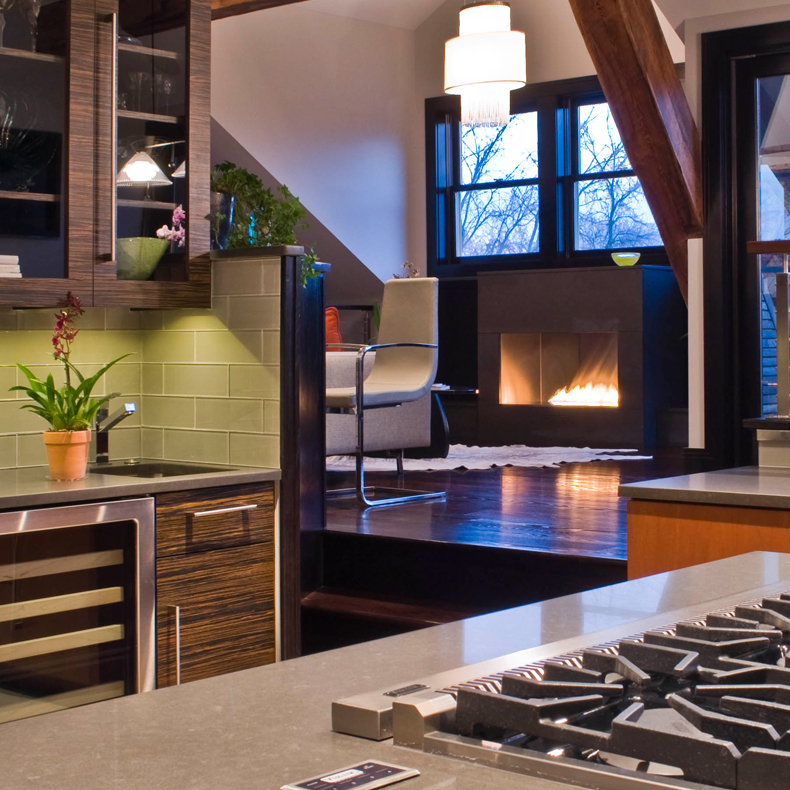 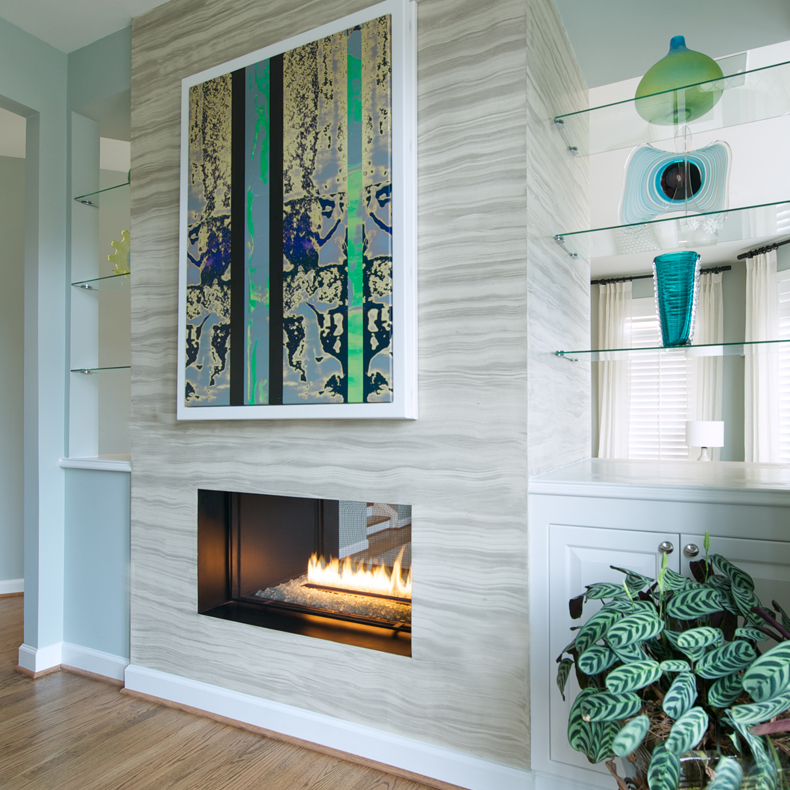 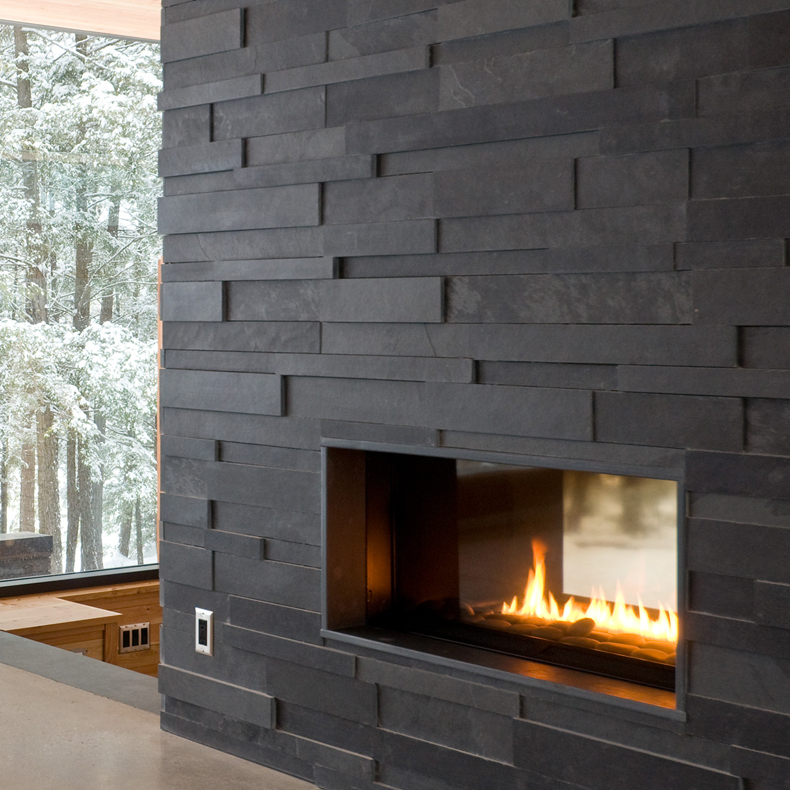 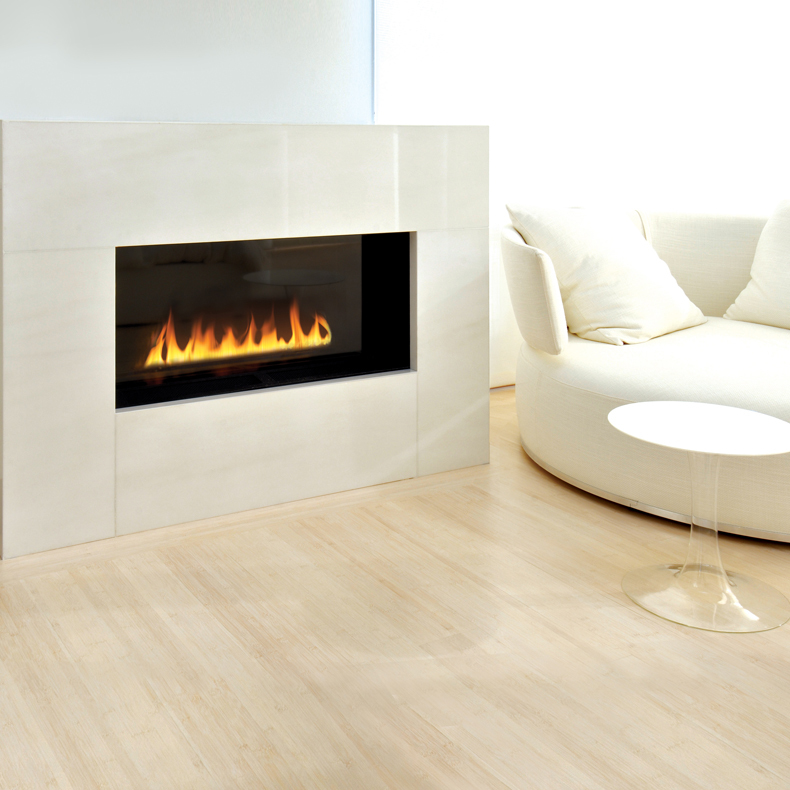 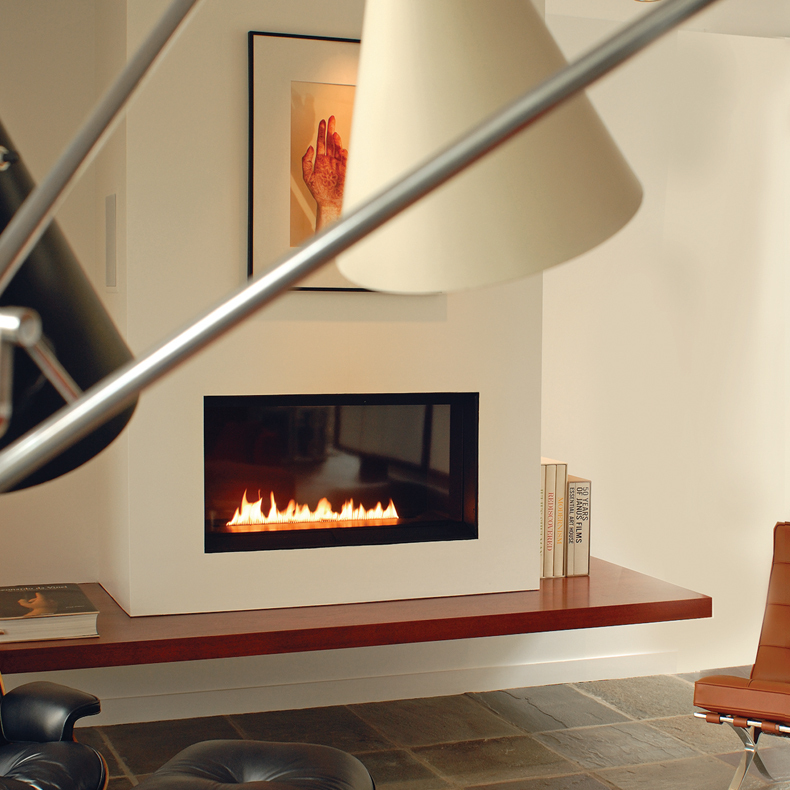 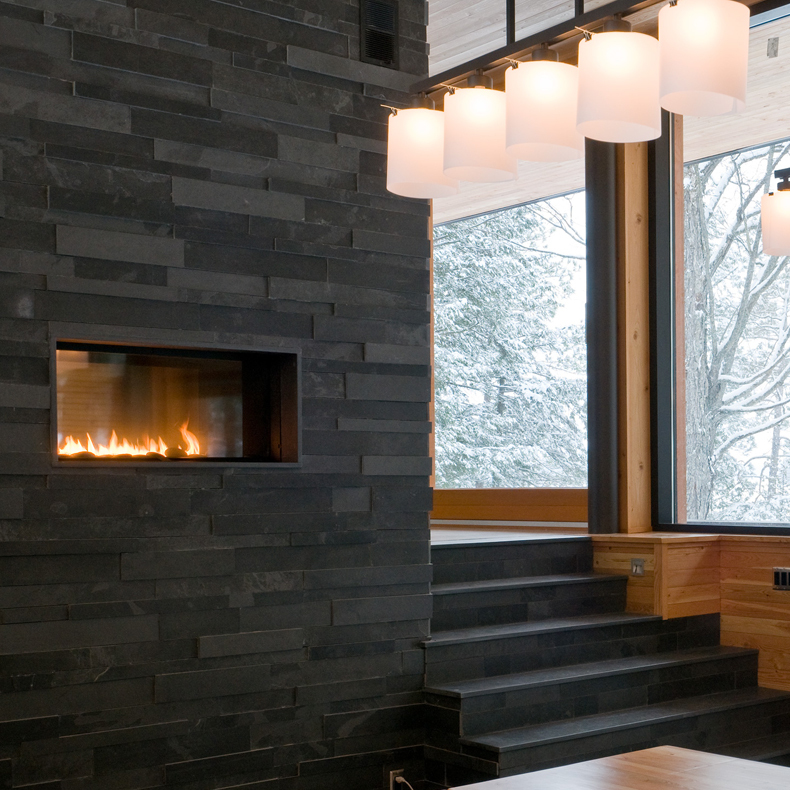 This Spark Tri-Vu Direct Vent fireplace warms a typically cool, modern palate. 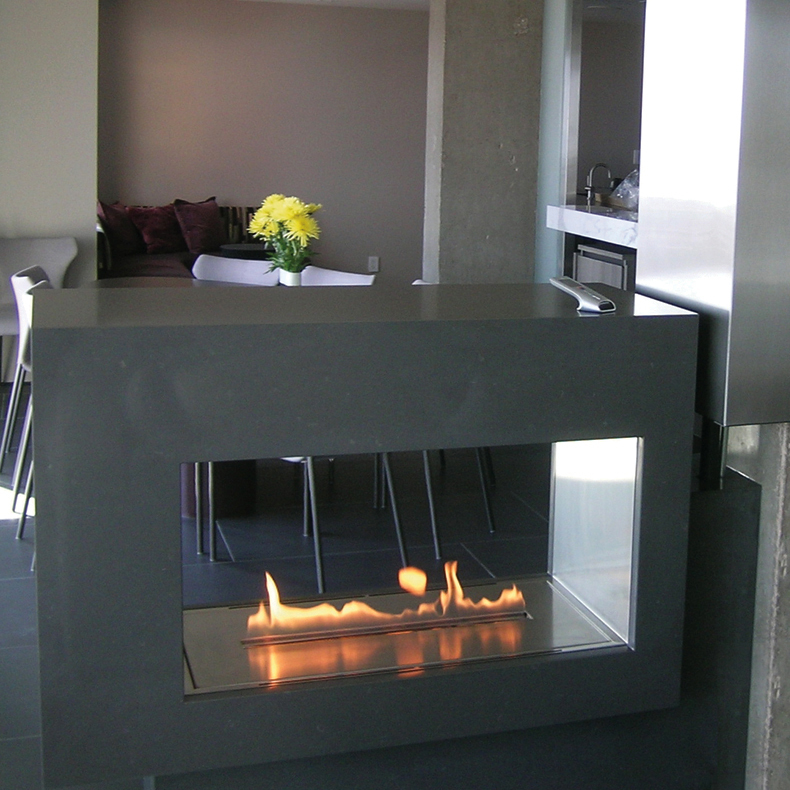 Rather than cladding the chimney with a more typical stone, hot-rolled steel sheet was cut and mechanically fastened to the surround to create a focal point for the large space. 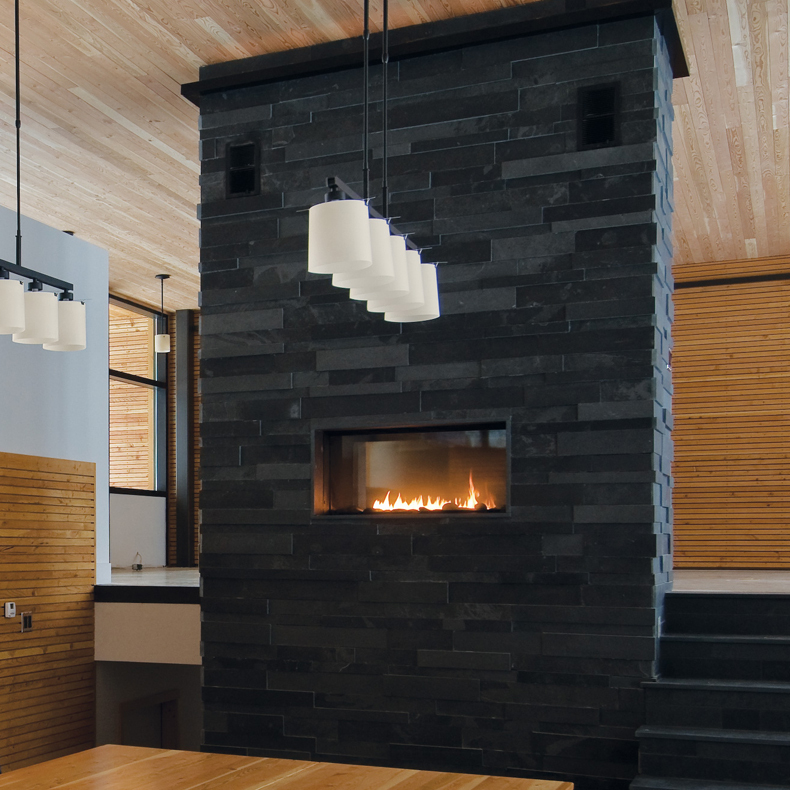 The elegant, clean, and contemporary design of this Spark Direct Vent Vu Thru model allows the user to enjoy its mesmerizing glow in multiple rooms. 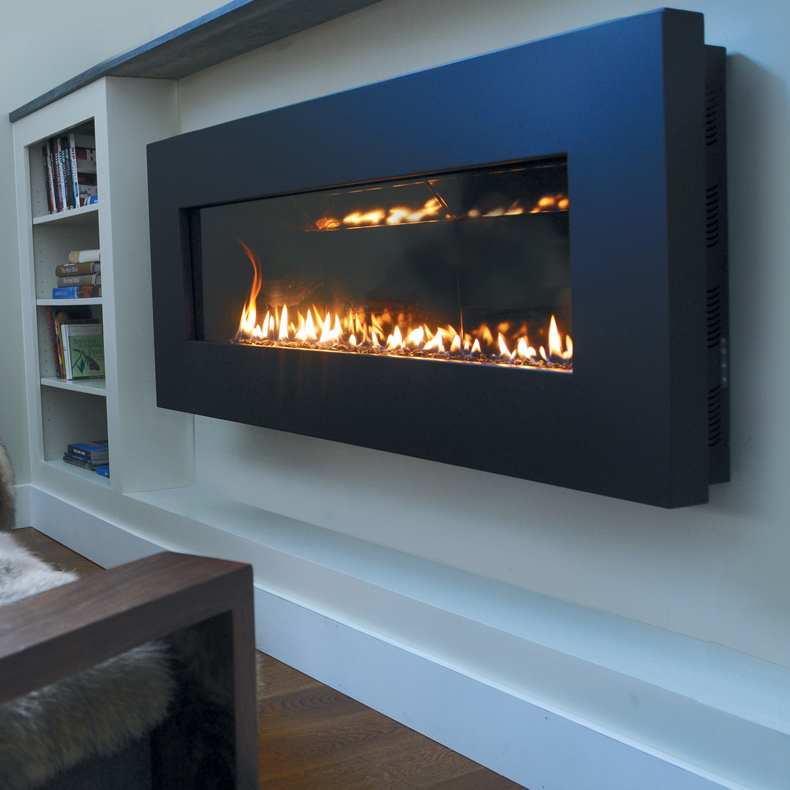 This Direct Vent Vu Thru 3ft Model was specifically selected for its low-to-wide ratio of opening, its energy efficient design, and its reasonable price point. 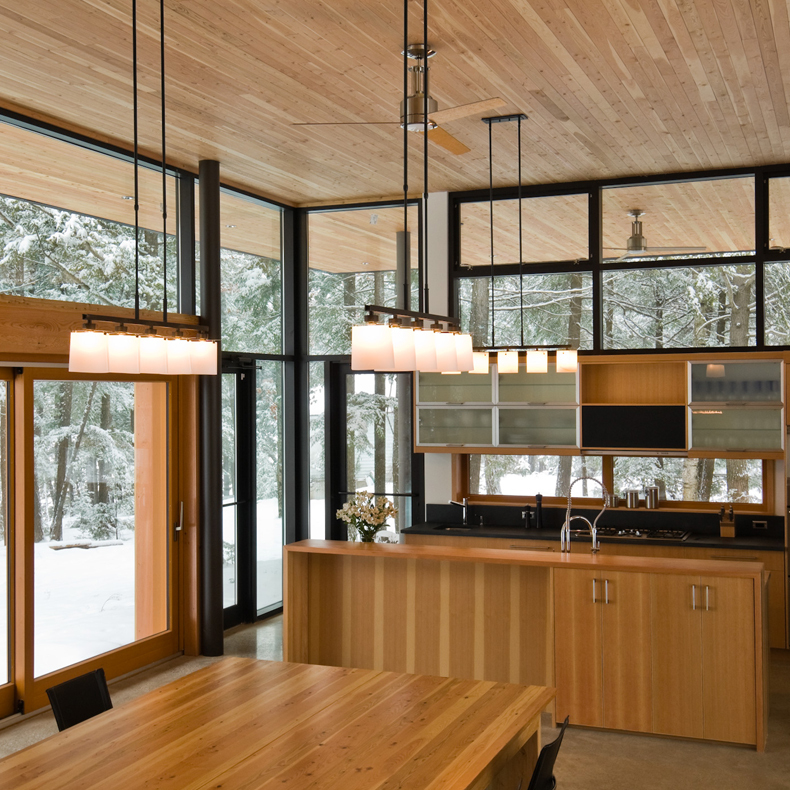 It’s narrow horizontal lines, as well as its transparency; echo those of the dining room window, reinforcing the concept of a linear, River-centric view. 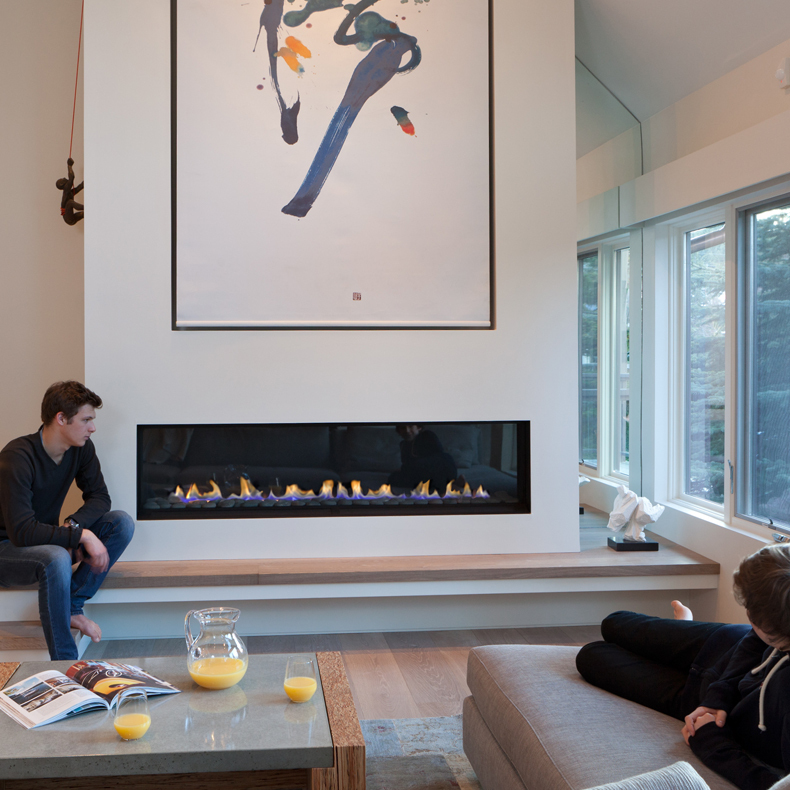 This dual-sided Spark Direct Vent Vu Thru 3ft Model 91 acts as an anchoring element for the two rooms of this modern cottage. 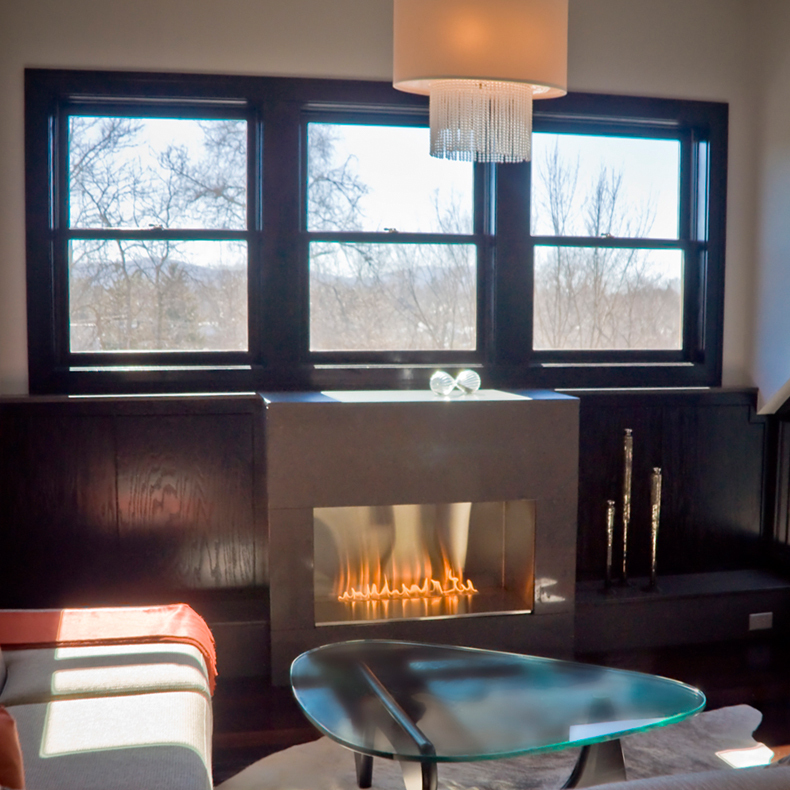 The fireplace frames a focal point for both the living and dining rooms. 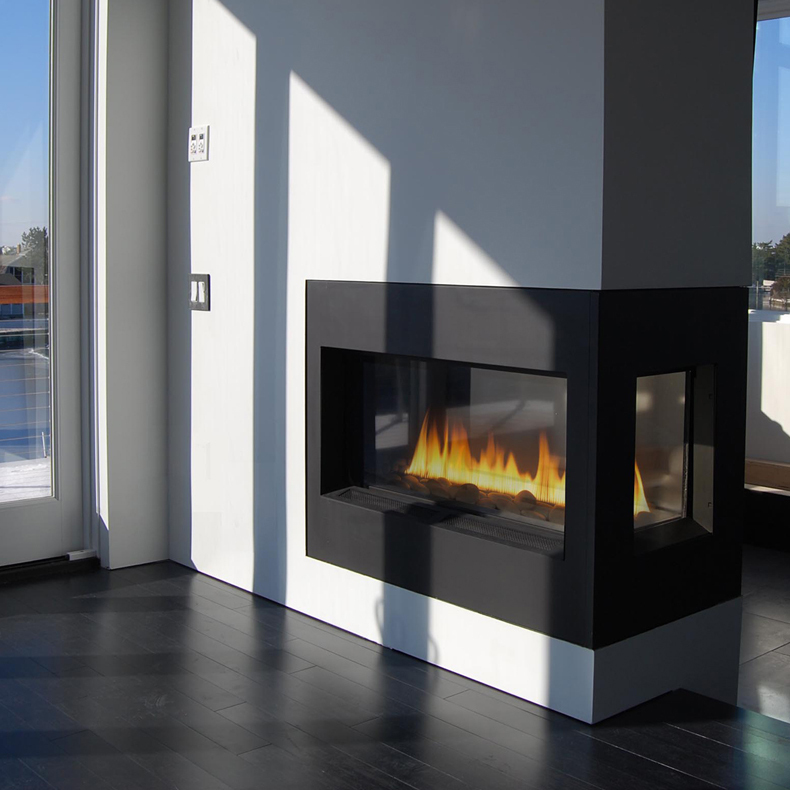 In this project, the Spark Direct Vent Vu Thru 3ft Model creates a charisma that is completely irresistible. 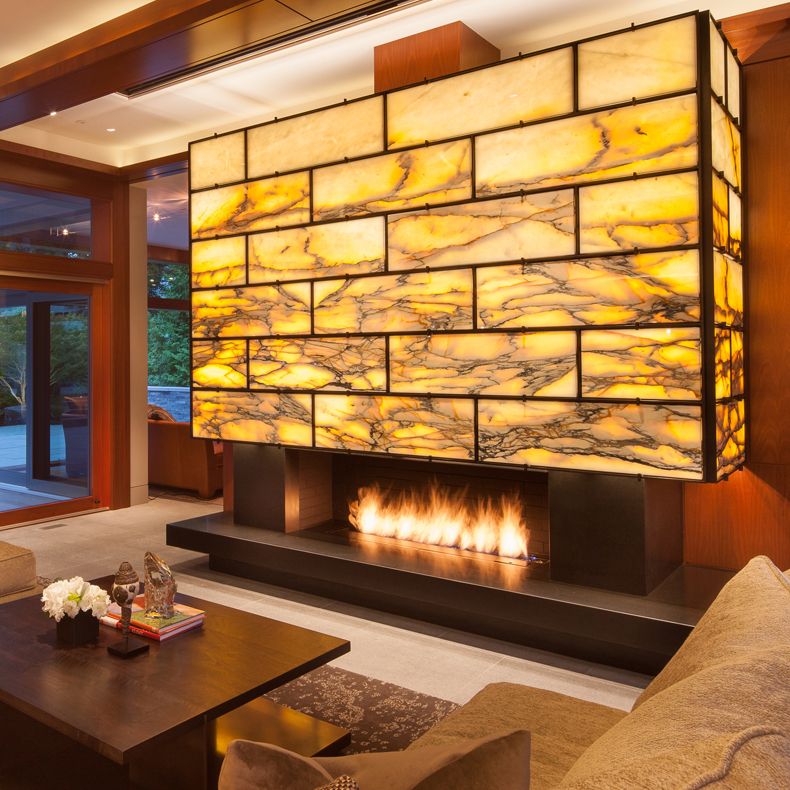 The fascinating ribbons of flames are visible from two sides, creating a statement in both rooms. 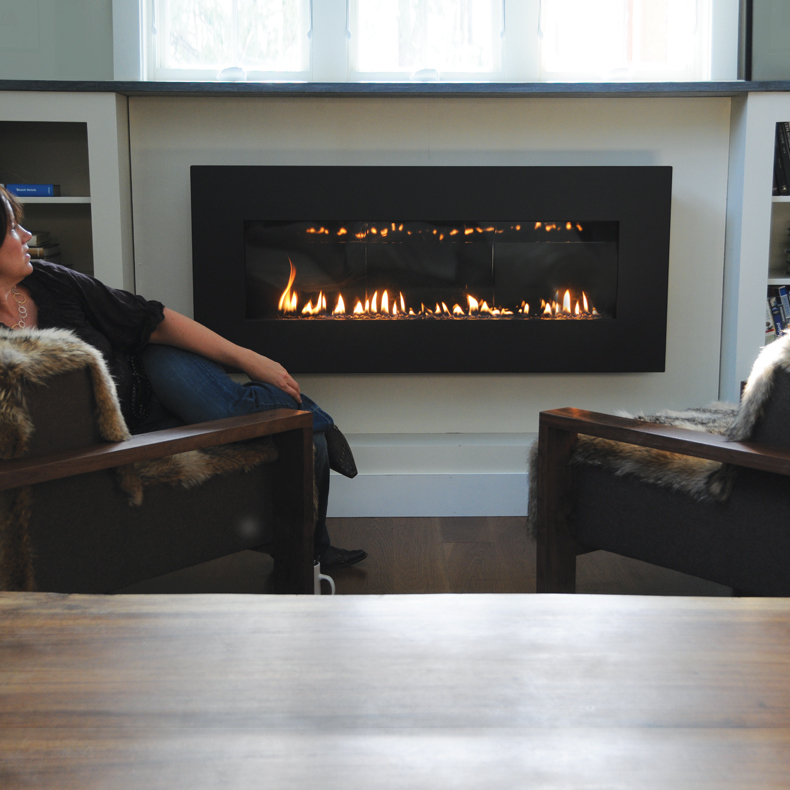 This Spark Direct Vent 6ft Model offers contemporary aesthetics and functional ambiance inside this modern ranch. 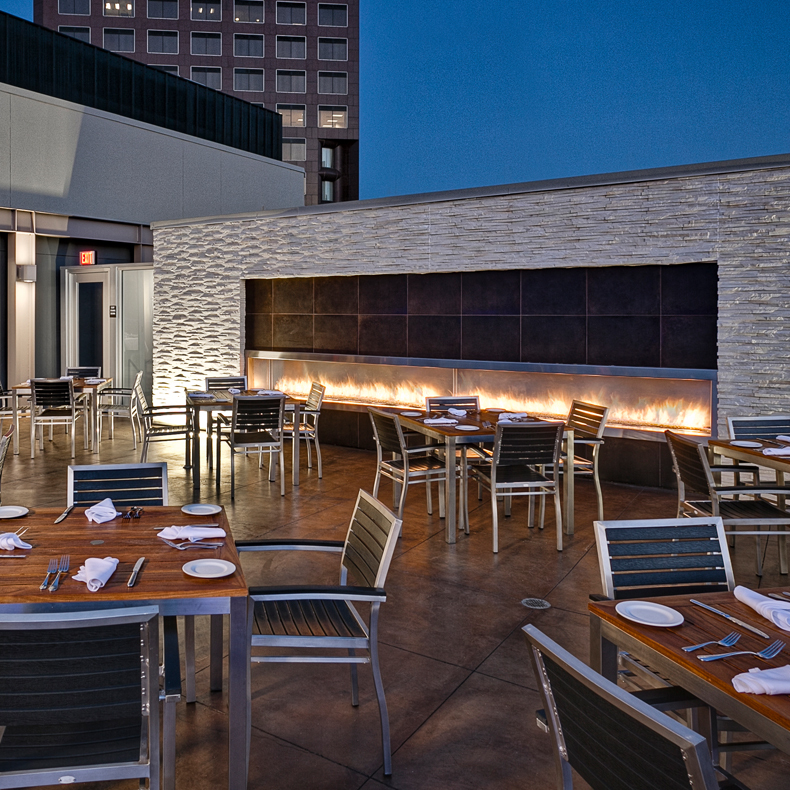 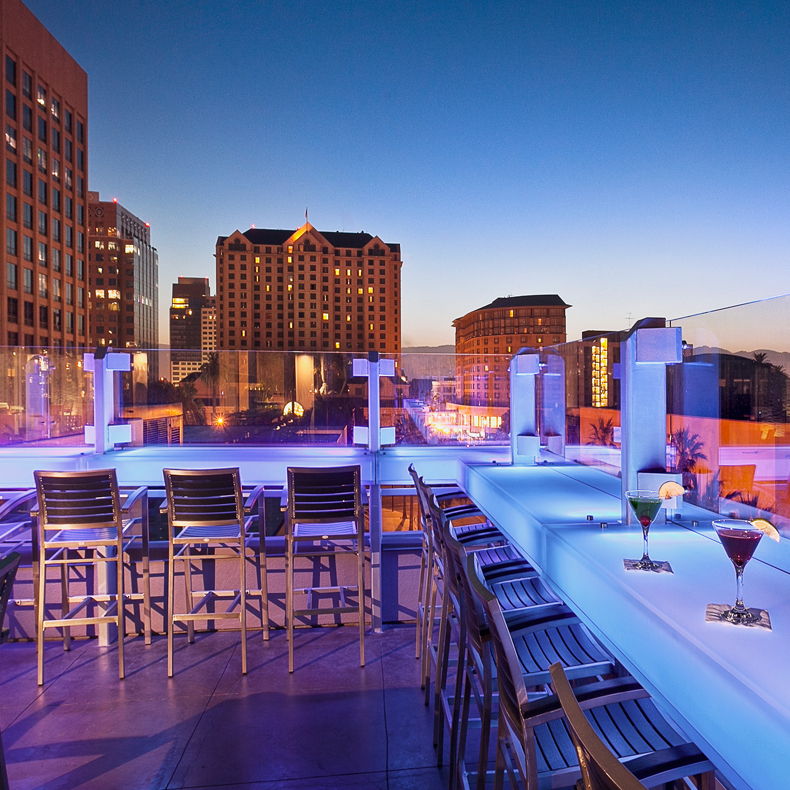 Spark’s Direct Vent 6ft Model acts as a divide between three dining experiences: an enclosed patio, an indoor bar/lounge area with communal dining tables, and an intimate mezzanine with views of Venice. 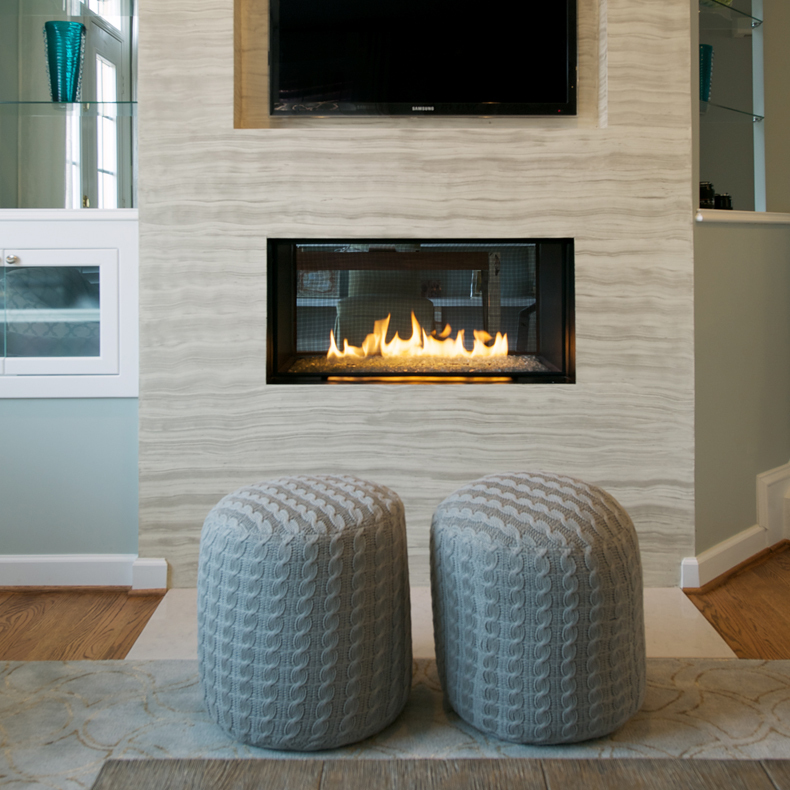 This delicate balance of function and flair enables the homeowners to enjoy the Direct Vent 6ft Model’s warmth in cold winter months. 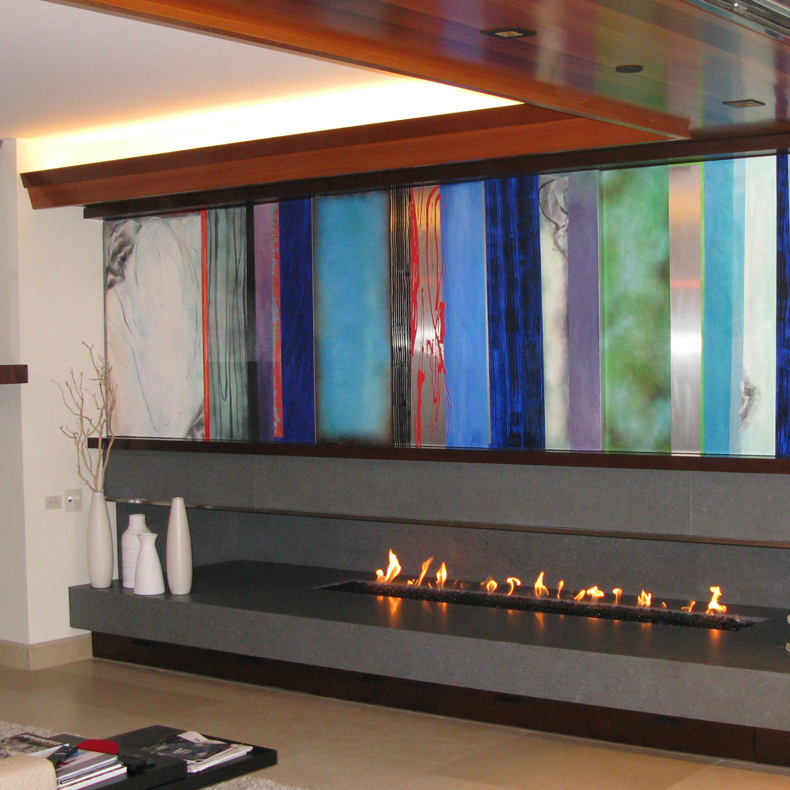 In this project, the elegance of the “onyx mural” reflects the simplicity of the 6’ linear fireplace design- creating a beautiful atmosphere. 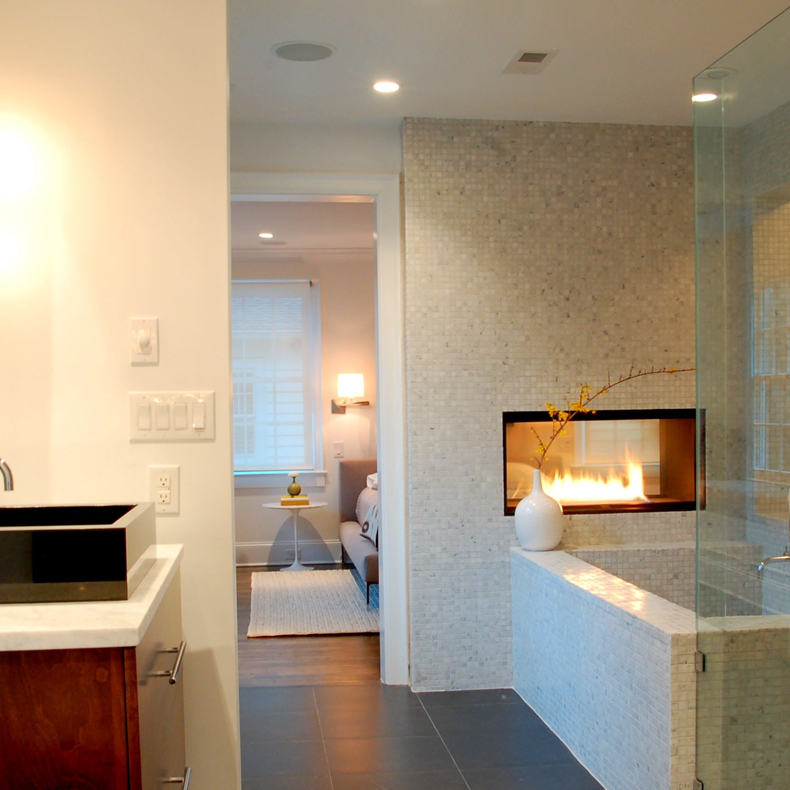 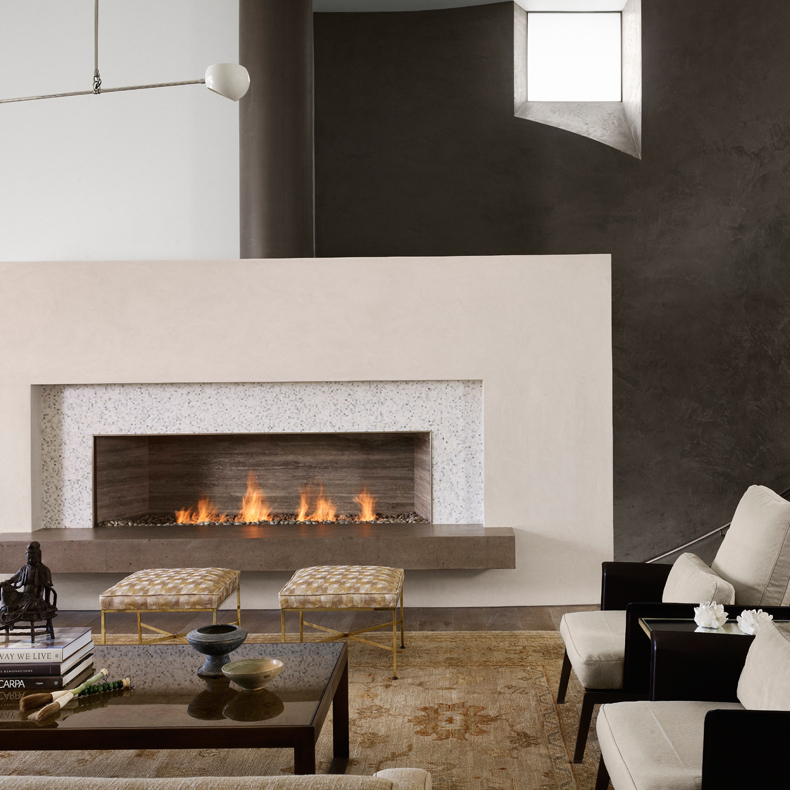 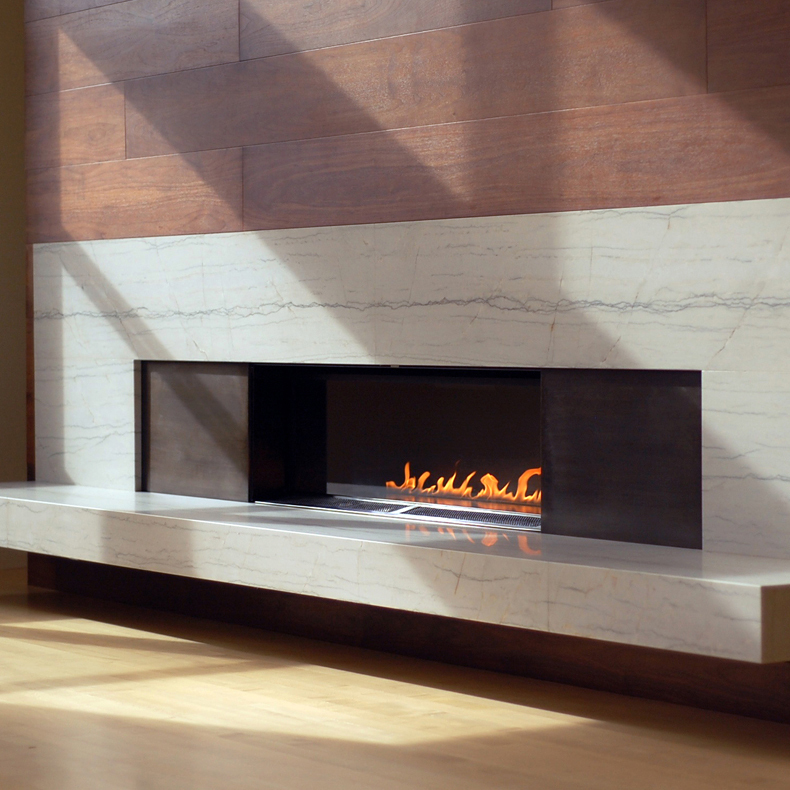 A white quartzite cantilevered hearth and surround incorporates the beautiful 4′ long linear fireplace. 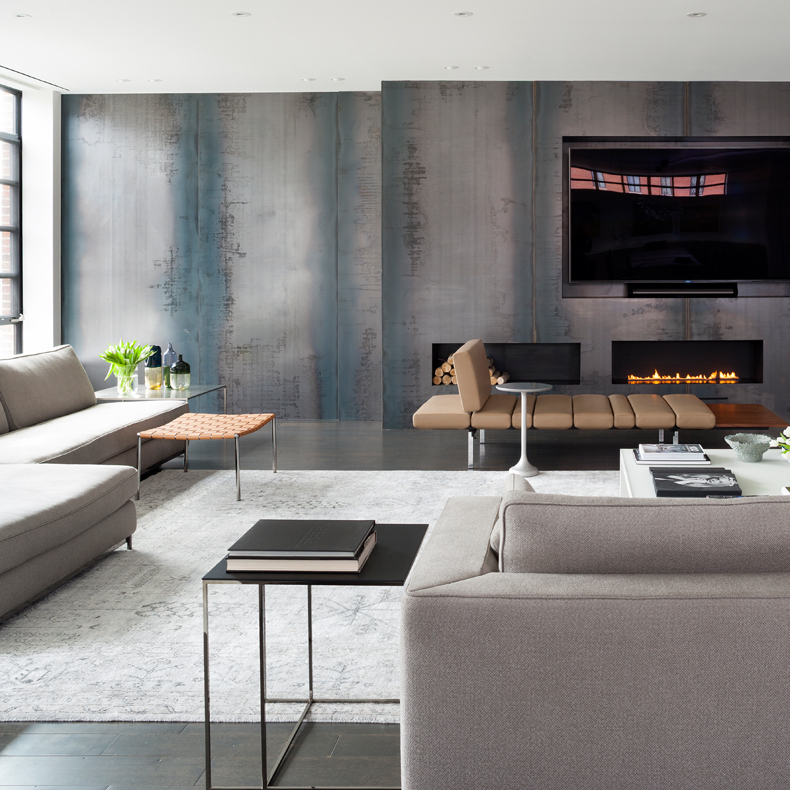 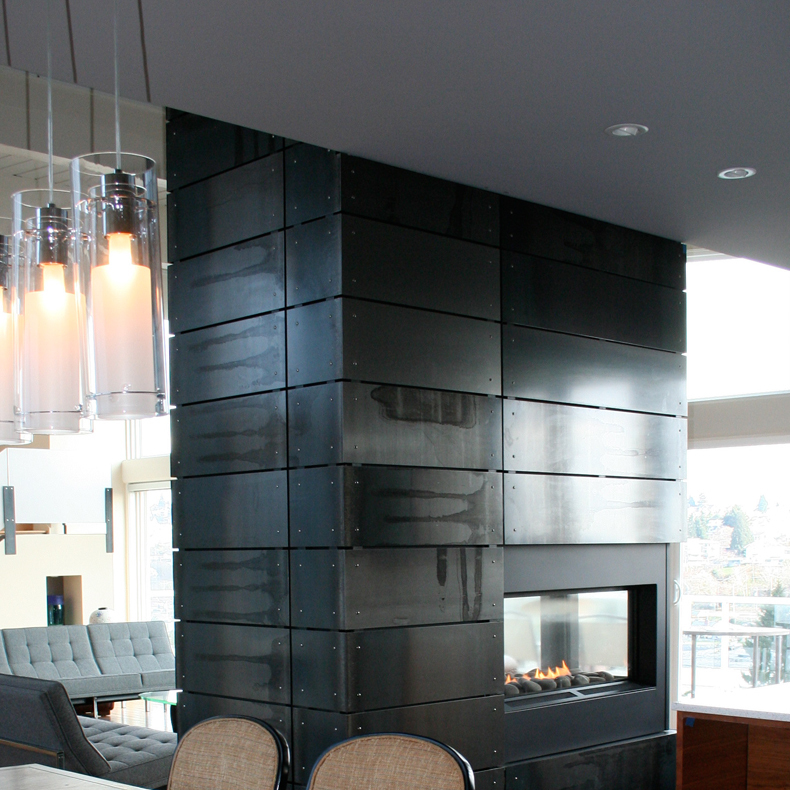 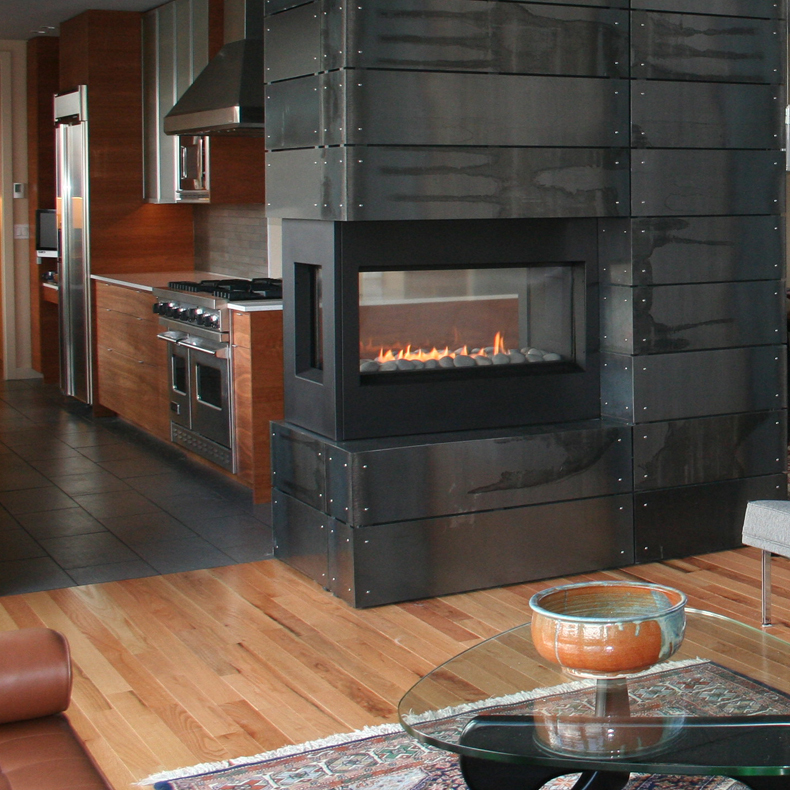 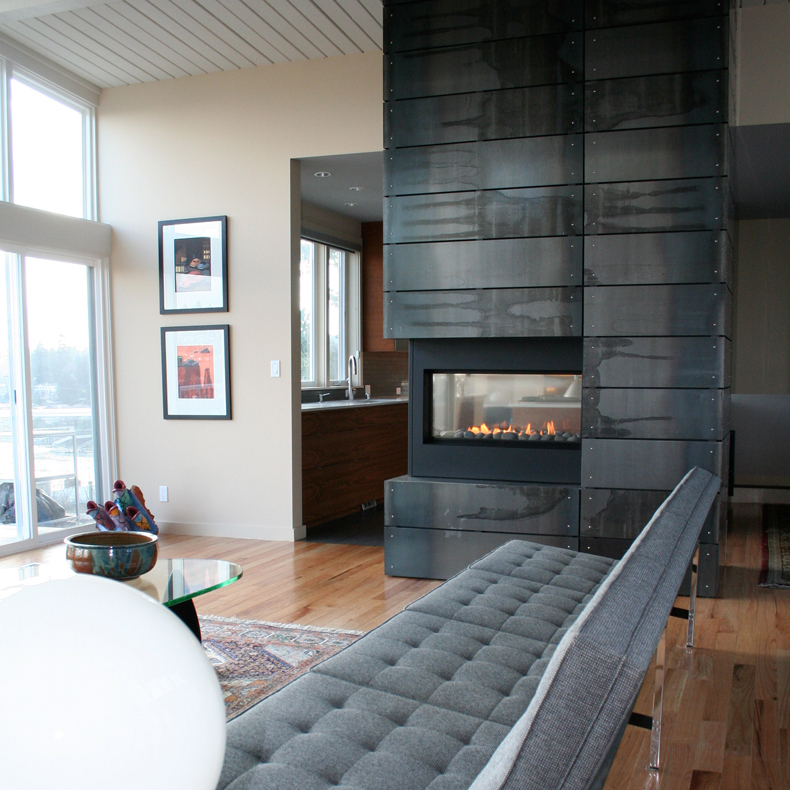 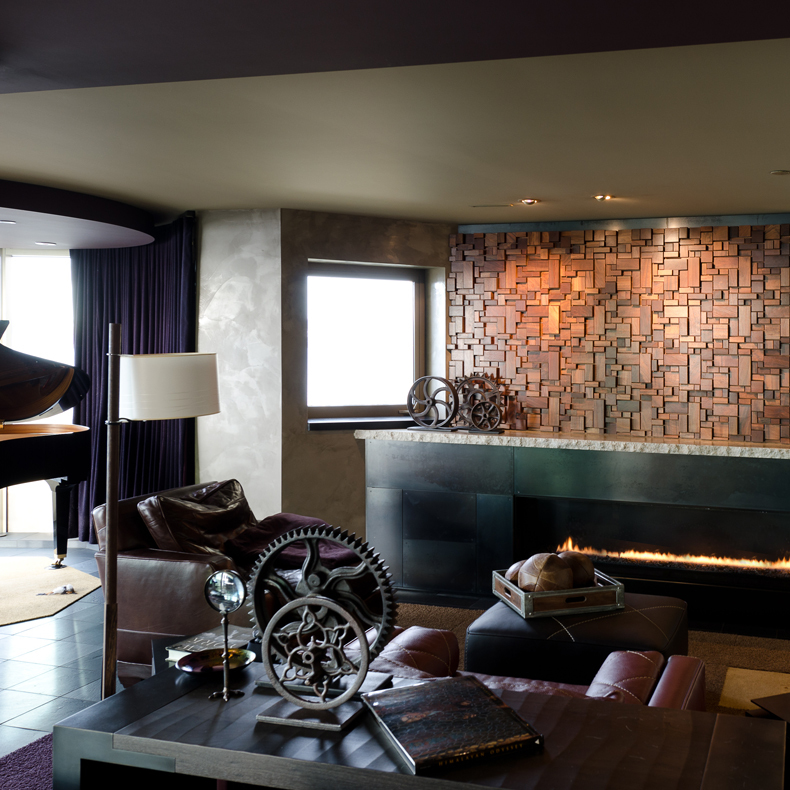 Blackened steel panels flank the fireplace extending its appearance. 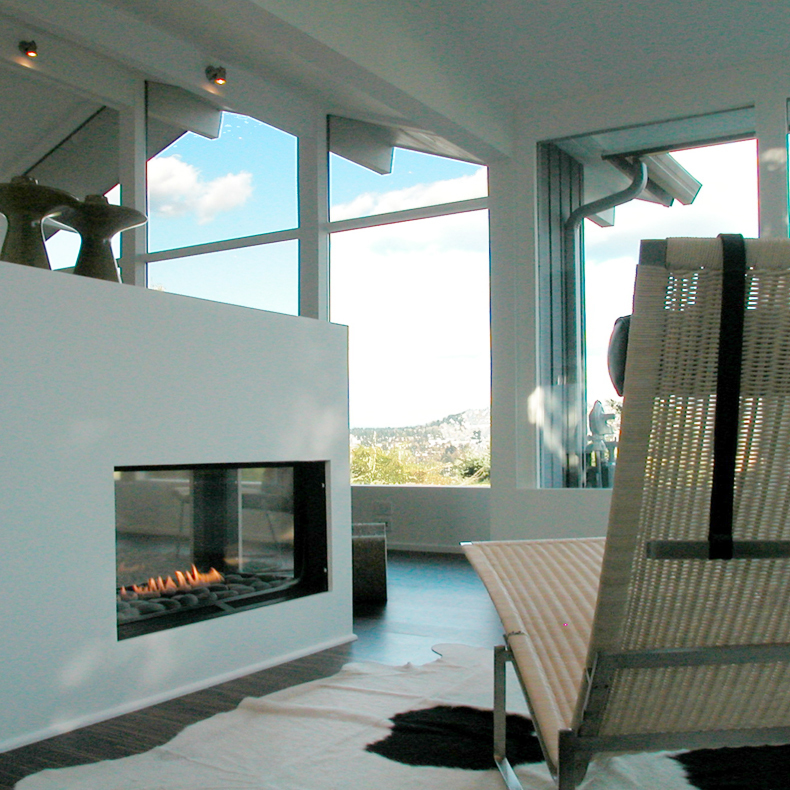 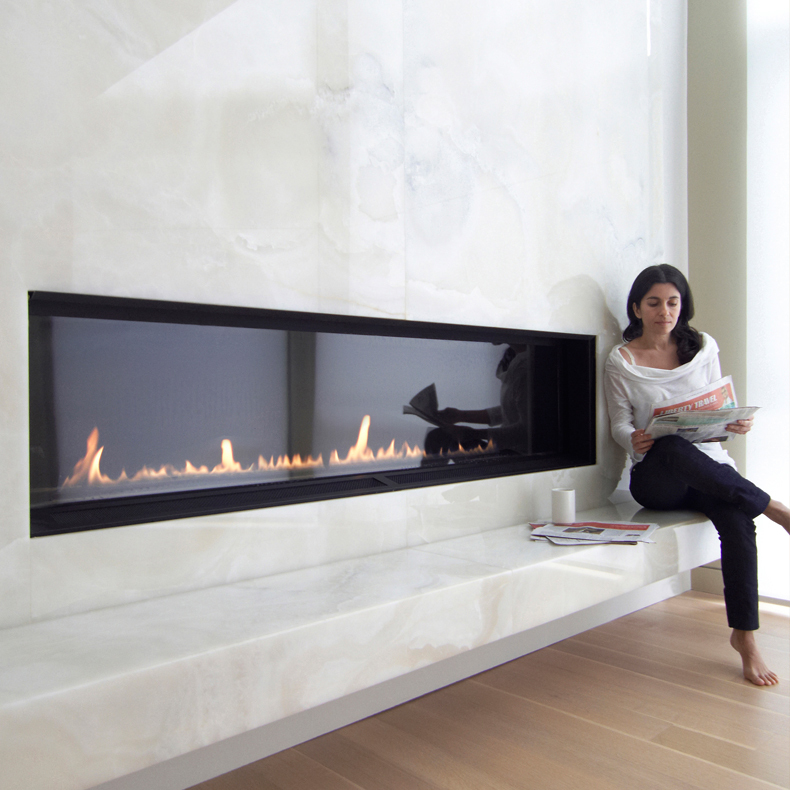 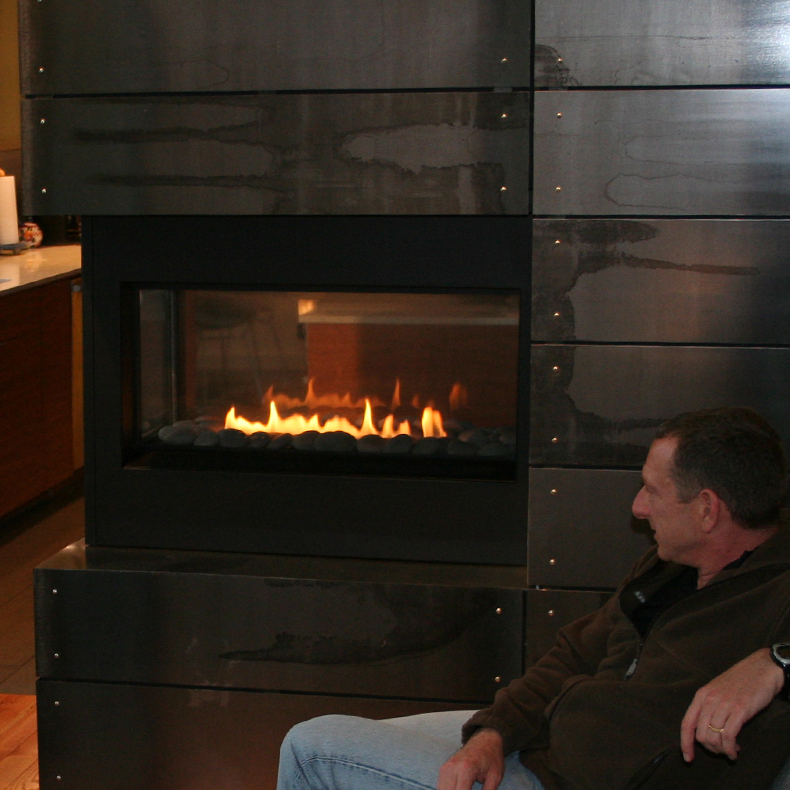 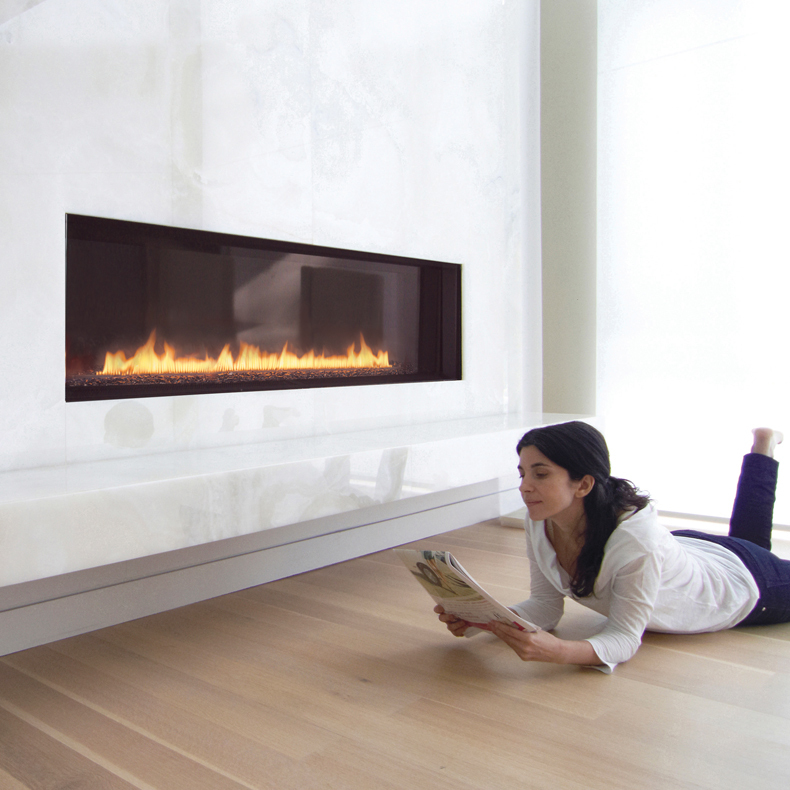 The embedded installation of Spark’s Direct Vent 4ft Model fireplace allows for great flexibility in the room. 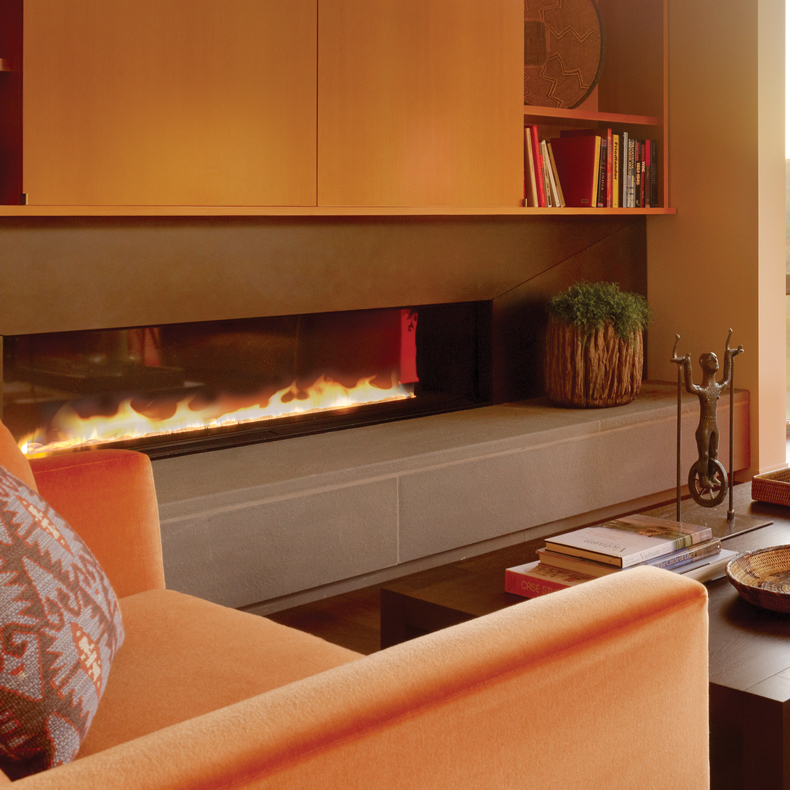 This Spark Direct Vent model enlivens the space providing a rich glow perfect for relaxation and entertaining. 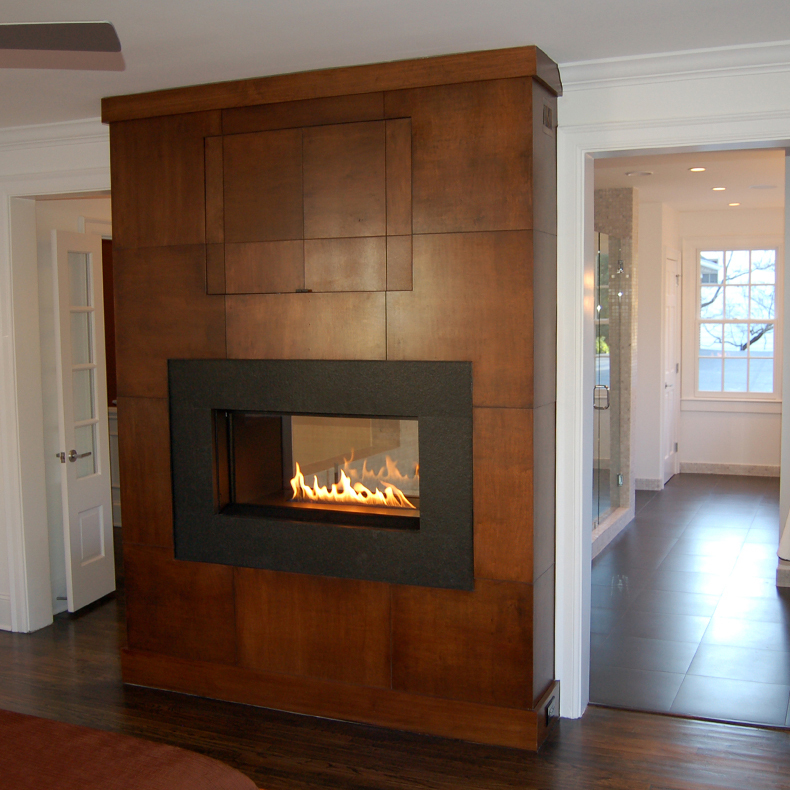 This project features a Spark Direct Vent 3ft Model. 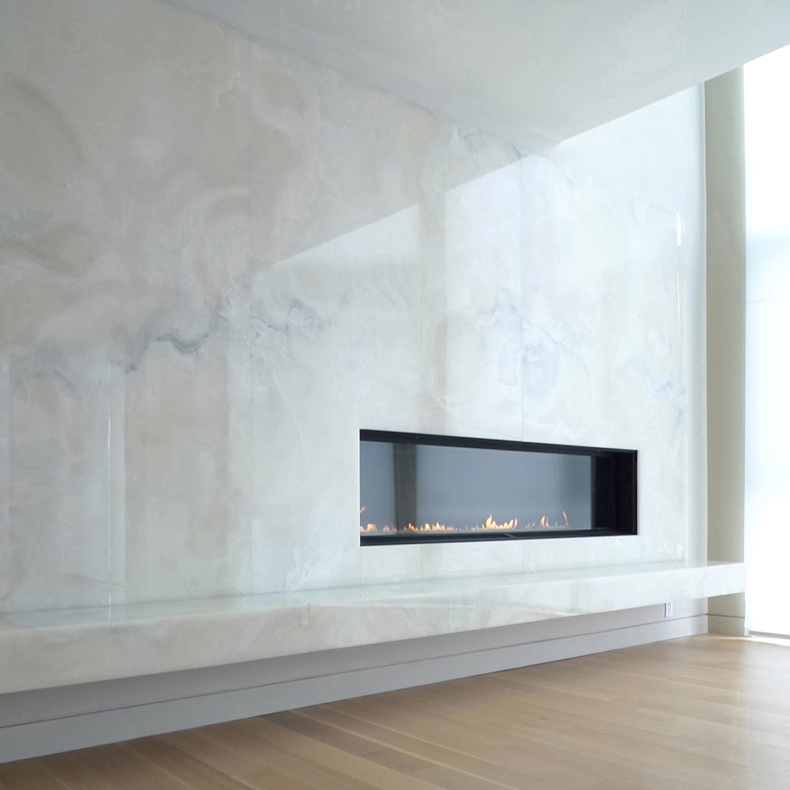 The model creates an elemental, sparse backdrop for the magic of its flame. 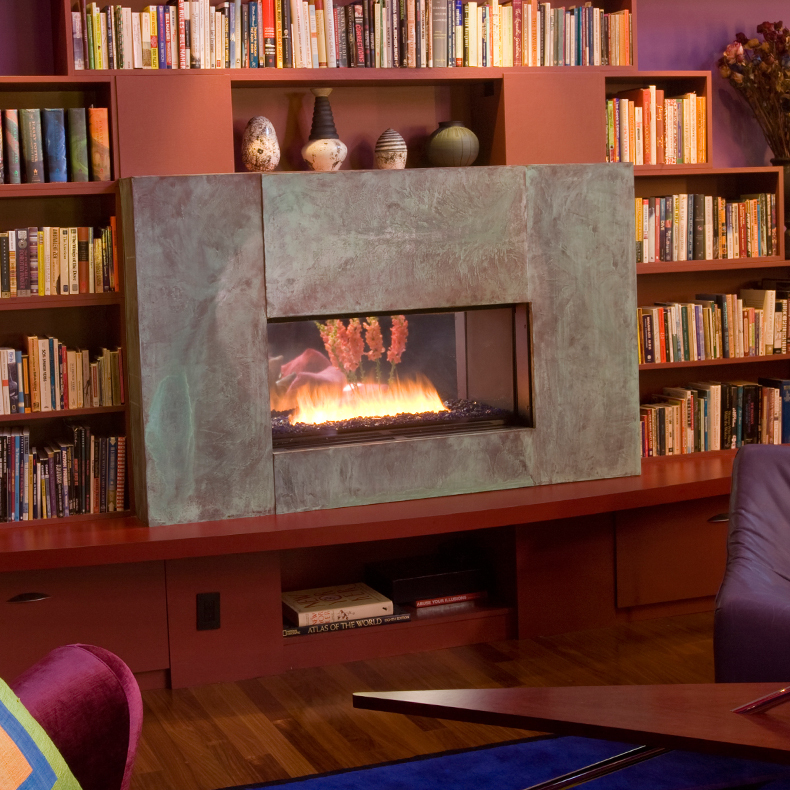 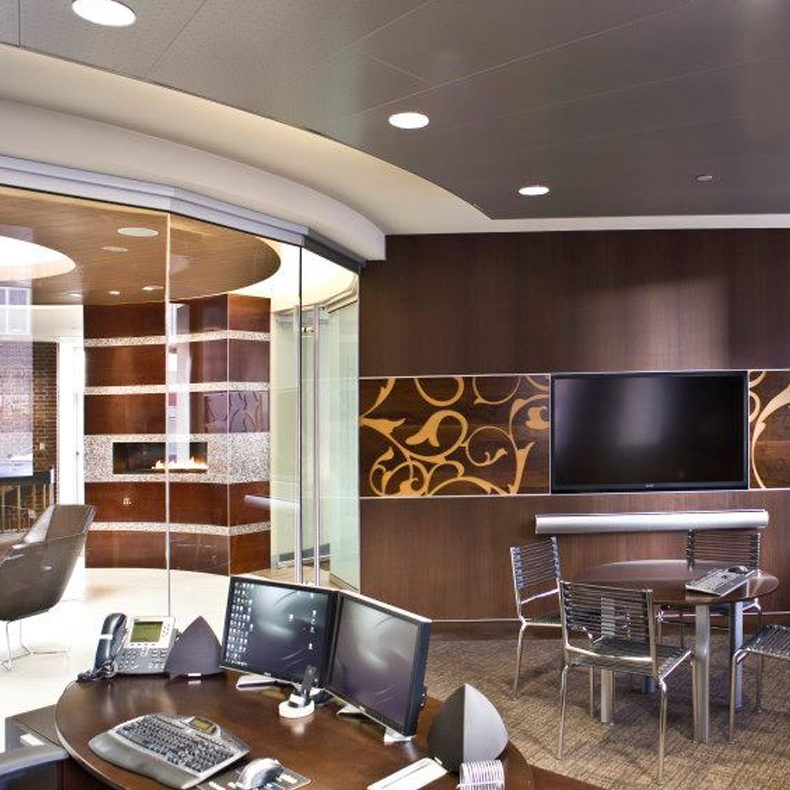 This installation carefully integrates Spark’s Direct Vent 3ft Model into the design of a surrounding book wall and anchors the adjacent furnishings. 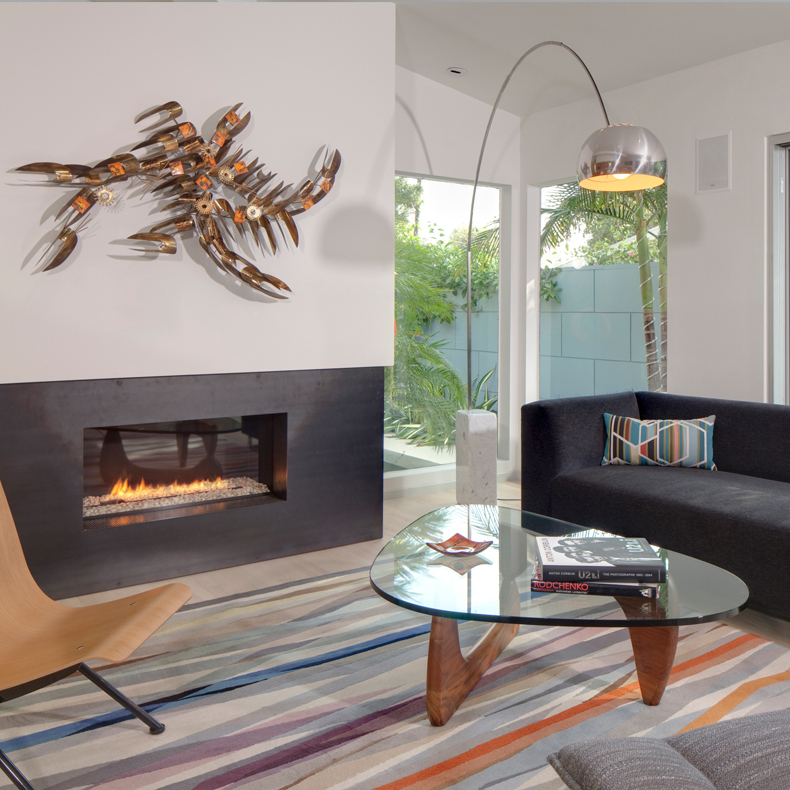 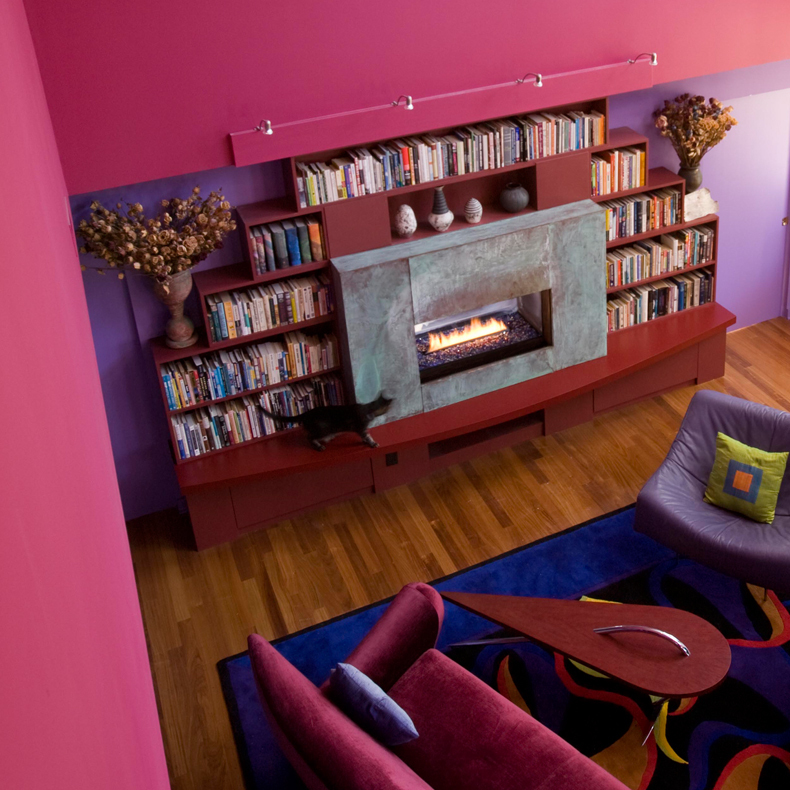 The copper tones and the warm hues of the fire, serve to enrich the multi-color rainbow that defines this home. 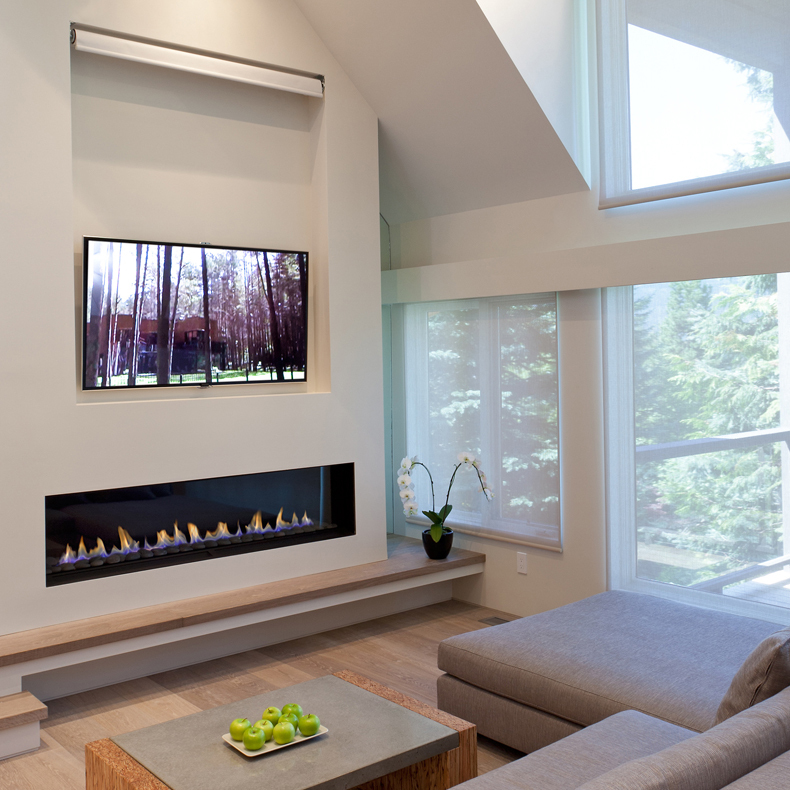 In this very open layout, the Spark Vent Free 3ft Vu Thru Model acts as both a visual divide and fire feature, between the living room and dining room. 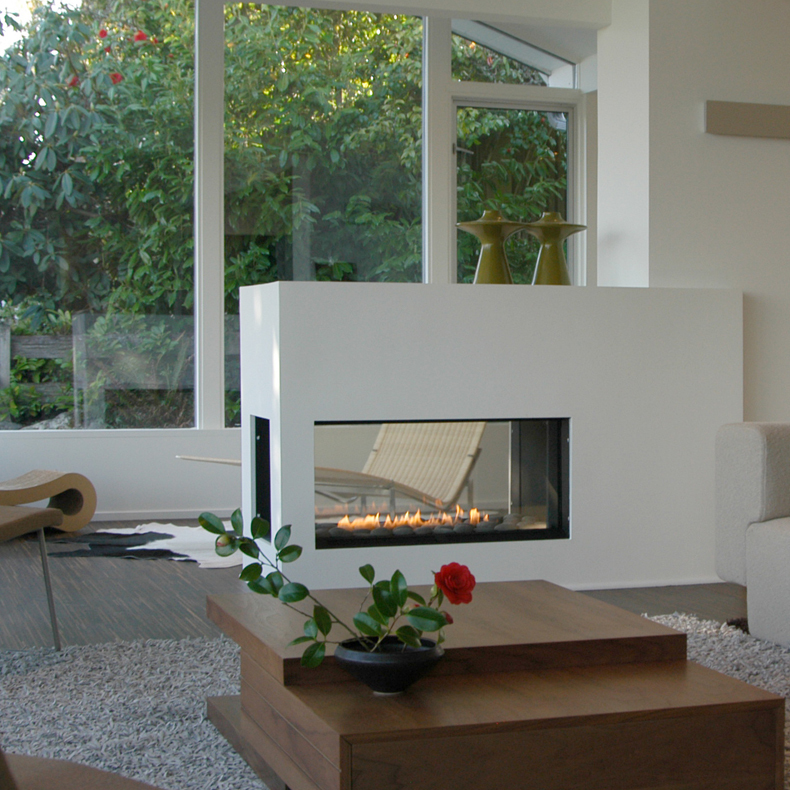 In this installation- the Spark Vent Free 3ft Vu Thru Model 54 serves as a functional piece that provides warmth while entertaining guests. 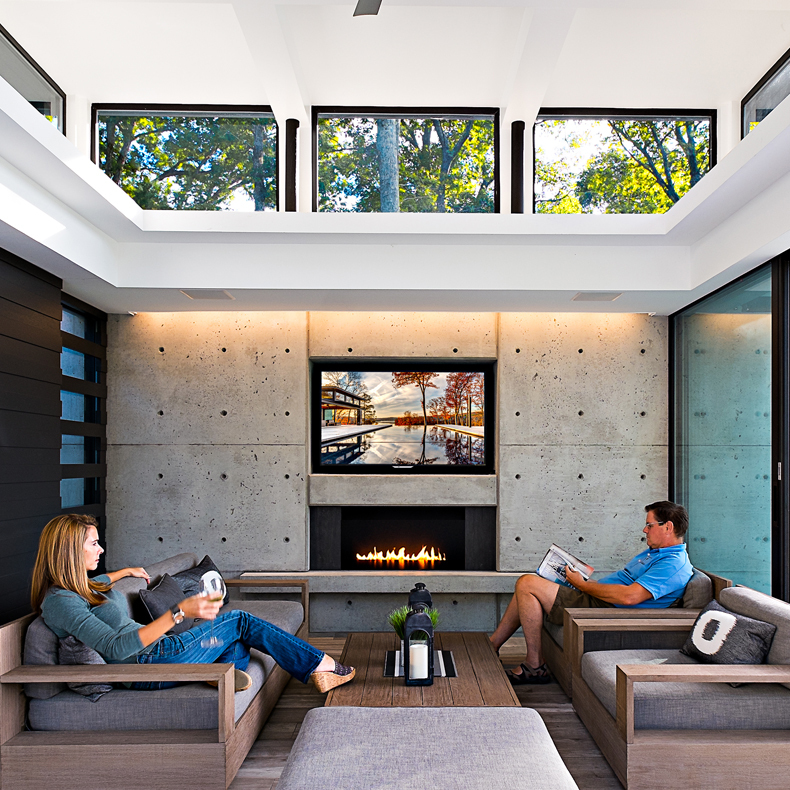 Spark’s Vent Free 3ft installation features state-of-the-art technology for extraordinary performance. 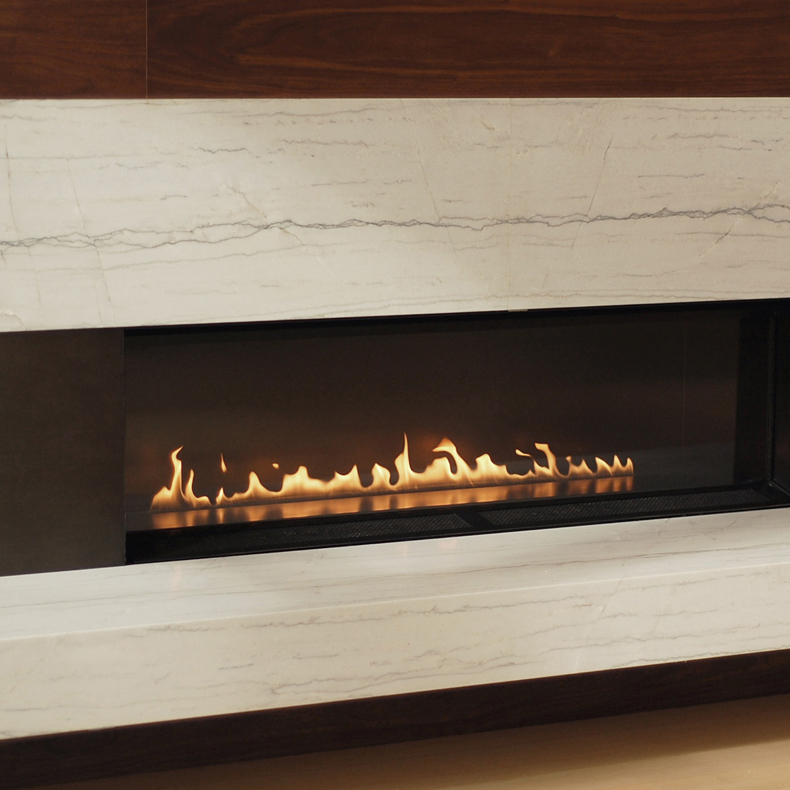 Ribbons of flames dance inside the vent free burner, reflecting light off the marble and hardwood. 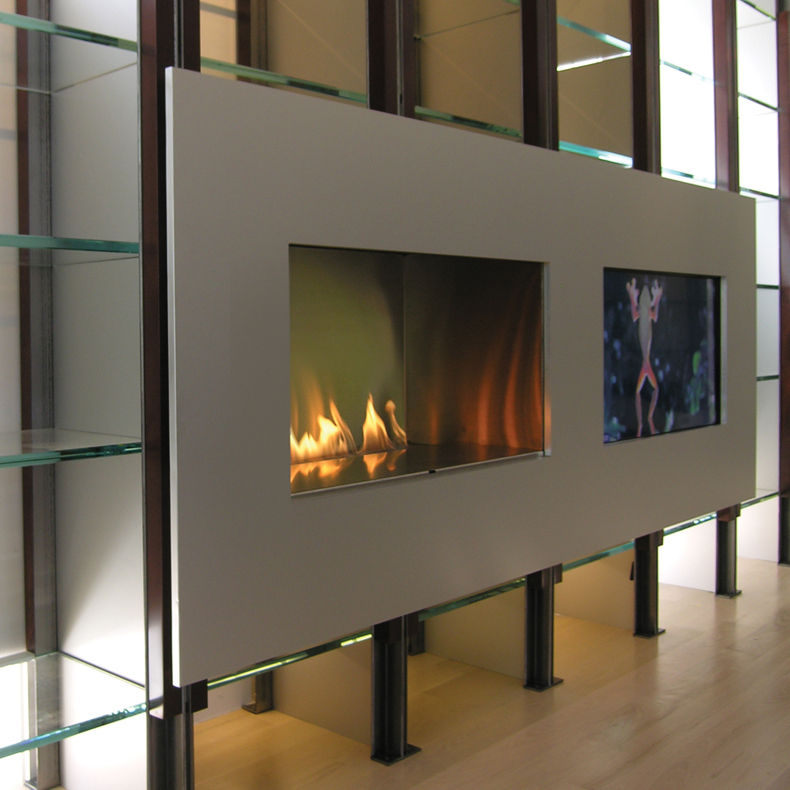 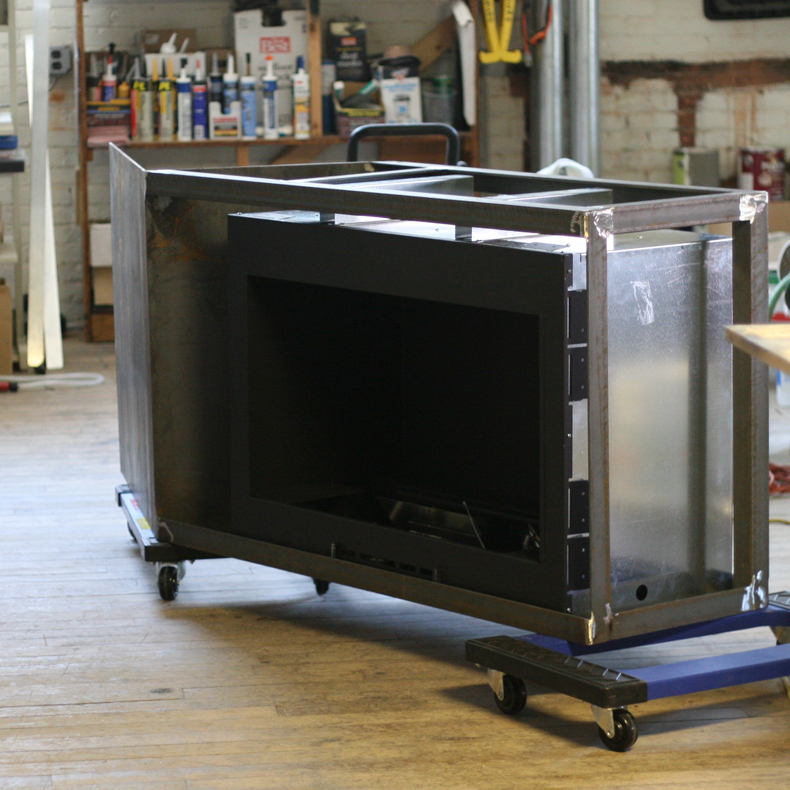 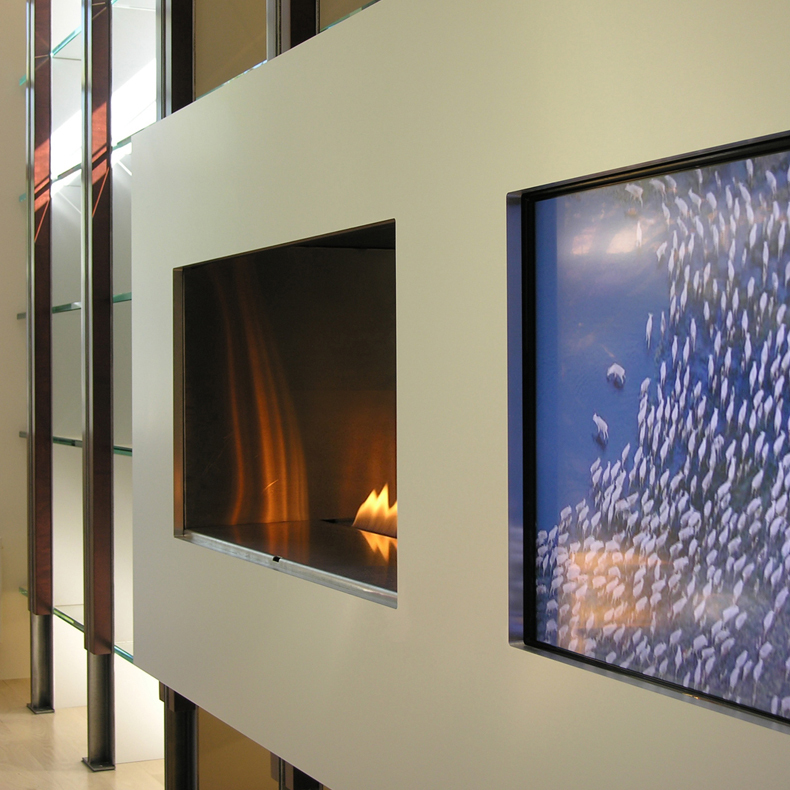 The fireplace and television surround is composed of a honeycomb aluminum covered panel, which can be lifted off of the steel frame that holds the fireplace and TV suspended in place. 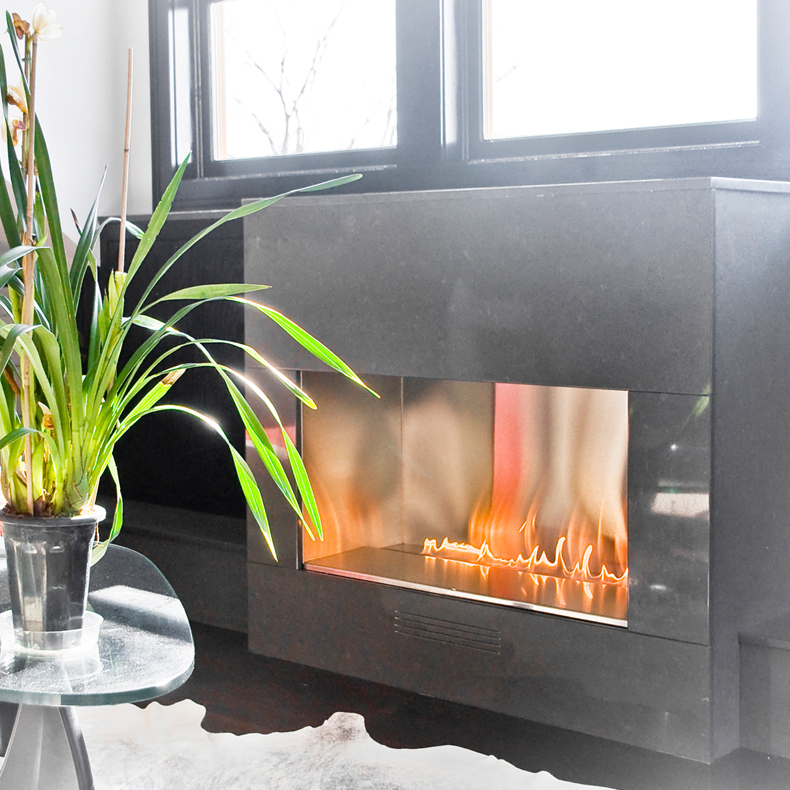 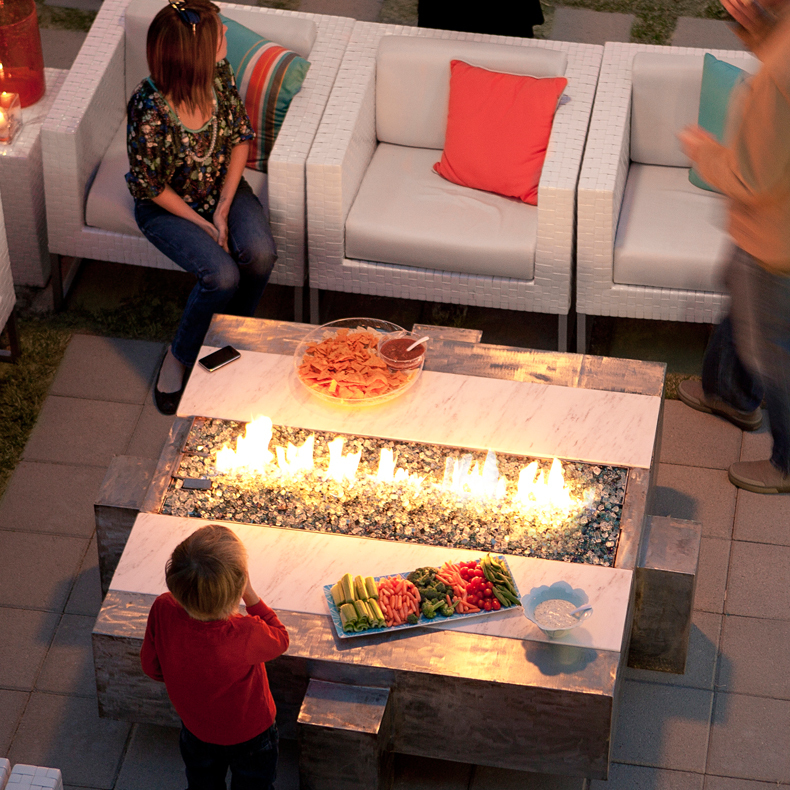 The Spark Vent Free 3ft Model is clean, odorless and does not require glass doors- making the fire even more intimate. 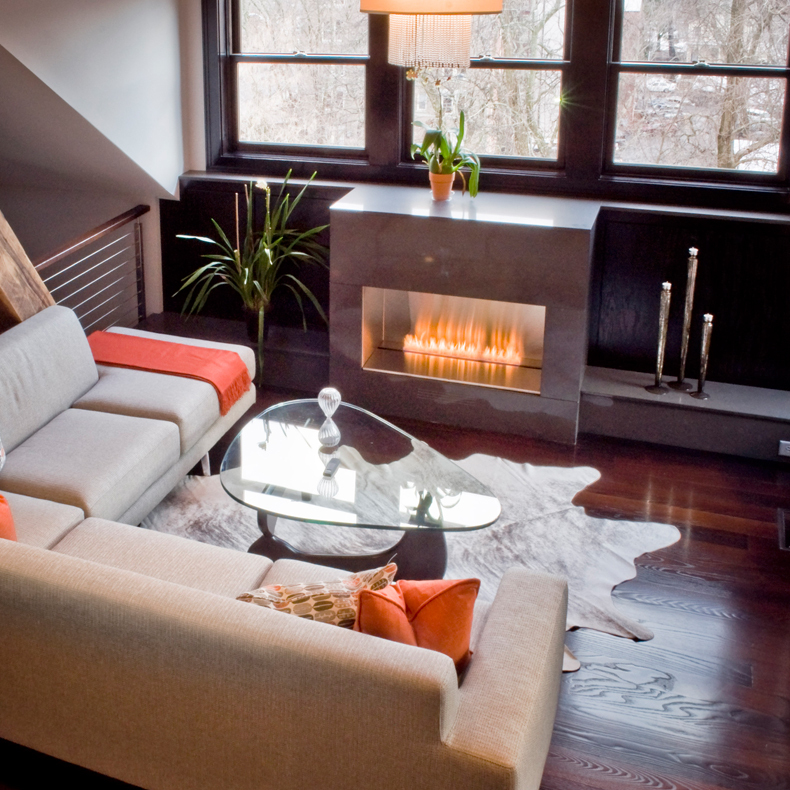 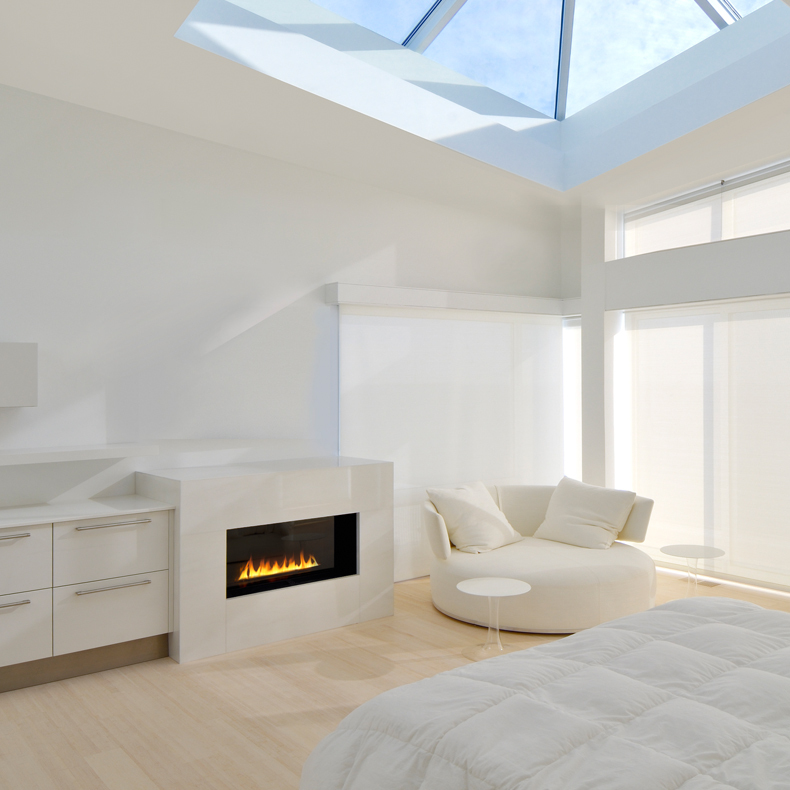 This fireplace is a perfect accouterment to a stunning modern loft conversion. 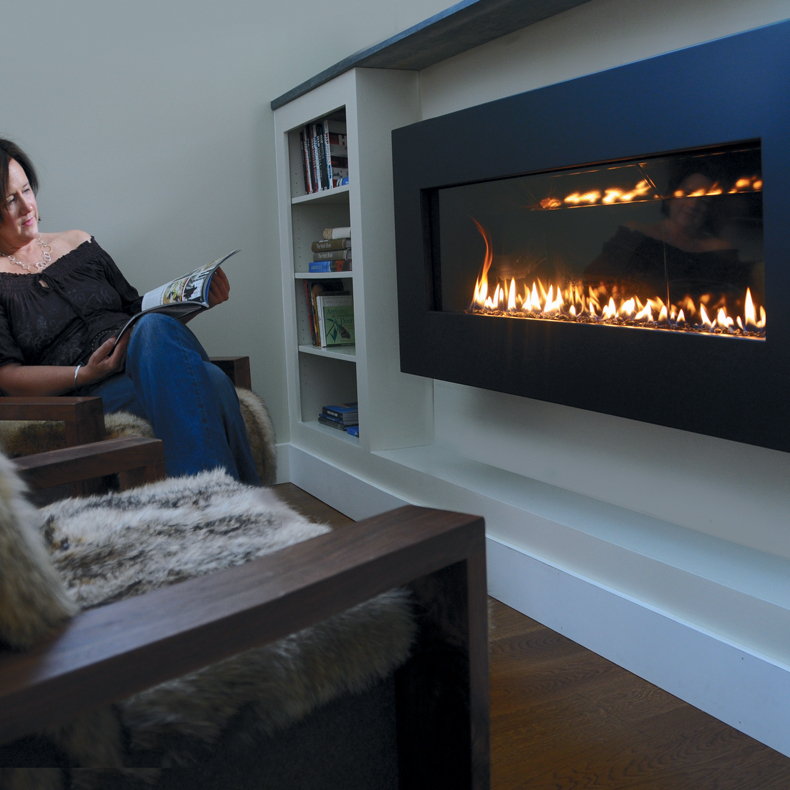 The vent free unit is also ideal for those with limited space. 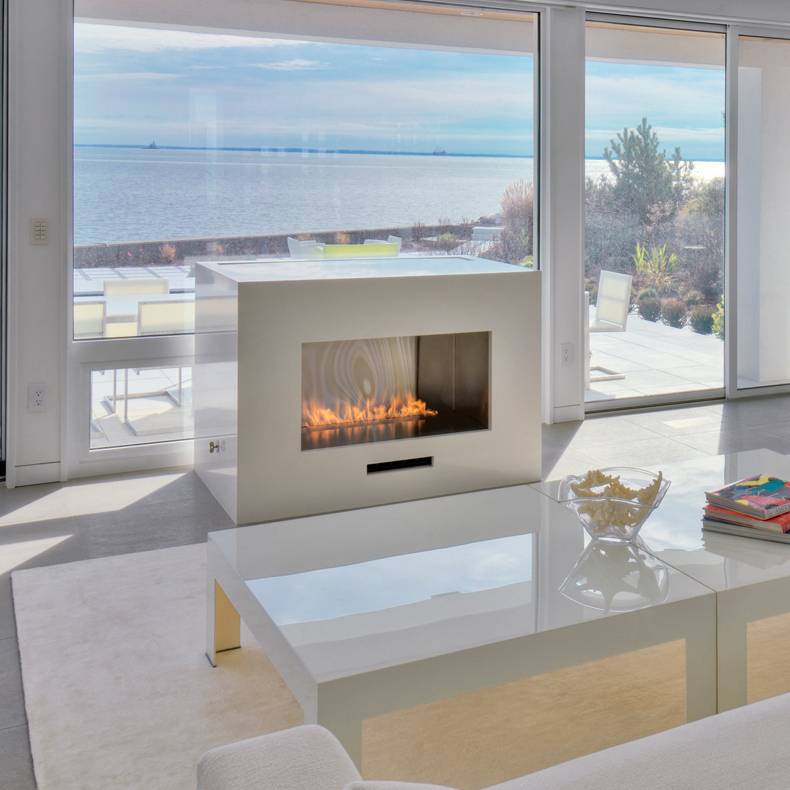 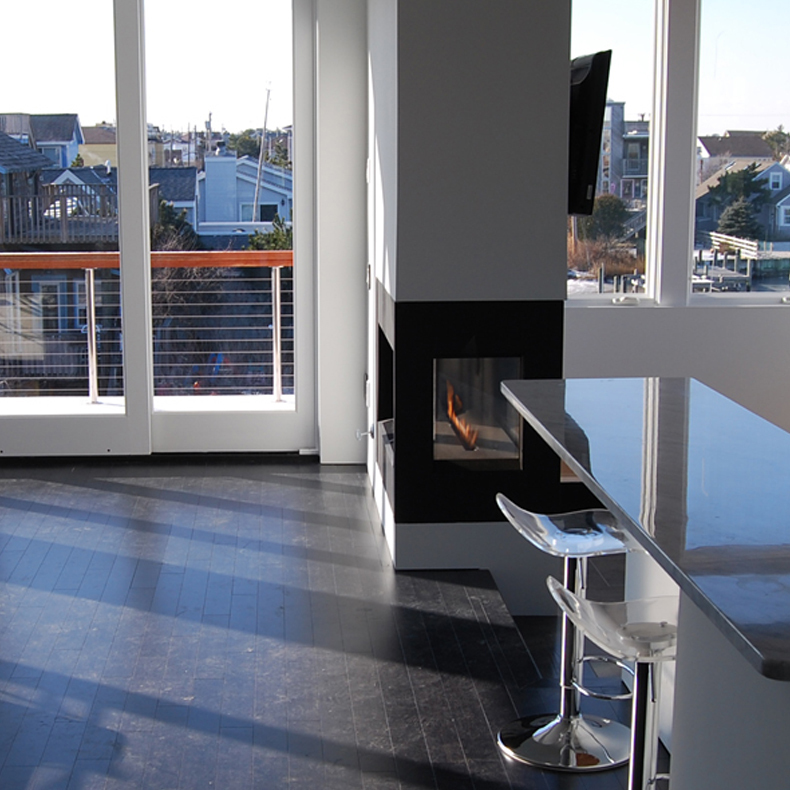 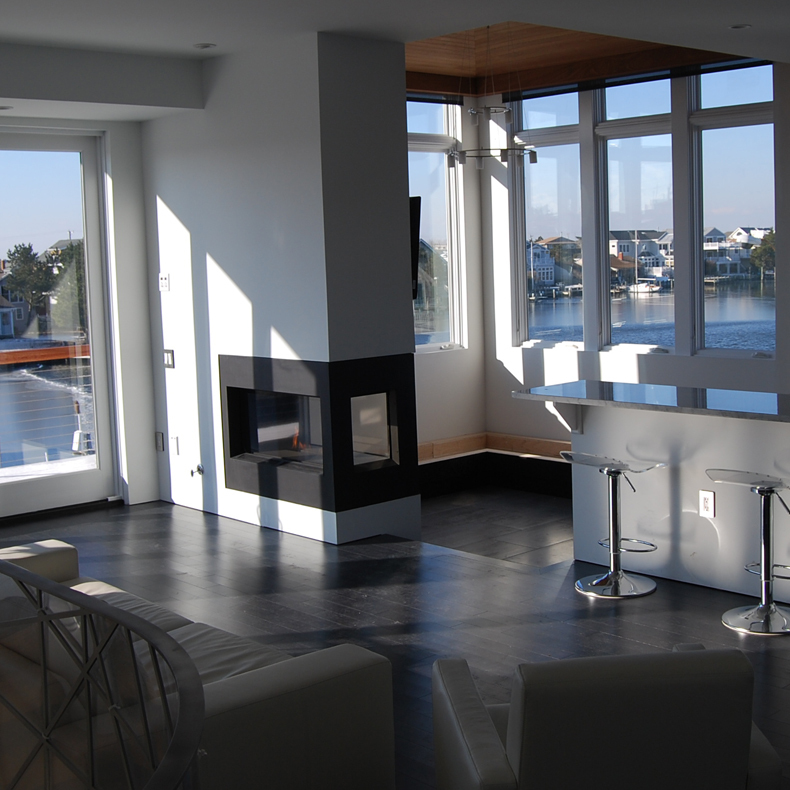 The Spark Vent Free 3ft Model adds a sleek and sophisticated presence in this living room overlooking Fairfield Beach.